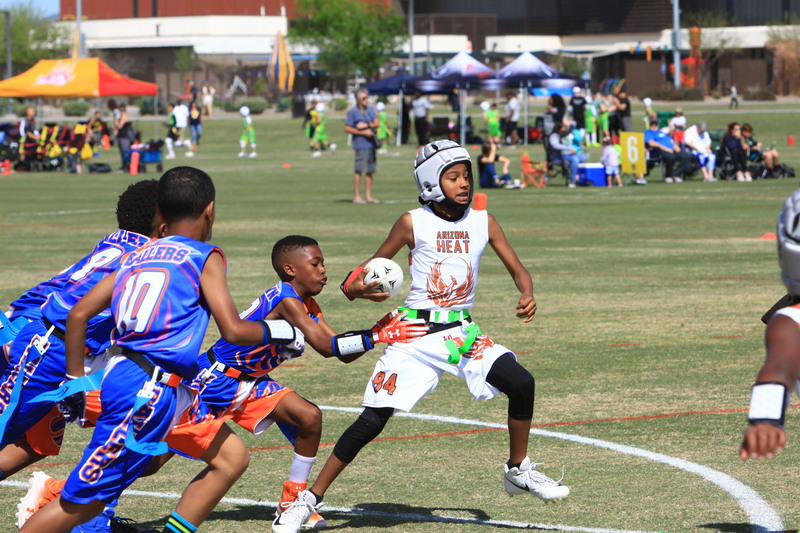 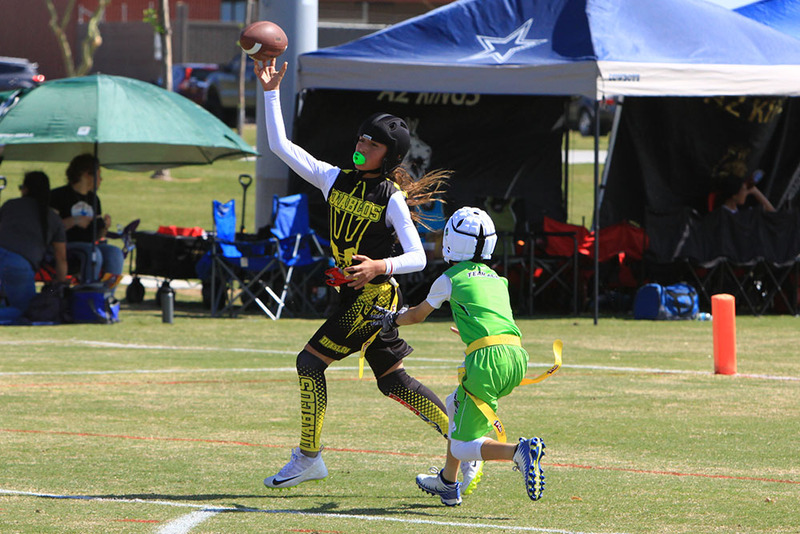 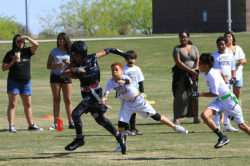 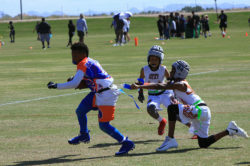 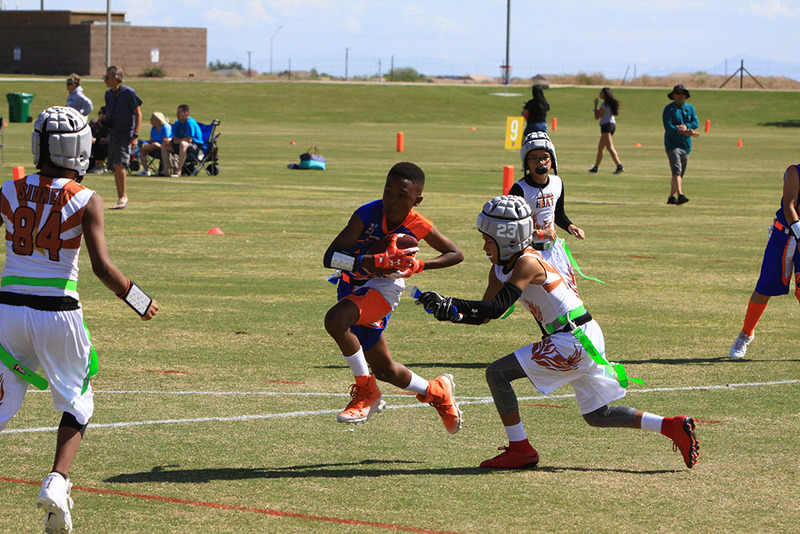 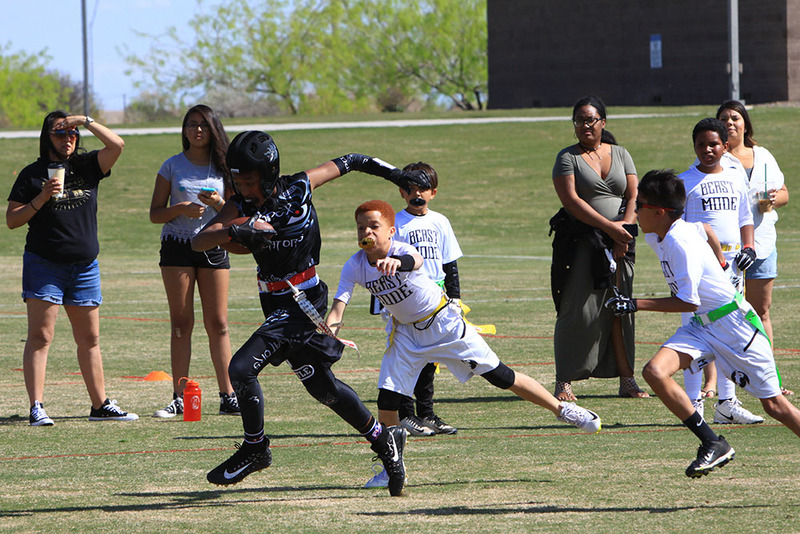 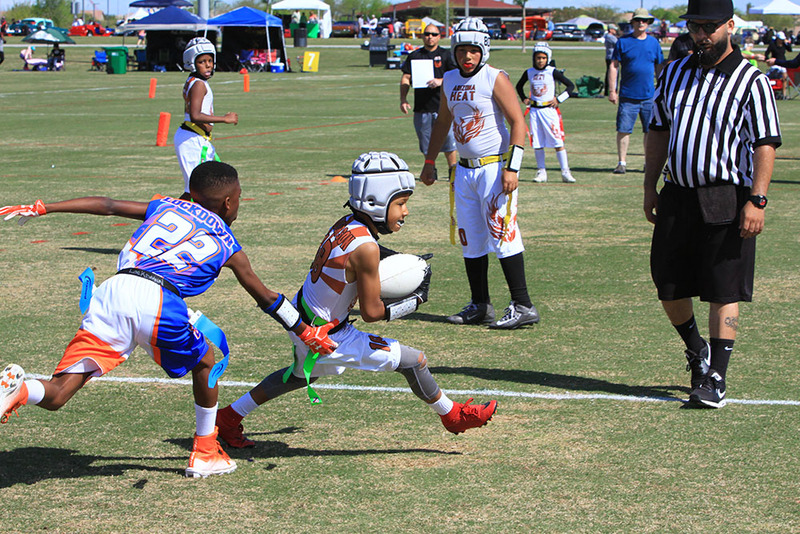 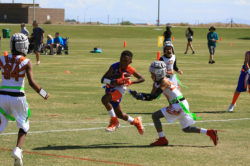 Home Tags Articles tagged with "Copper Sky"
About 1,000 flag football players participated in the Southwest Showdown NFL Flag Football Tournament in Copper Sky Regional Park. 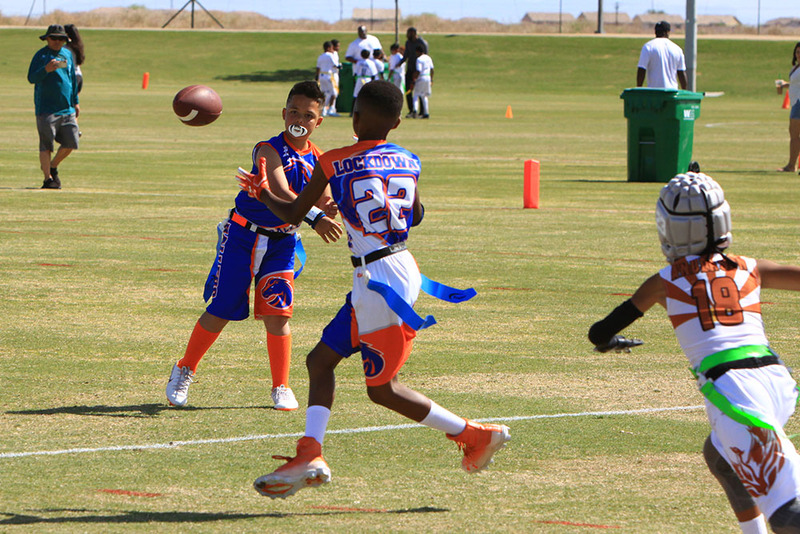 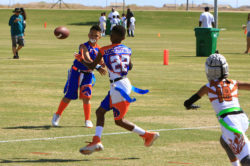 Participants came from across Arizona and the western United States to expand their football skills. 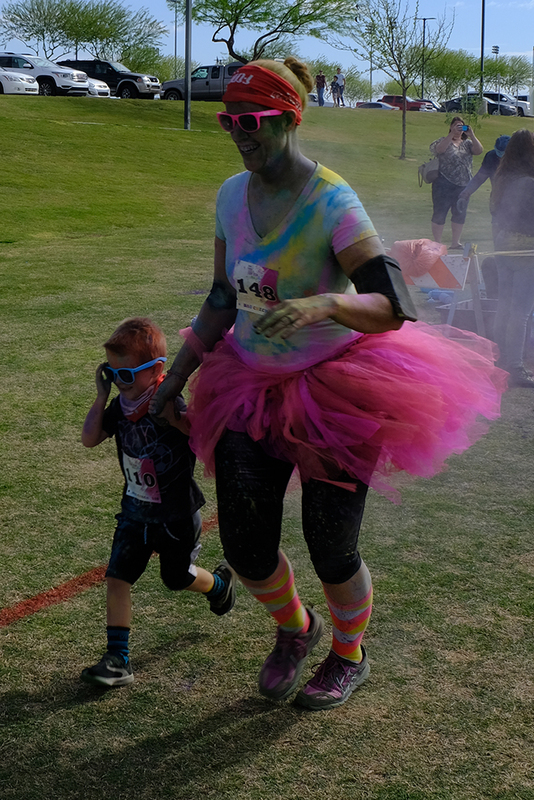 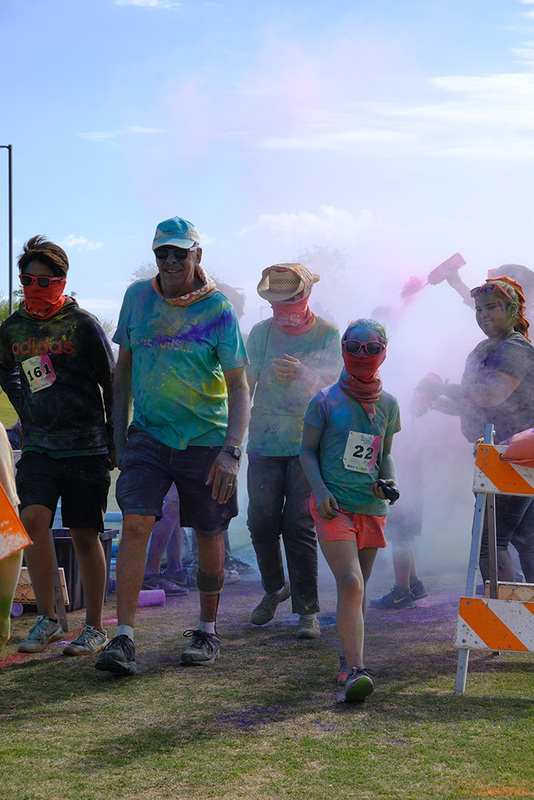 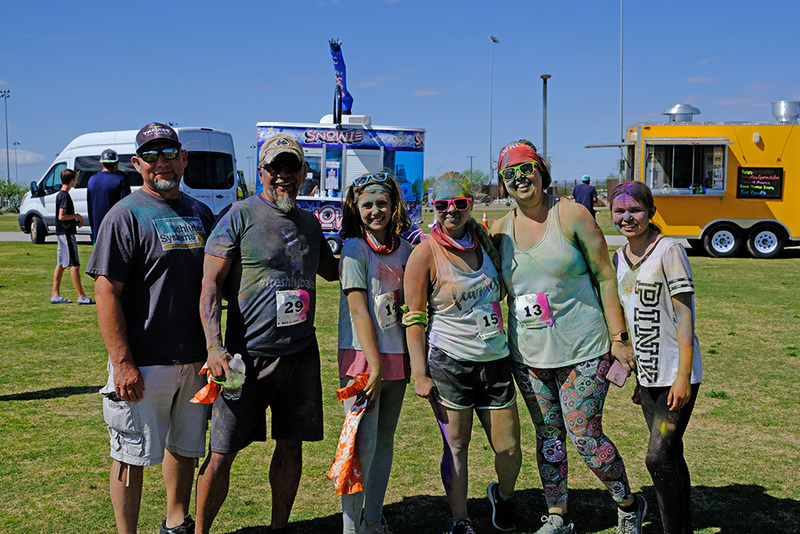 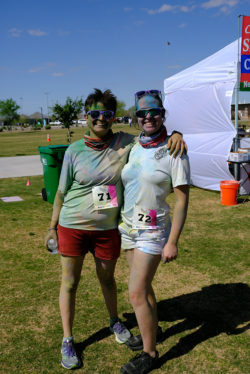 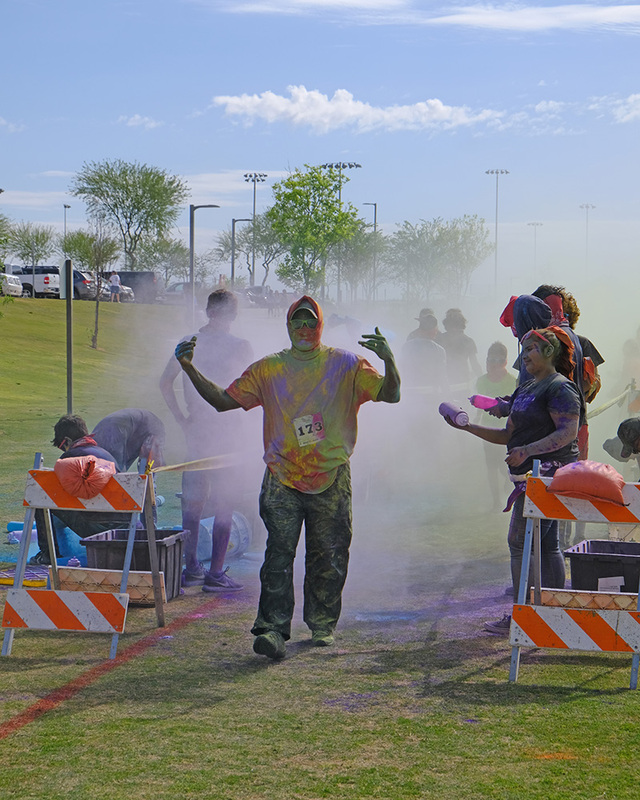 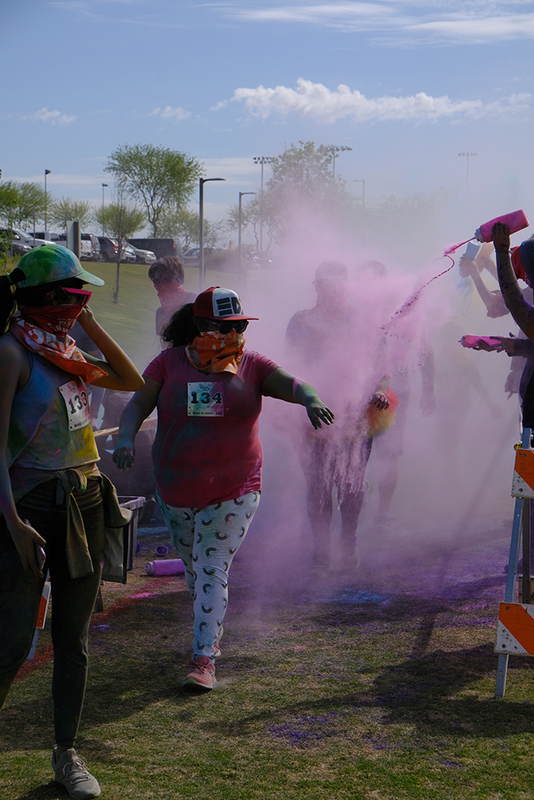 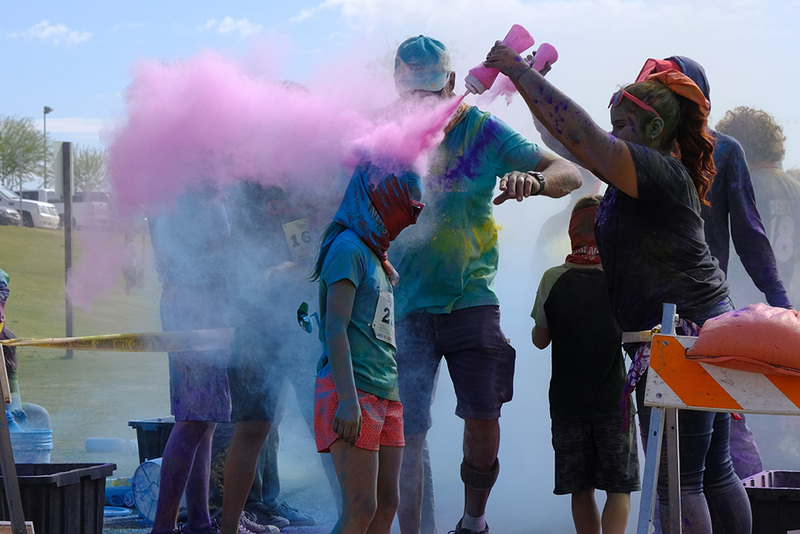 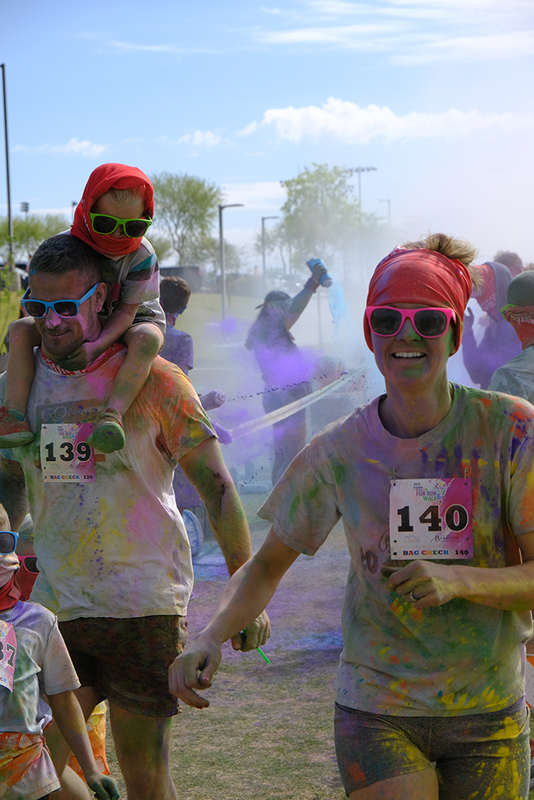 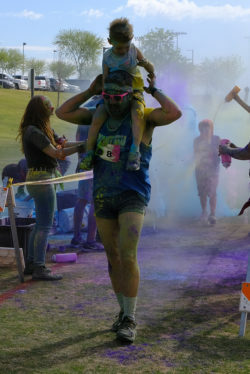 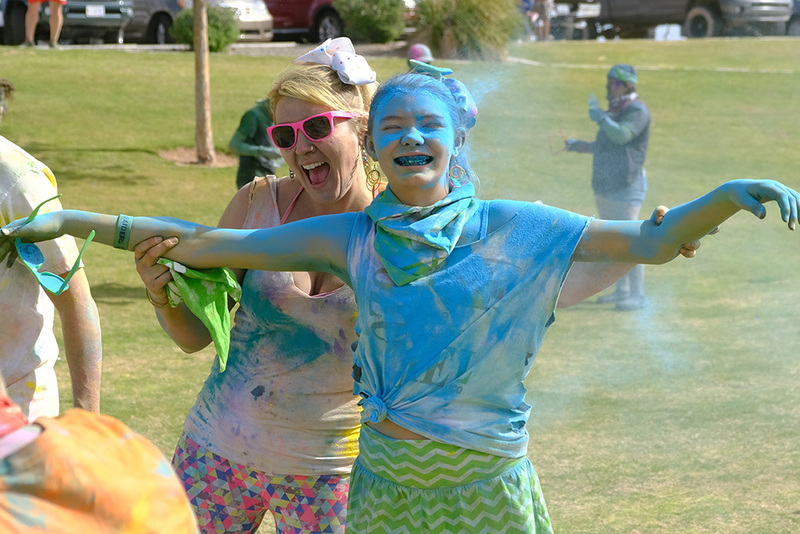 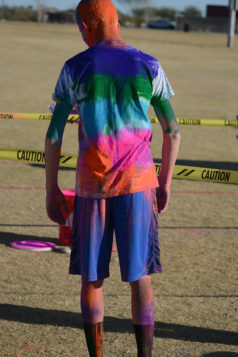 The City of Maricopa’s annual Copa Color Run brought in participants of all ages to run or walk the color-laden event at Copper Sky Regional Park on Saturday. 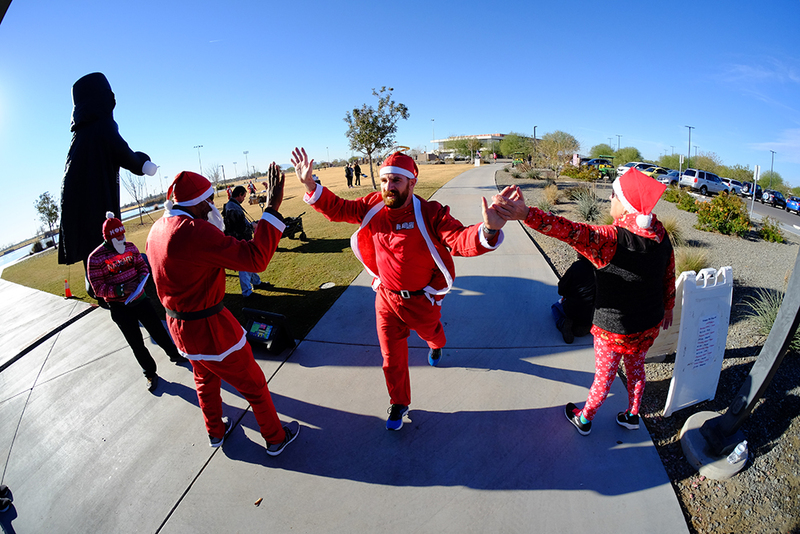 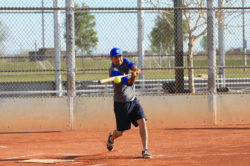 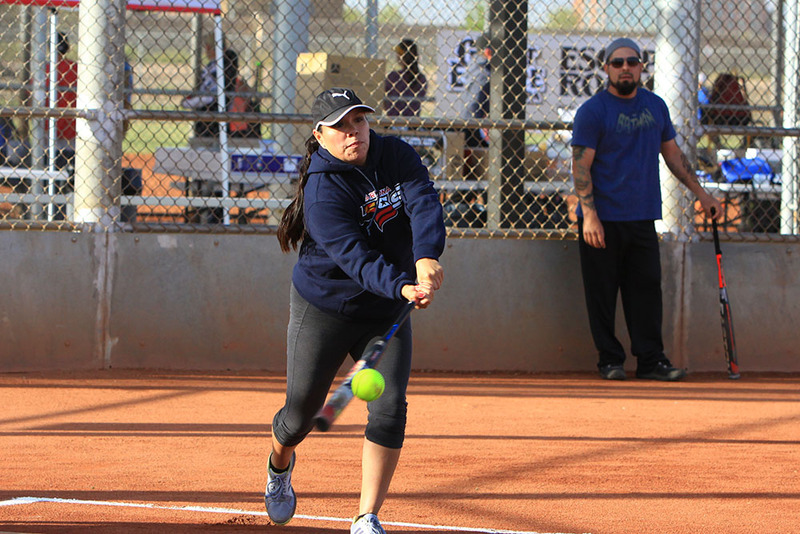 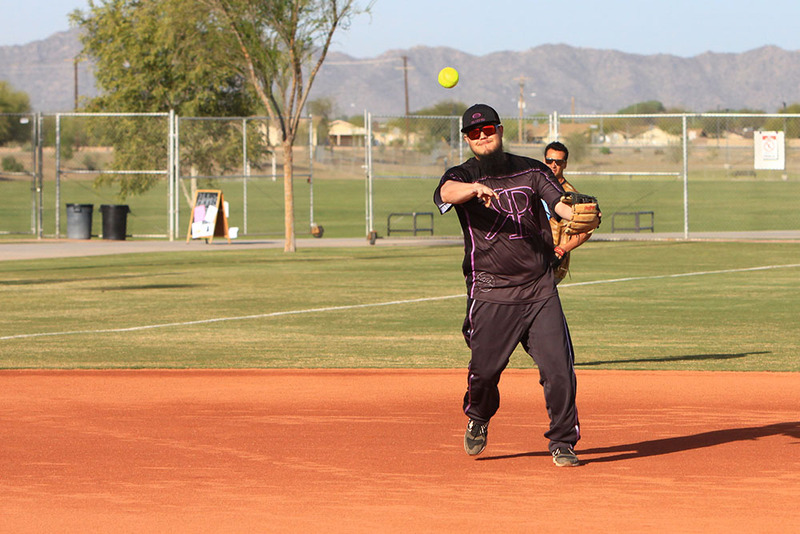 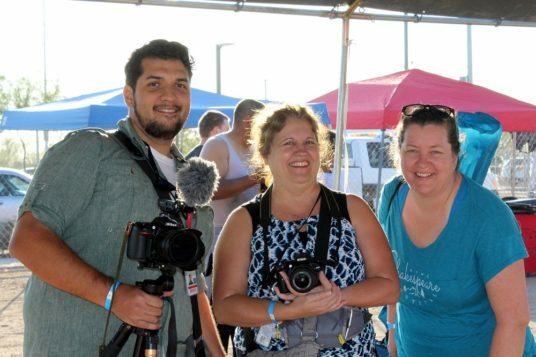 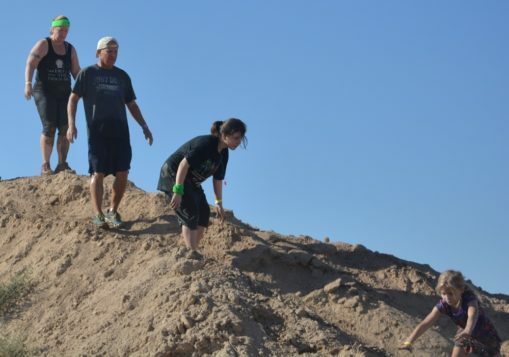 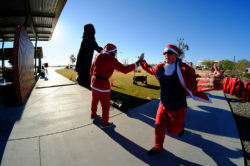 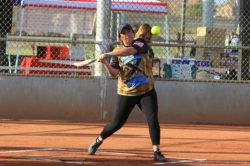 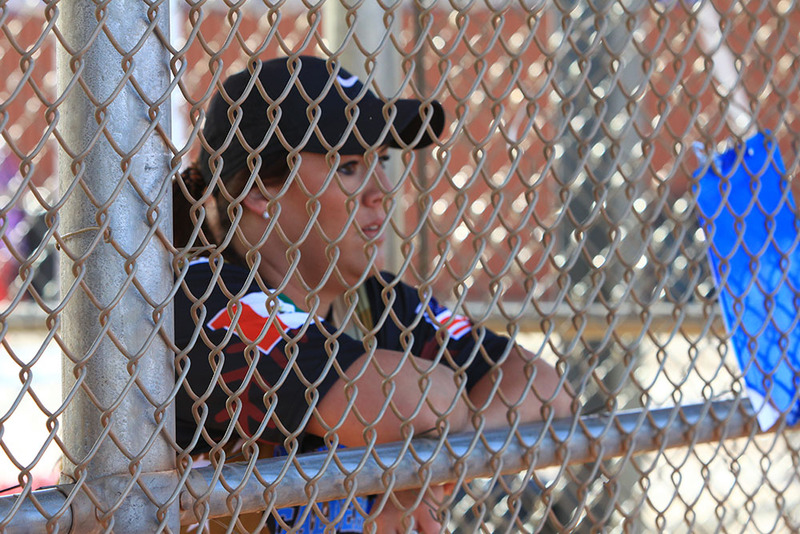 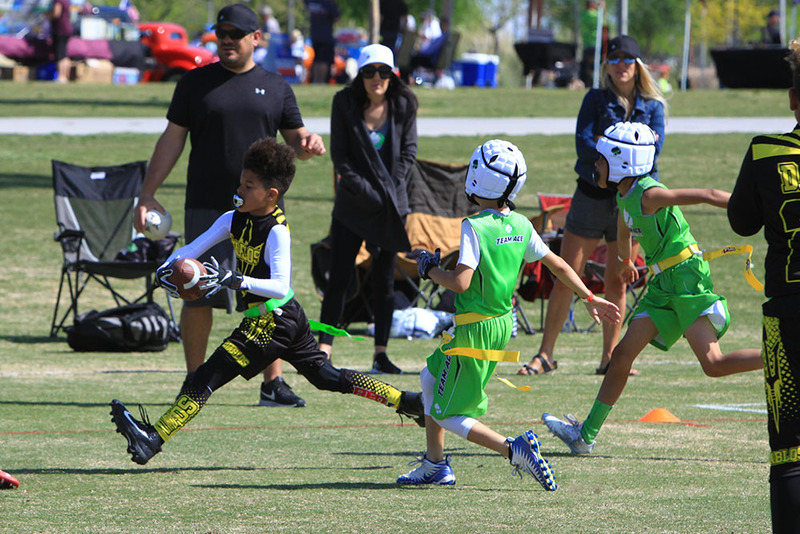 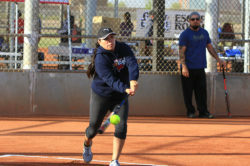 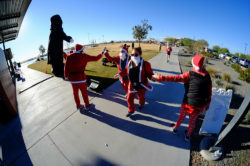 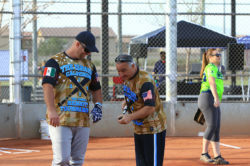 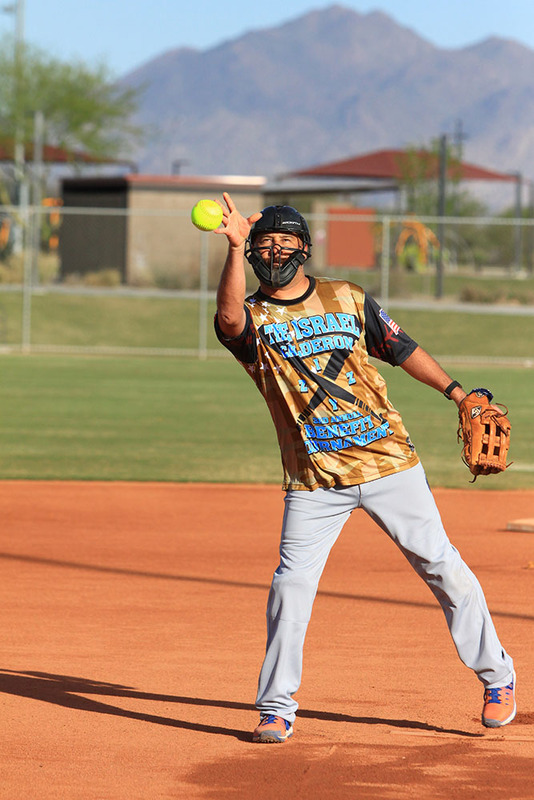 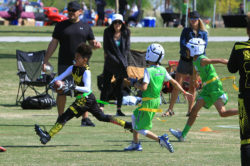 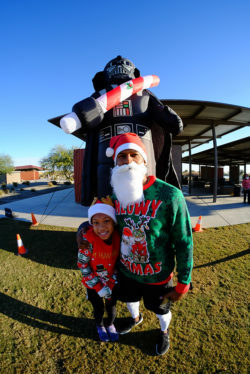 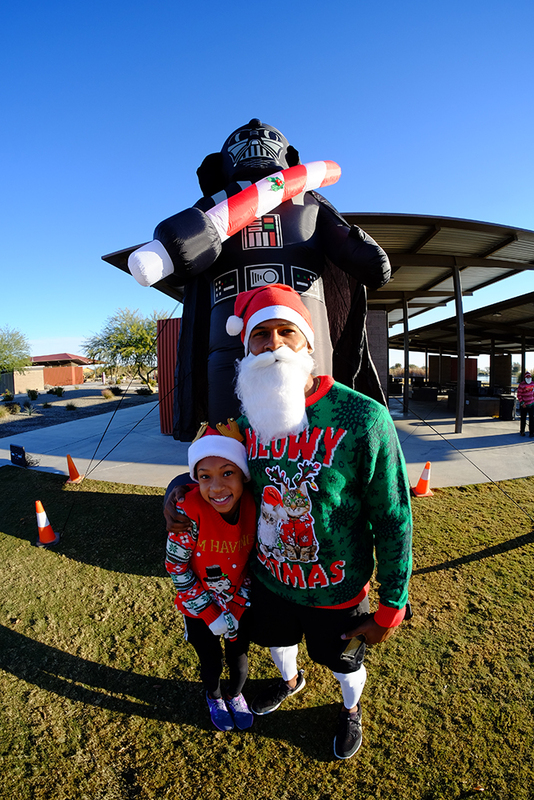 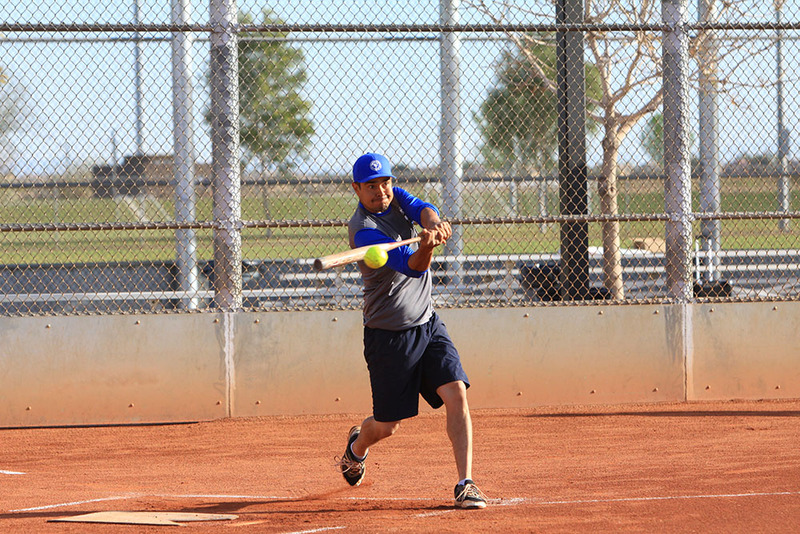 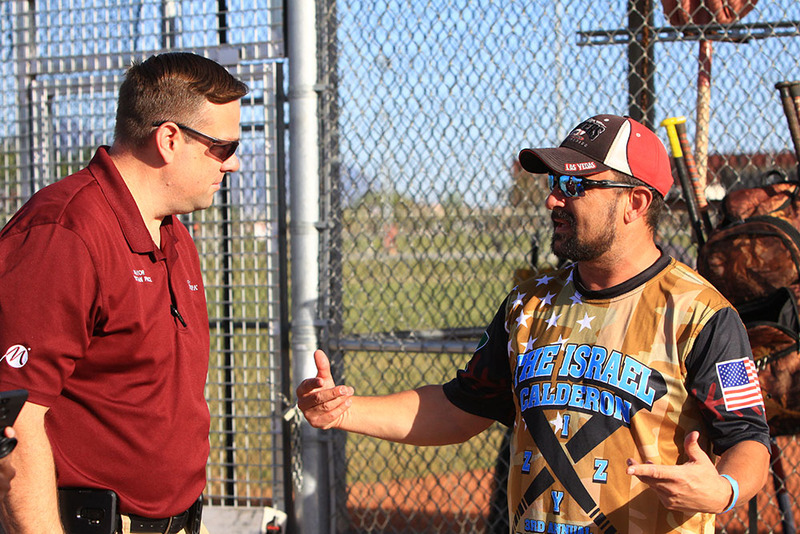 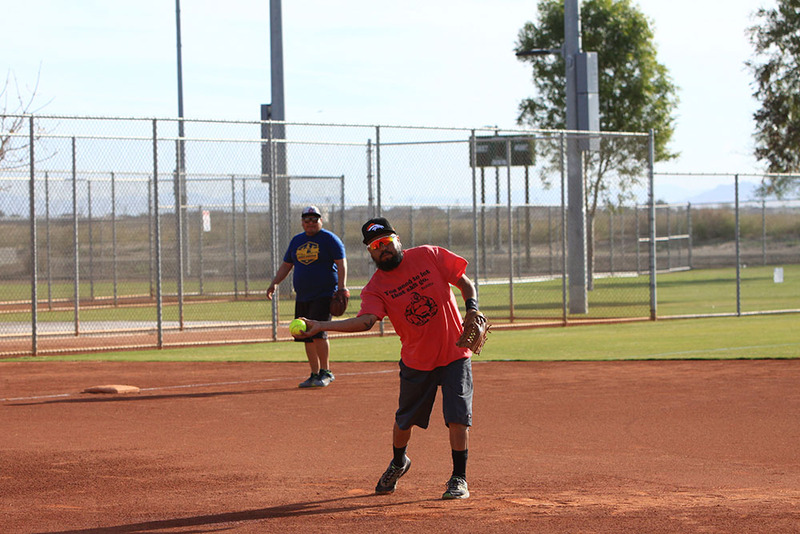 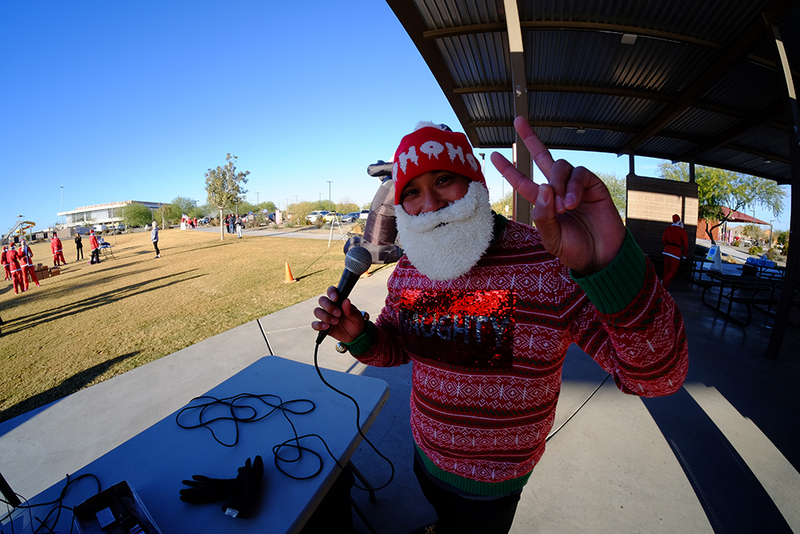 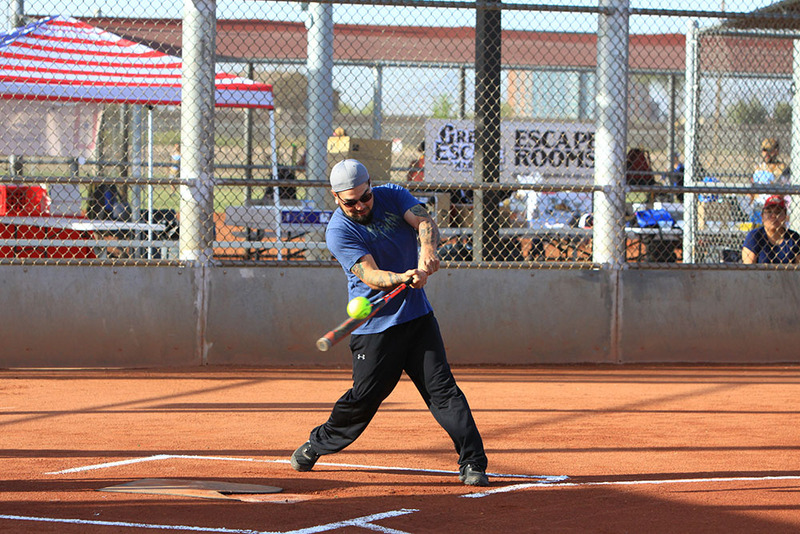 A total of 12 teams took to the fields at Copper Sky Park in Maricopa to raise money and assist the family of Israel “Izzy” Calderon, who was seriously injured in a car wreck on State Route 347 a few years ago. 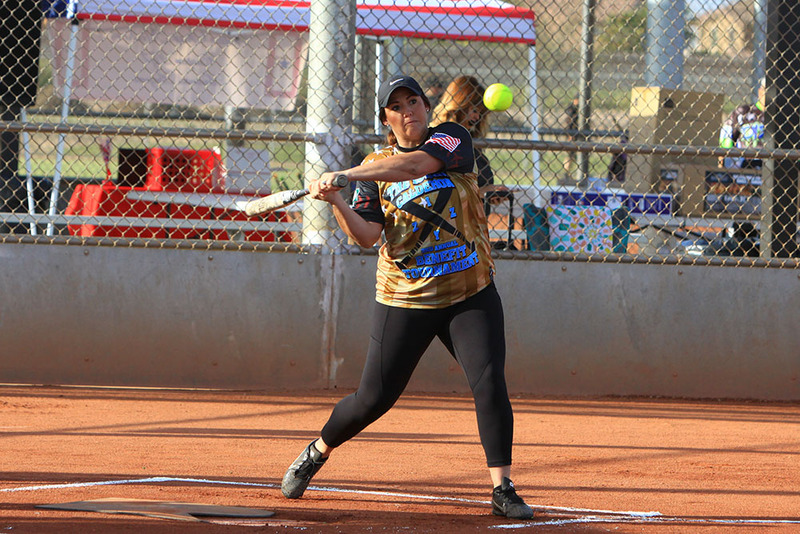 The 2019 Israel “Izzy” Calderon third annual benefit softball tournament raises funds for the family. 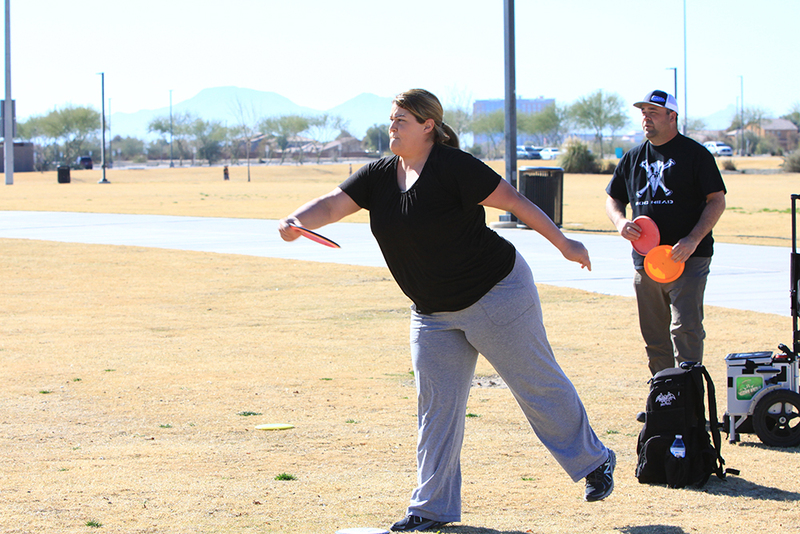 This year was action packed on Saturday, as the first pitch was thrown by former mayor Kelly Anderson shortly before 8 a.m. and action continued through the day and into the evening, ending about 9 p.m.
Nearly 200 players from all over the United States came to Maricopa over the weekend for the Maricopa Disc Golf Open. Anthony Barela of Mesa won the Open Division, throwing 24 under par during the weekend. 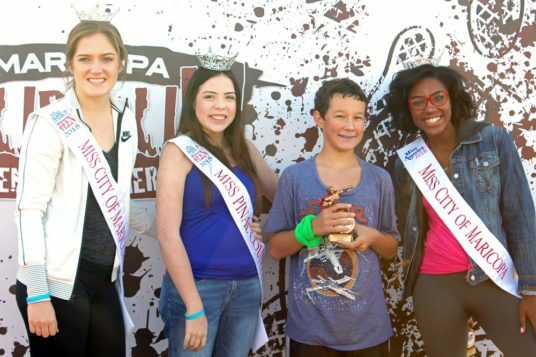 Austin Hannum of Perry, Oklahoma, was second at 23 under par over the two-day tournament, which was played at Copper Sky and Maricopa Meadows. 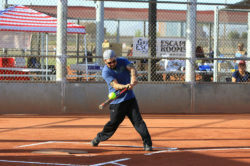 Paul Ulibarri of Show Low was third overall at 19 under par and first in the 40+ age division at 13 under par. Catrina Allen of Pipestone, Minnesota, won the woman’s open title at 5 under par, followed by Callie McMorran of Arlington, Tennessee, at 6 over and Jennifer Allen of Gilbert at 8 over. 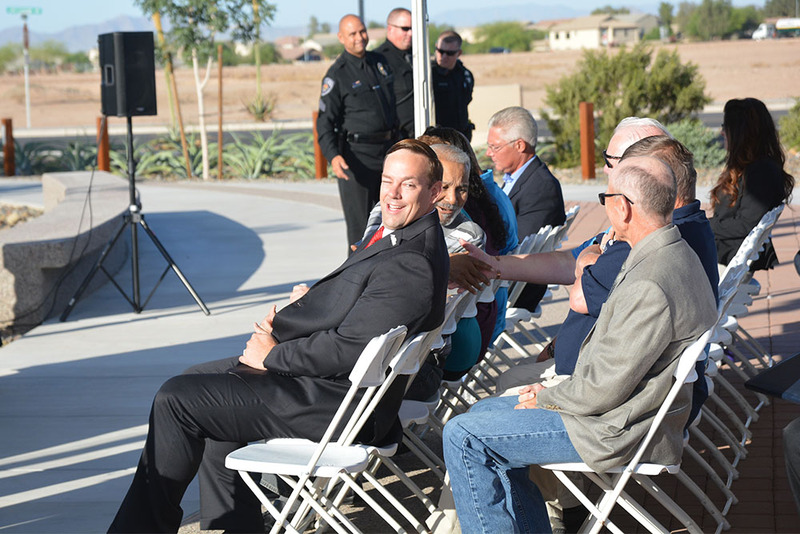 The City of Maricopa wants to make Copper Sky Multigenerational Center 75 percent self-sufficient. 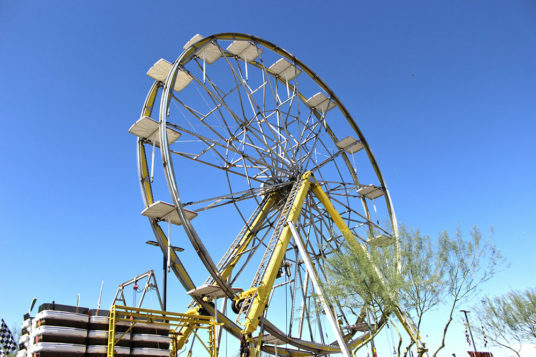 Currently, it is at 65 percent sustainability. 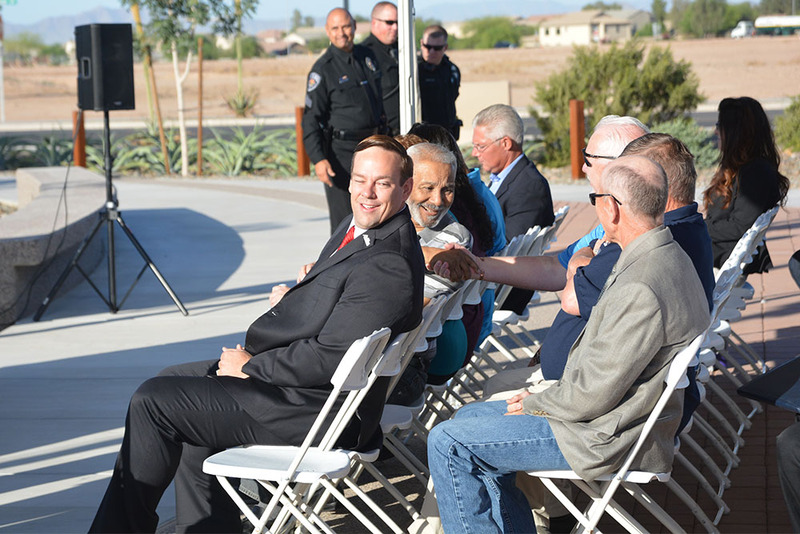 Nathan Ullyot, Maricopa’s director of Community Services, explained a proposed fee change for Copper Sky to the media Tuesday. 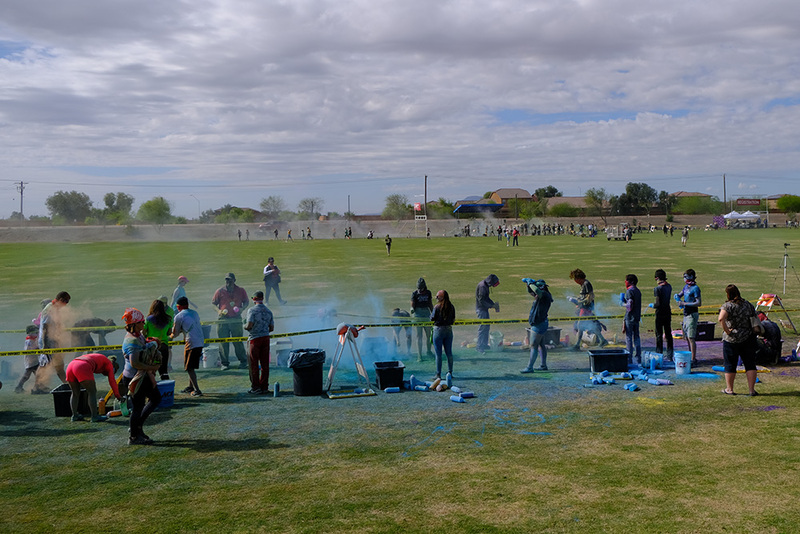 Ullyot said there has been a lot of discussion, mostly on social media, about the city’s proposed fee changes that will be presented to the city council later this month. 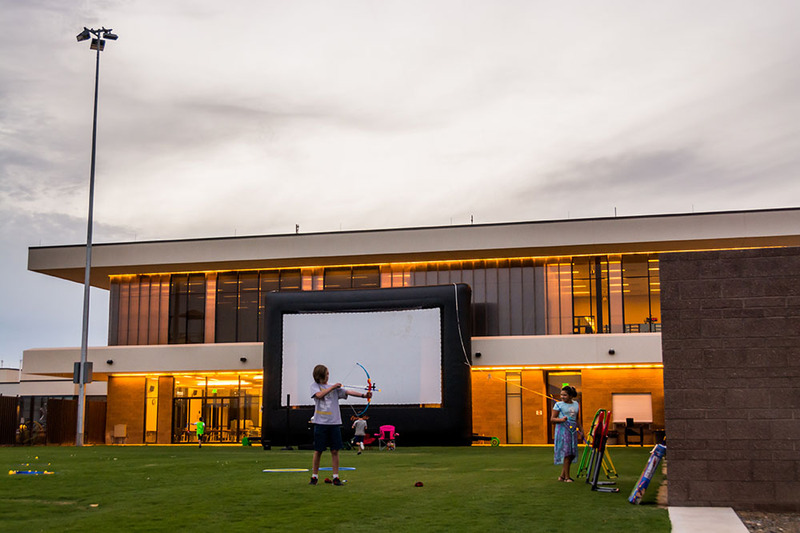 Ullyot said the new fee schedule will allow flexibility for members and provide the city a more sustainable facility. 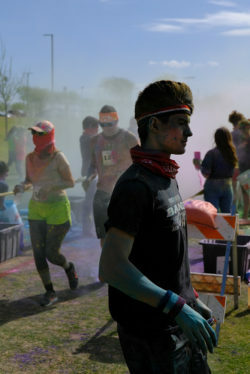 With all the changes in membership costs, Ullyot said the city is adding a scholarship program that gives discounts on memberships and classes based on income levels. 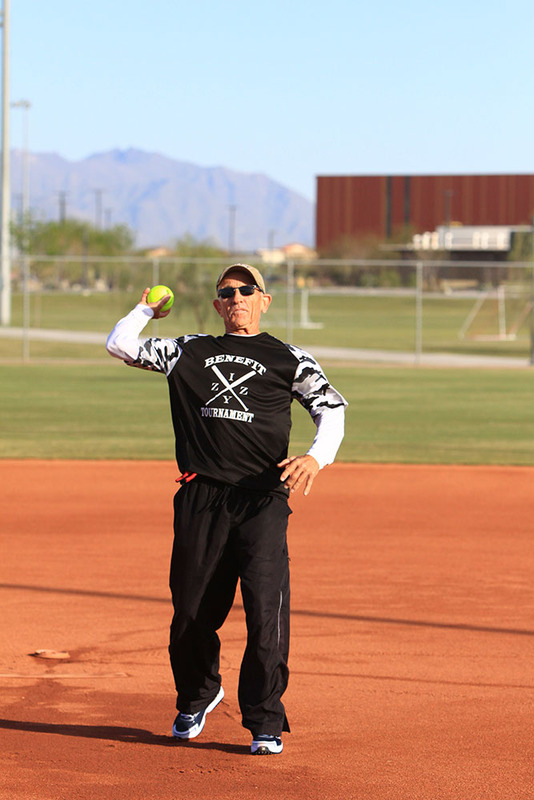 Seniors automatically get a 10-percent discount, according to Ullyot. 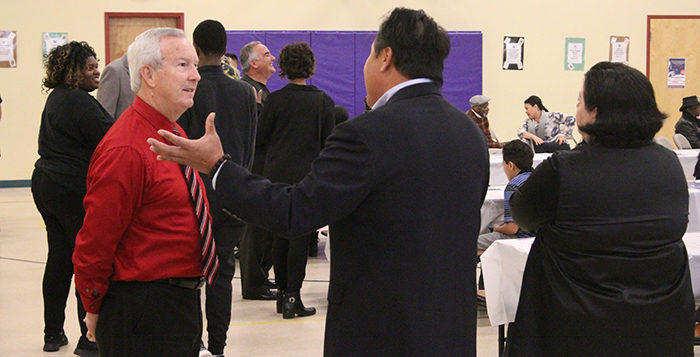 He said they can get further discounts based on scholarships that are also available. “Folks who are at need or in need can have a scholarship opportunity to Copper Sky and receive a 20 or 40 percent discount,” he said, adding the scholarships are based on federal poverty level guidelines. 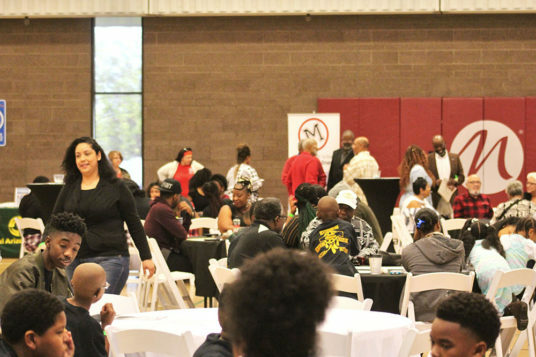 He said if seniors qualify for the scholarships and the regular senior discounts, they could save up to 50 percent off their memberships. 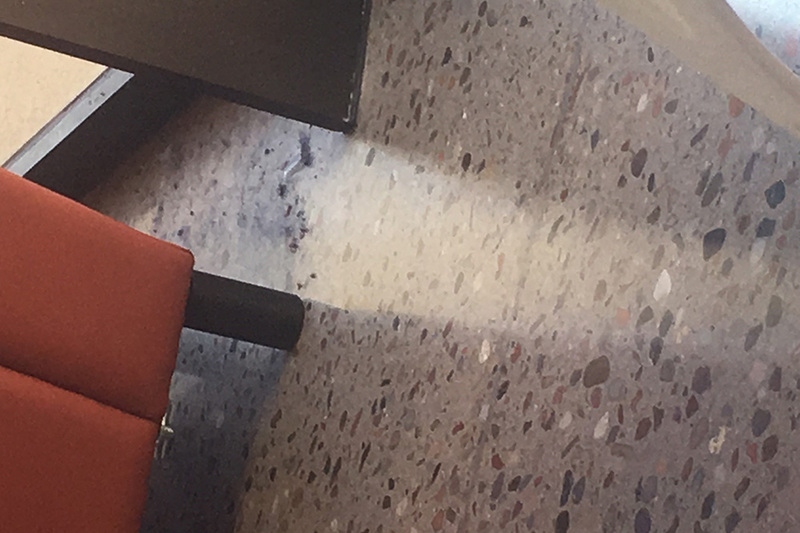 “This was done when they opened, and they haven’t changed it. 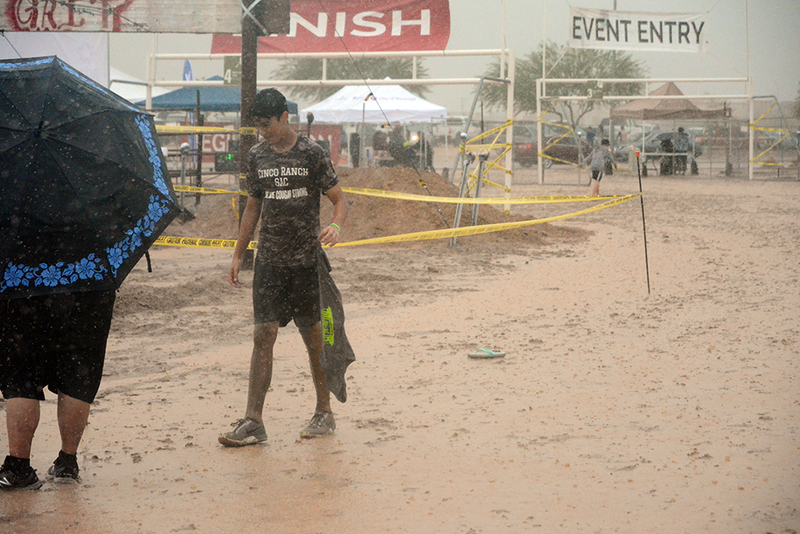 There was no policy to guide that. 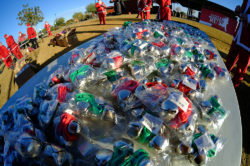 This policy changes that. 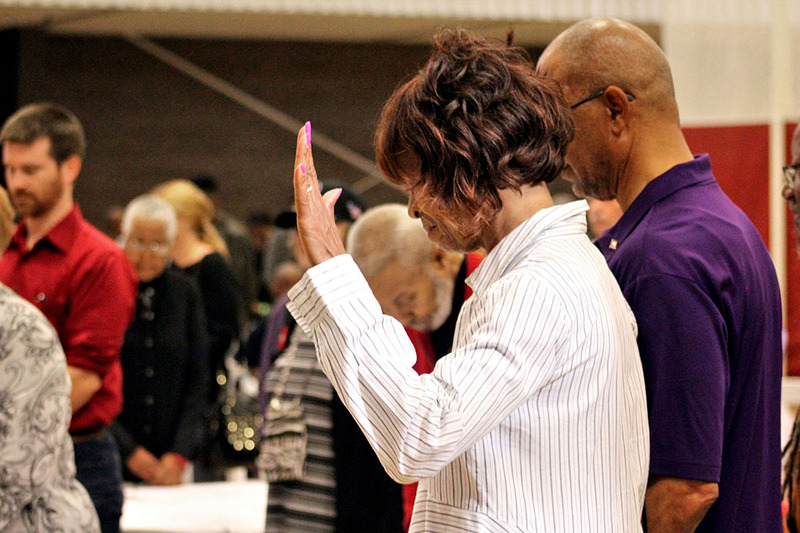 The seniors get an automatic 10 percent along with veterans. 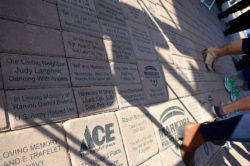 They can combine that with a scholarship,” he said. 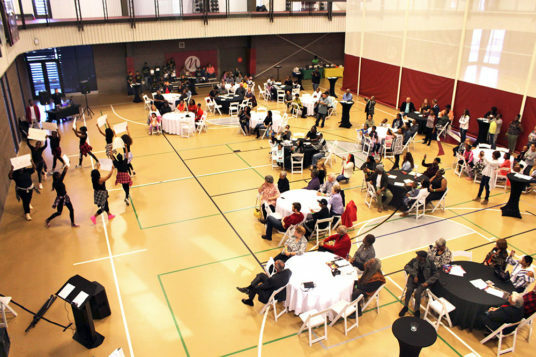 The scholarship program has two discount levels of 20 and 40 percent off membership costs. 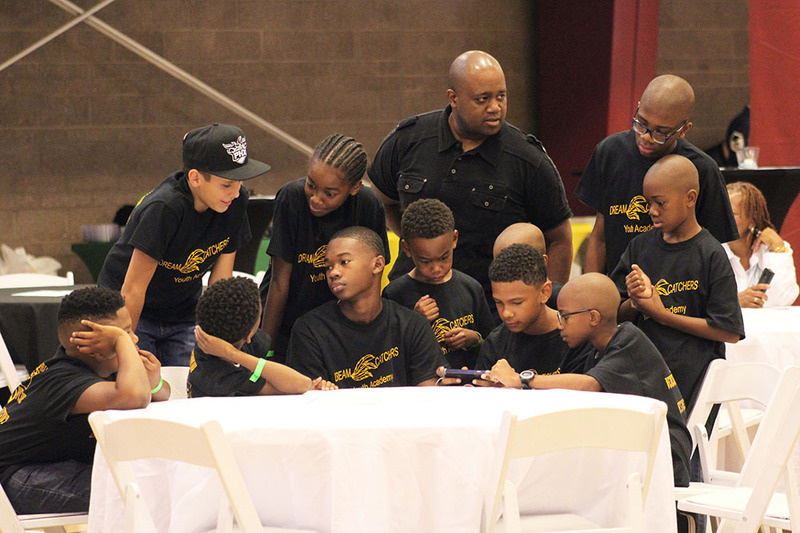 He said the application for a scholarship is simple and only one-page long. Members will also save with discounts on sports programs, like aquatics classes or enrichment classes, as part of their membership. 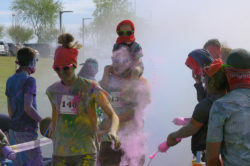 They also receive free event parking and fun-zone passes, according to Ullyot. 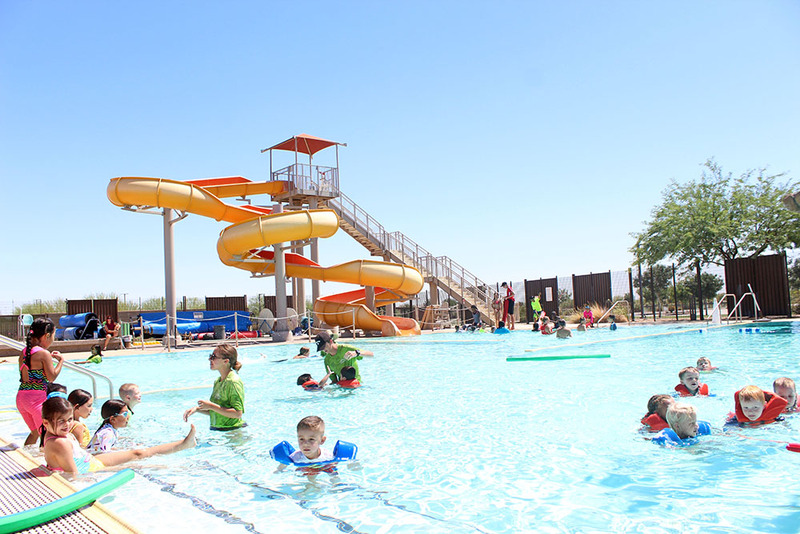 Members also receive 10 guest passes per year. Ullyot said Copper Sky has maintained its budget numbers in recent years but increasing costs, like the increase in minimum wage, is impacting the center’s bottom line. “We have maintained for the last four years. 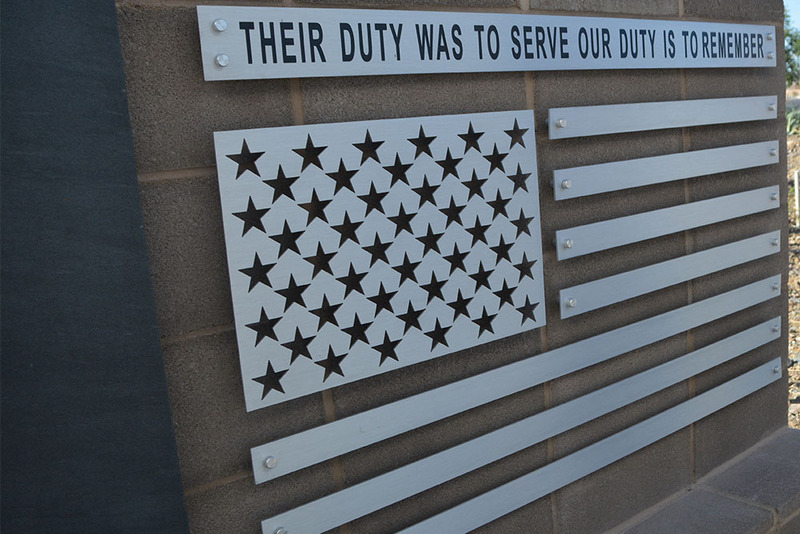 This has been on the minds of the council going forward. How do we hit a better sustainability model? … For a family we want to be the best fit financially and quality-wise,” Ullyot said. 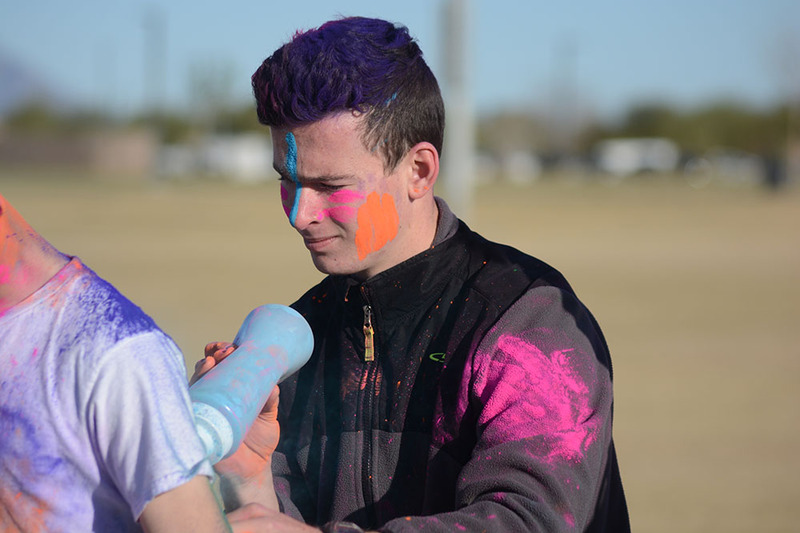 Ullyot said some seniors are upset about the new fee structures. 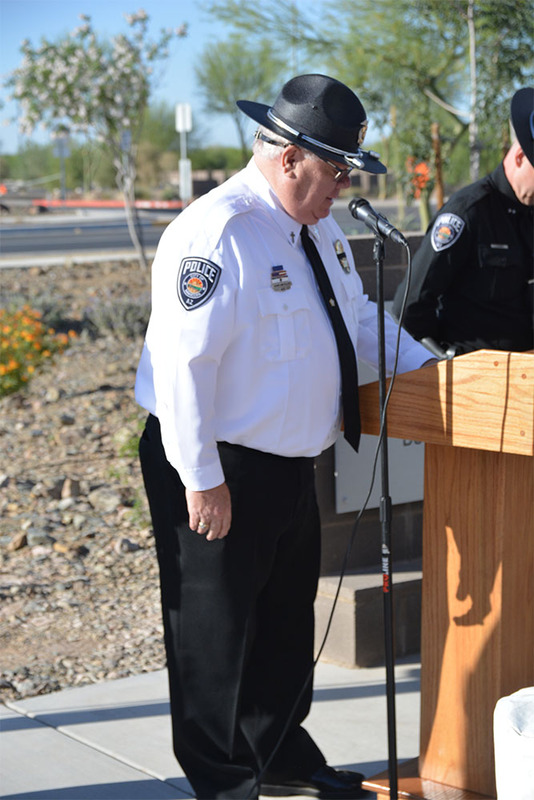 Ullyot said a lot of seniors want a space solely dedicated to them, but that is difficult because Copper Sky just doesn’t have the room. He said they are planning to increase services for seniors. 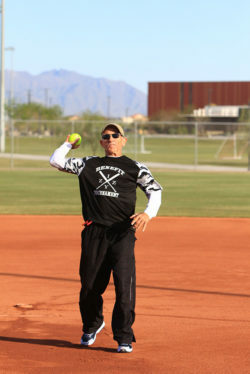 “I don’t think we’ve done enough for seniors in Copper Sky. 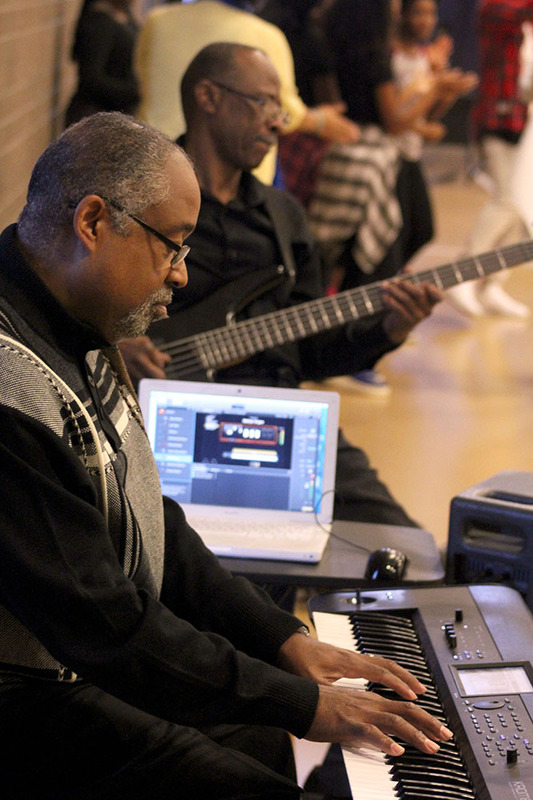 We are working to identify a couple days a week where we can do some senior fellowship programs. Provide coffee and doughnuts and things like that. 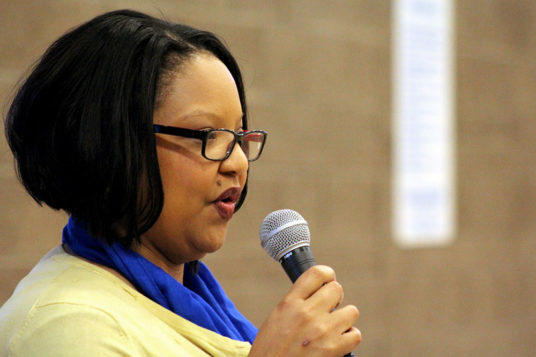 We are looking for feedback from seniors on things they want to do,” he said. Another thing that will change at Copper Sky will be rental fees that are equivalent to a sports complex level, not a community park level. 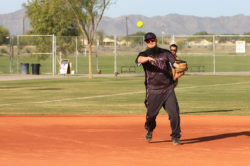 “When it comes to turf and fields Copper Sky is maintained at a sports complex level. 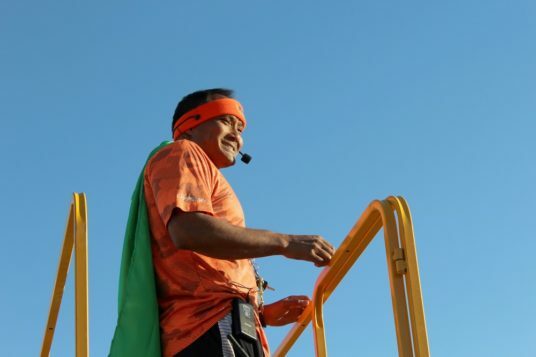 Which is going to mean more mowing, overseeing timelines and things like that. 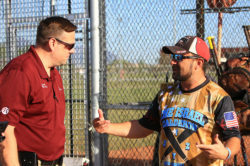 It is designed to attract outside tournaments to come into town,” Ullyot said. Ullyot said in the past rental fees at Copper Sky didn’t always cover costs incurred by the city for the event to take place, such as wages for lifeguards. 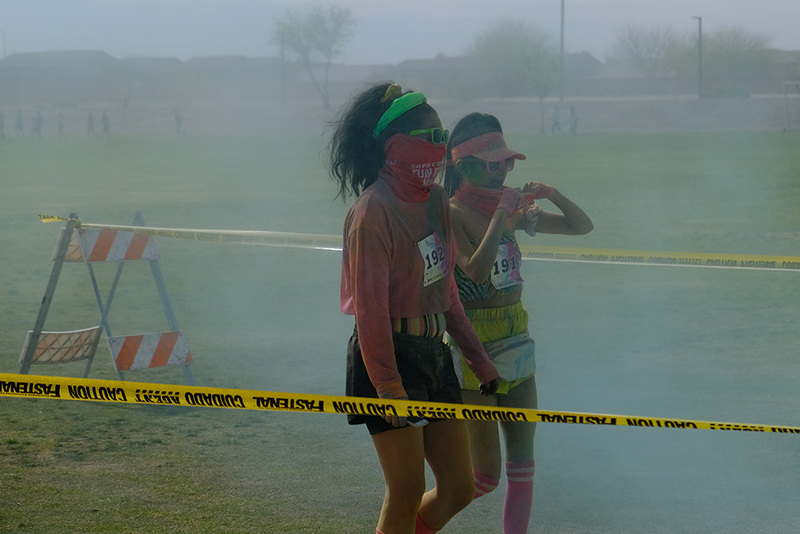 “We actually lost money. 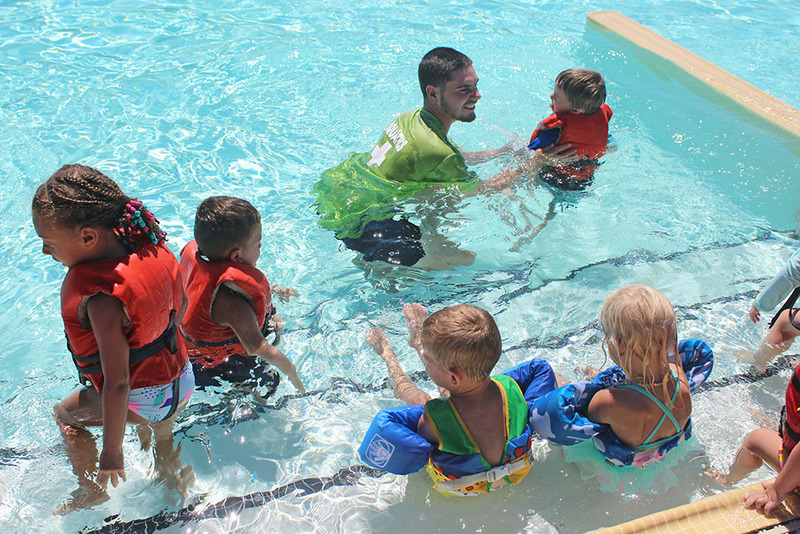 We didn’t charge enough for the amount of lifeguards it takes and the space that was being given. 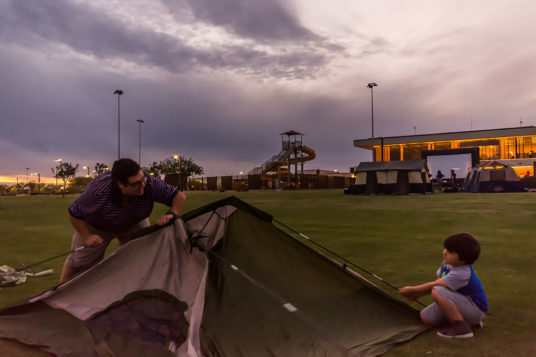 It was very difficult with a private rental, so it wasn’t cost effective,” he said. 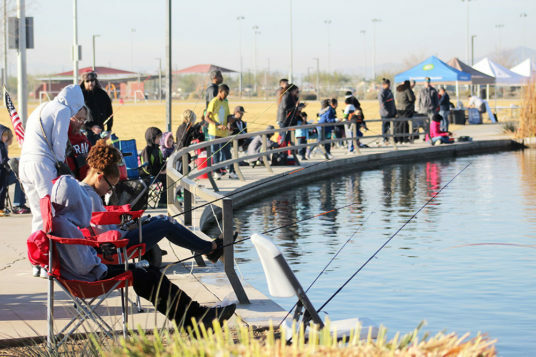 The city’s annual free fishing day is Jan. 12 with registration at 8 a.m. and fishing starting at 9 a.m. at Copper Sky Lake. 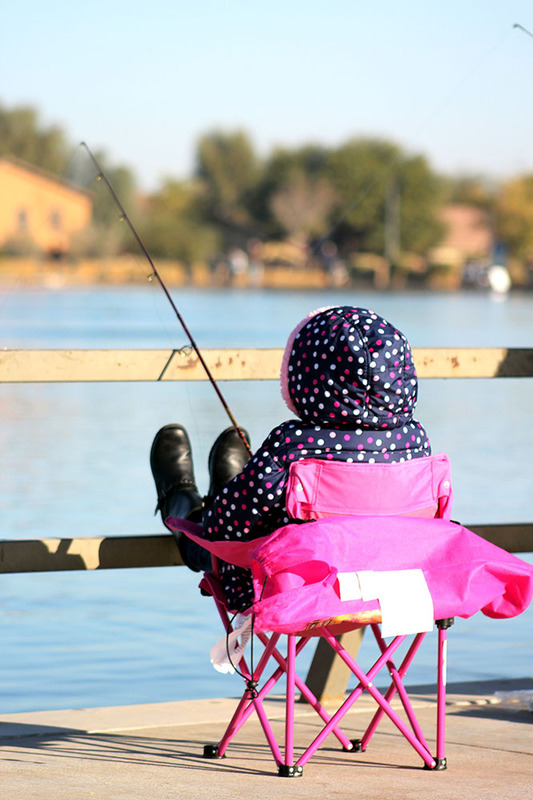 Fishing licenses are not required for those registered in the event, but fishing is readily available at both town ponds throughout the year. 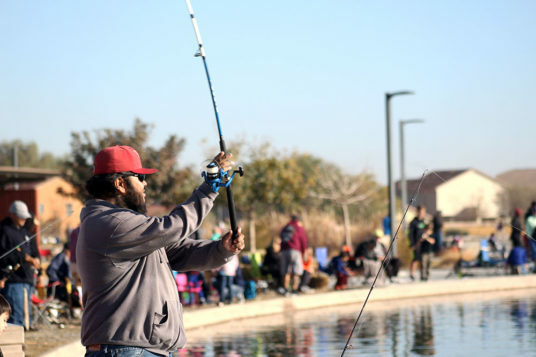 What kind of fish will you encounter at Copper Sky and Pacana Park? Bass are the most sought-after fish among U.S. anglers, according to U.S. 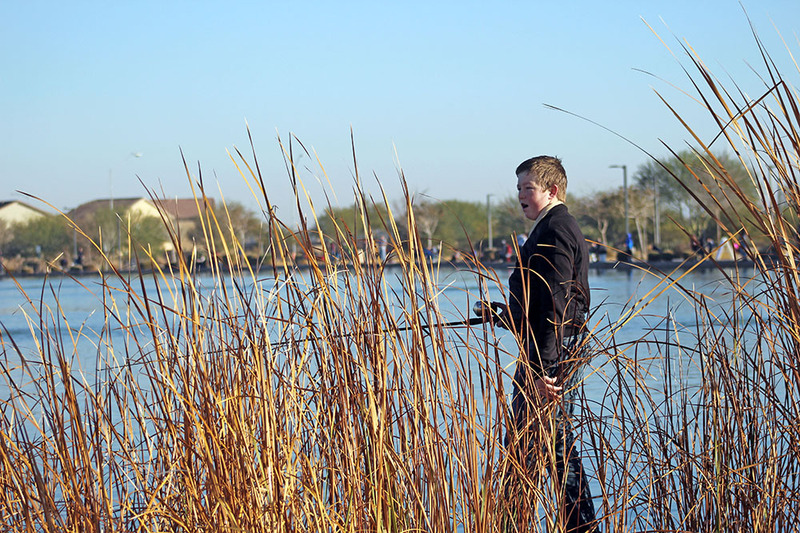 Fish & Wildlife, but they are getting harder to find in community waters. 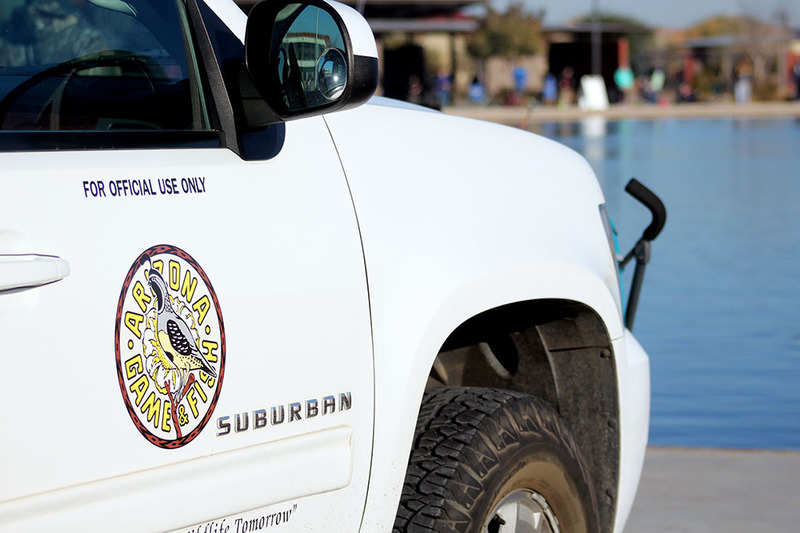 According to Arizona Game & Fish Department, largemouth bass in particular cost four times as much as trout and nearly six times as much as catfish to stock. AGFD tries to stock bass at least once a year, usually in spring. 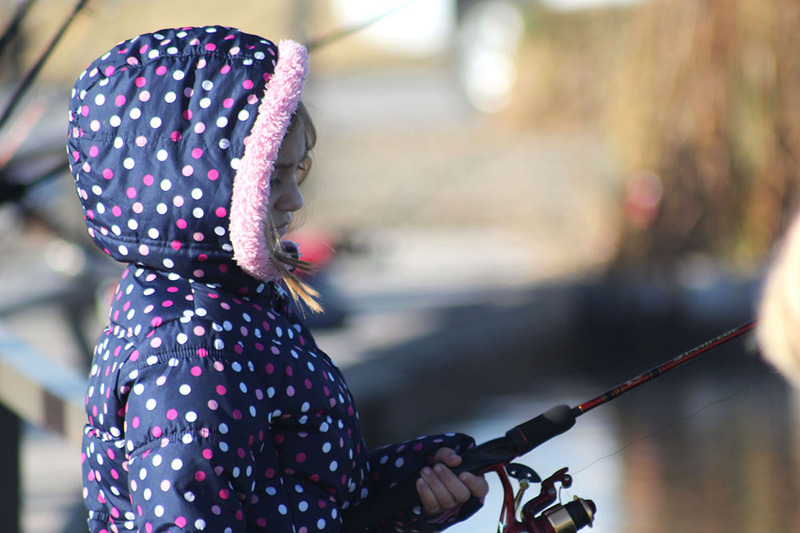 Bluegill, like black bass, are members of the sunfish family. They are often stocked in spring. Popular as pan fish for humans, they are also sought by largemouth bass and catfish looking for a nice dinner, so they tend to hide around underwater forms. 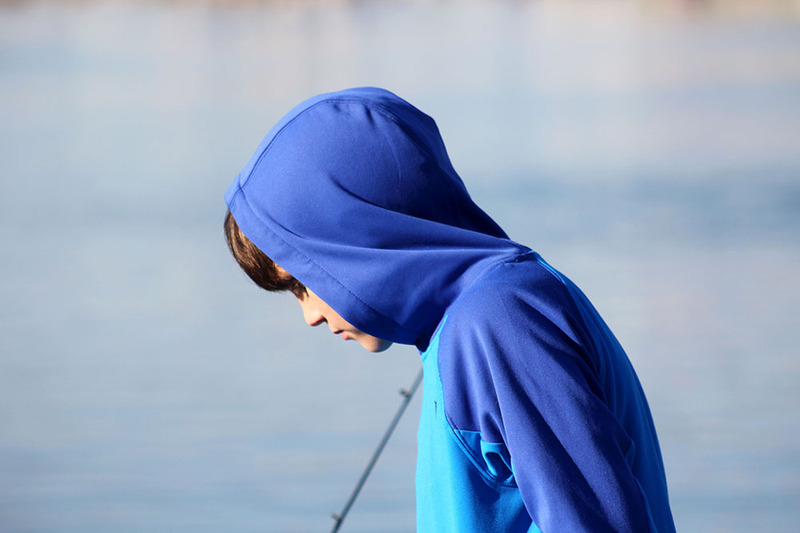 Catfish are omnivorous bottom-feeders and one of the most instantly recognizable fish. 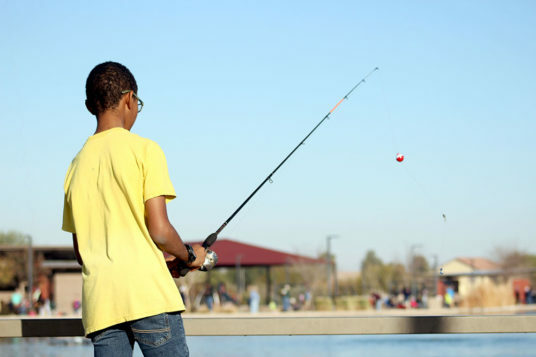 Anglers also consider them a fun sport fish. 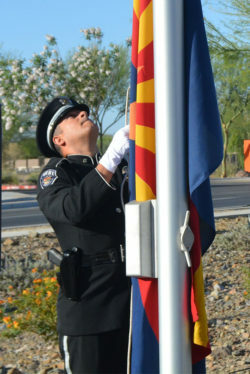 They will be stocked in Maricopa again in late March, according to AGFD. 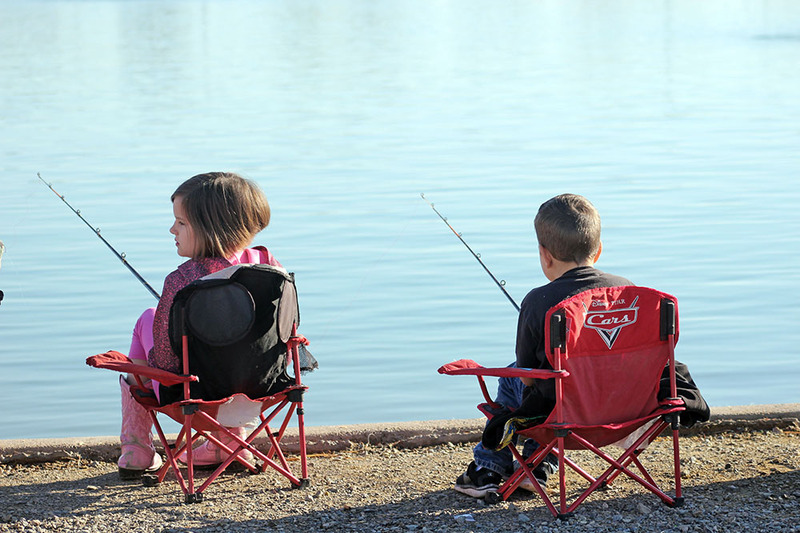 Trout are also a popular game fish across the country and the focus of Arizona hatcheries. 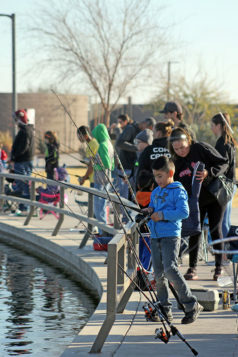 They again will be stocked in Maricopa waters in January and February. 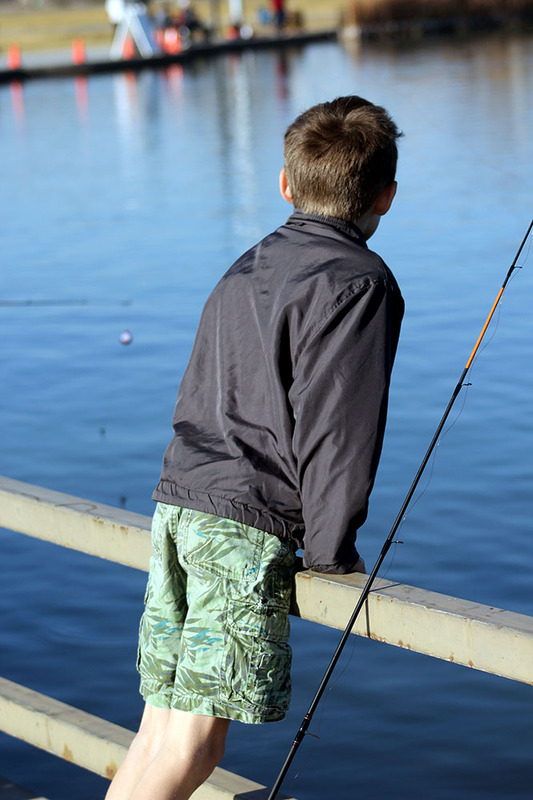 White Amur, named for the Amur River in Asia, are commonly called grass carp outside of the United States. 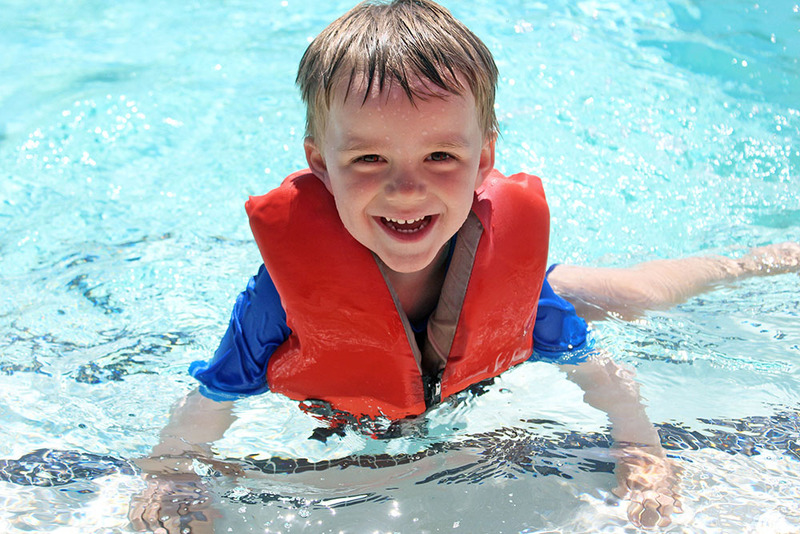 The Amurs do well in standing bodies of water like ponds and lakes. 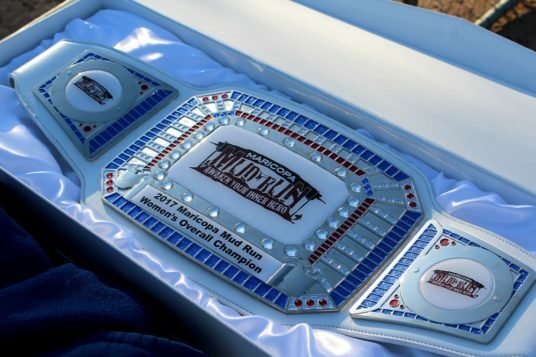 They can be difficult to catch and can be fighters once they’re on the line. 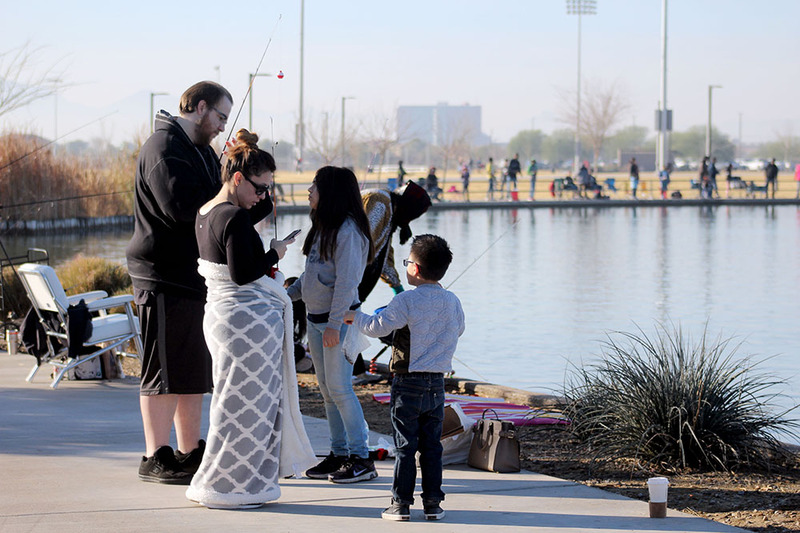 The city’s fishing waters are typically open from sunrise to 11 p.m., and anglers can fish for free year-round. Anglers age 10 and over must have a license to fish. This item appears in the January issue of InMaricopa. 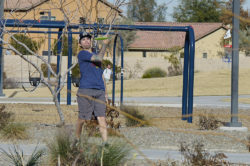 The new disc golf course at Copper Sky is expected to be ready in time for a tournament planned for late January. 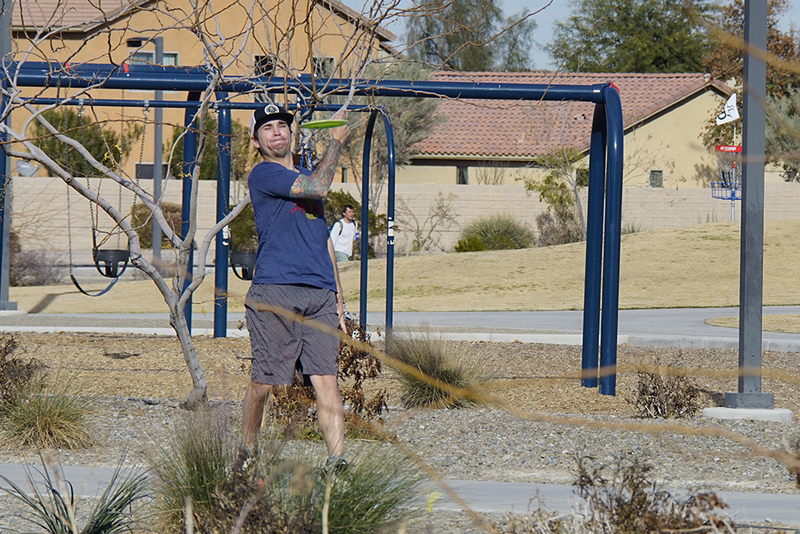 A new disc golf course is coming to the Copper Sky Recreation Complex. It is expected to open by Jan. 26, in time to host the Maricopa Open, which starts that day. 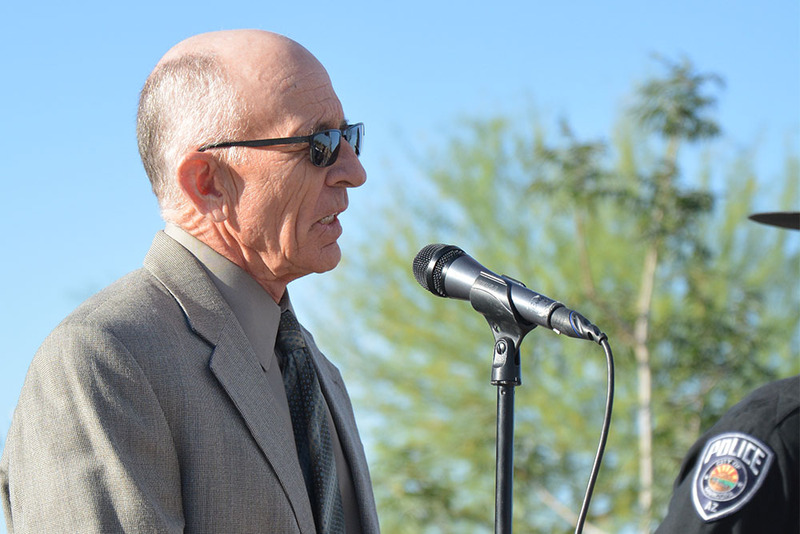 The course is complete except for four of the holes, according to Mike Riggs, deputy director of Community Services. 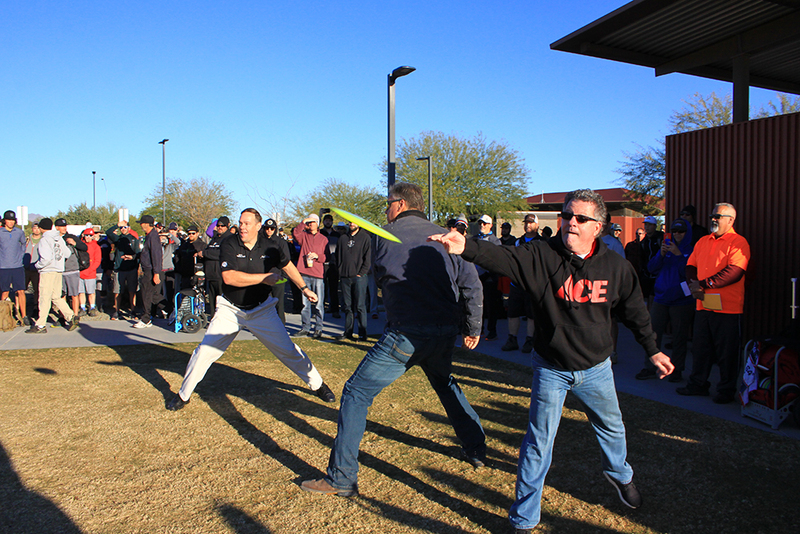 The idea of a new 18-hole course began a year ago. 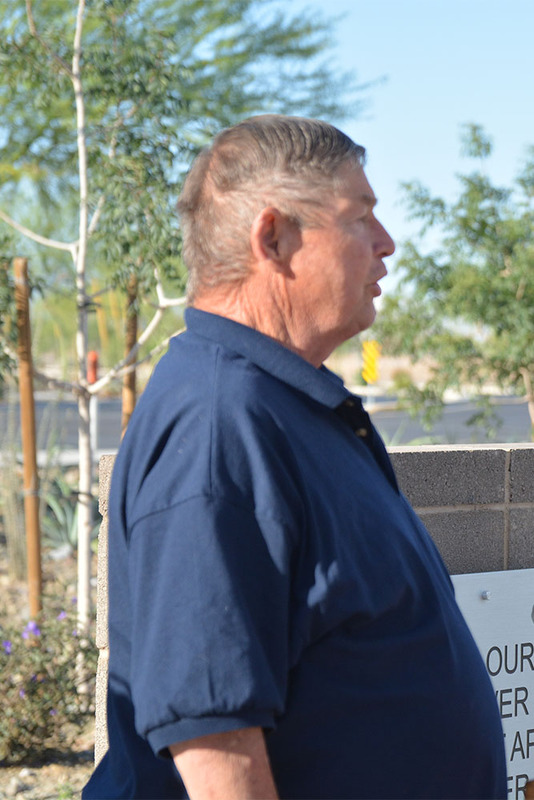 With Maricopa Ace Hardware helping the city on the project, cost to Maricopa taxpayers is under $10,000. 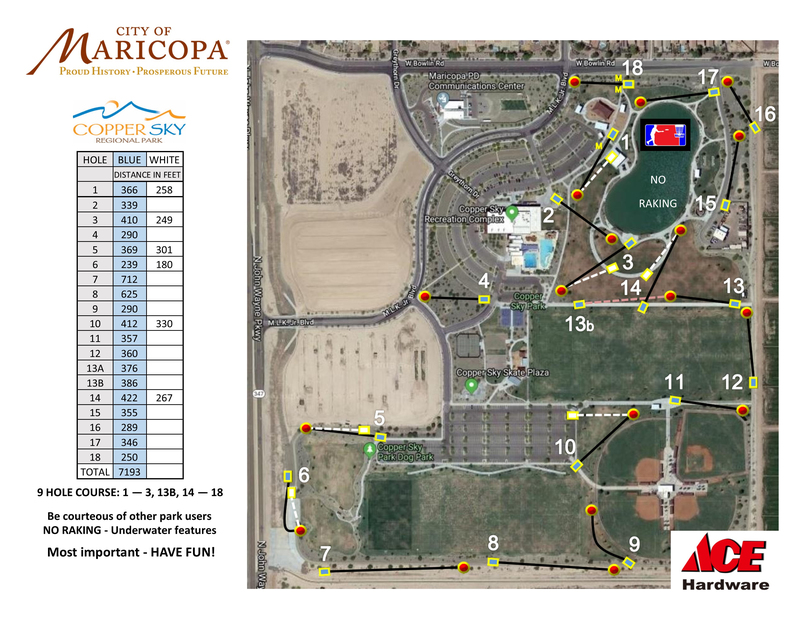 Mike Richey, owner of Maricopa Ace Hardware, told InMaricopa that he paid $5,000 to Eric McCabe, 2010 Pro Disc Golf world champion, for planning and design of the course, and the city purchased the hardware. The new course is especially designed to host larger tournaments as its “Blue Course” is 7,190 feet long and circles the distance of the sprawling 98-acre park. 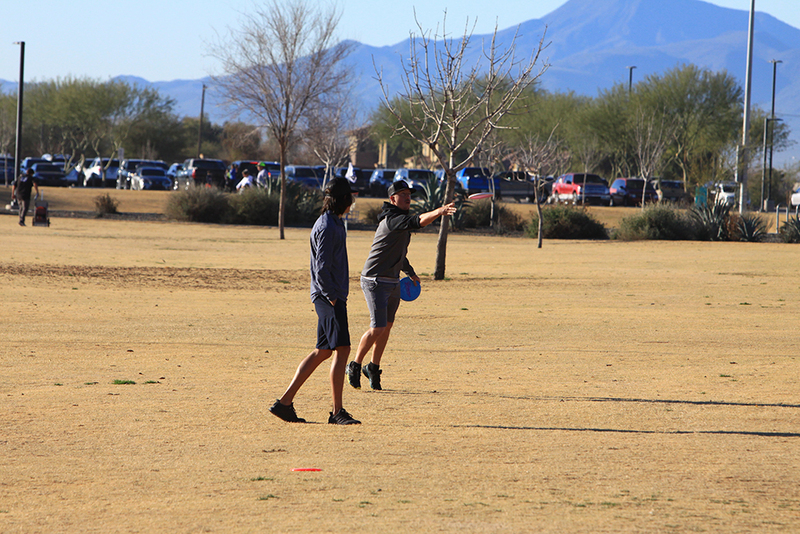 The 18 holes are separated by varying distances to challenge beginners and expert level players. 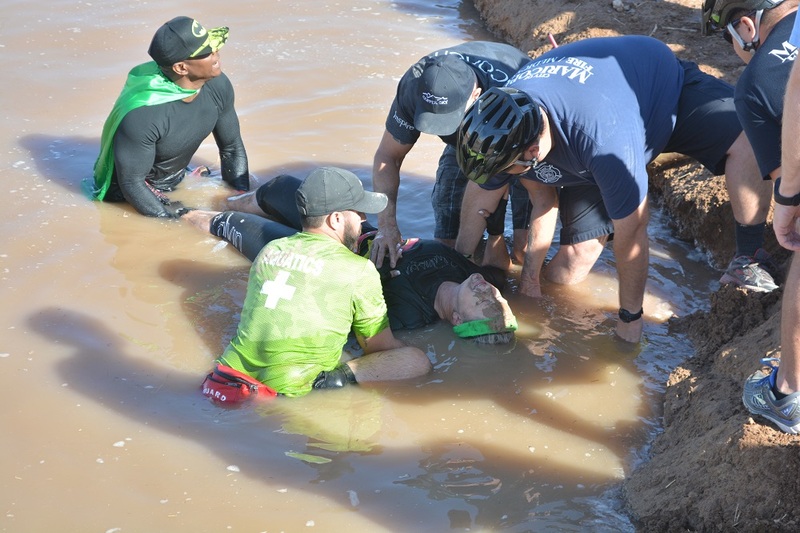 The course covers grassy and granite areas and has water obstacles. “I believe they are trying to hold a tournament on Jan. 26 and 27. 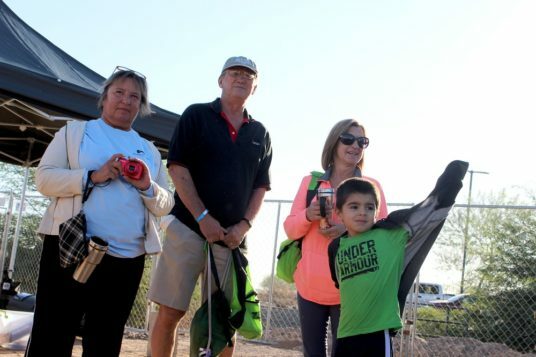 The balance of the tee boxes will be in before that time,” Riggs said. 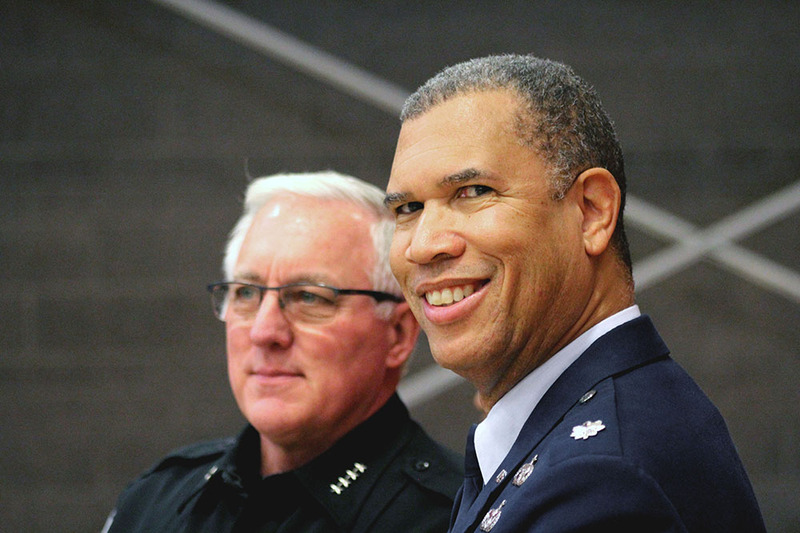 This is a corrected version of a story that published Dec. 10. 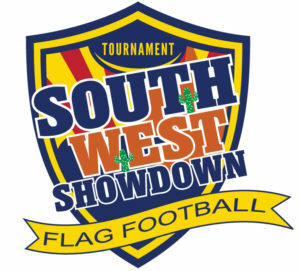 The designer of the course is Eric McCabe. 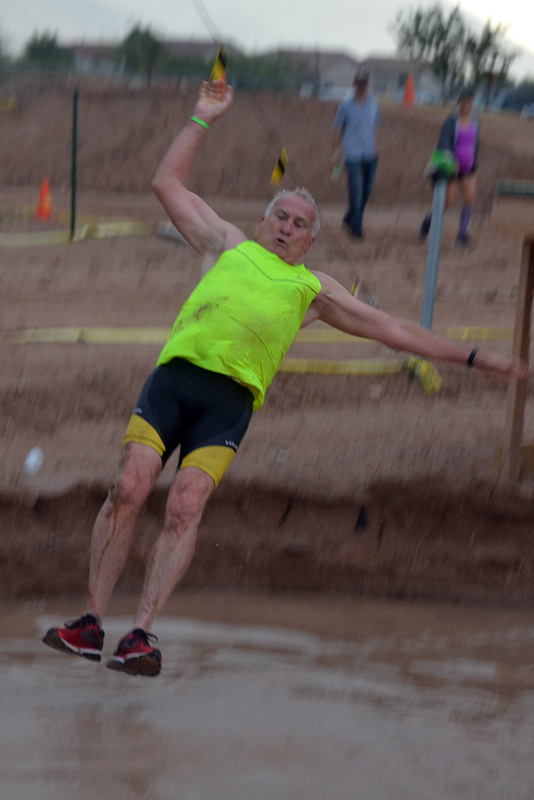 We regret the error. 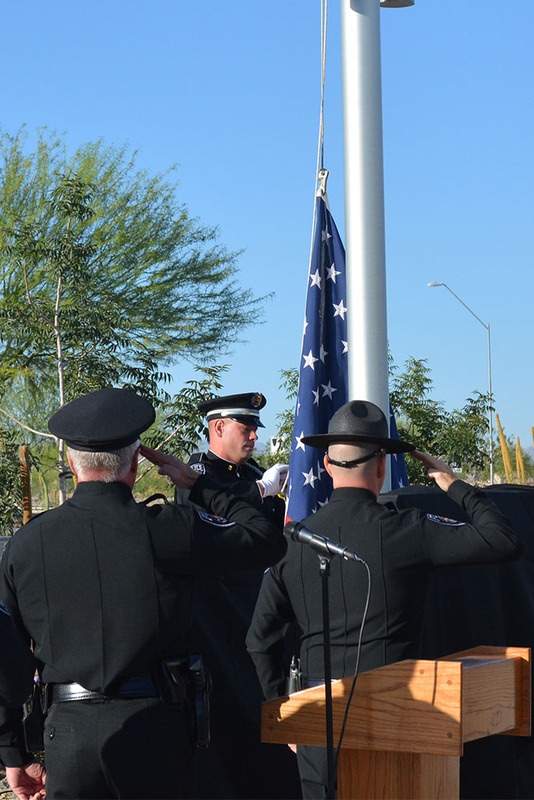 As Copper Sky looks for more revenue streams, a proposal to change rates and fees is before the public. 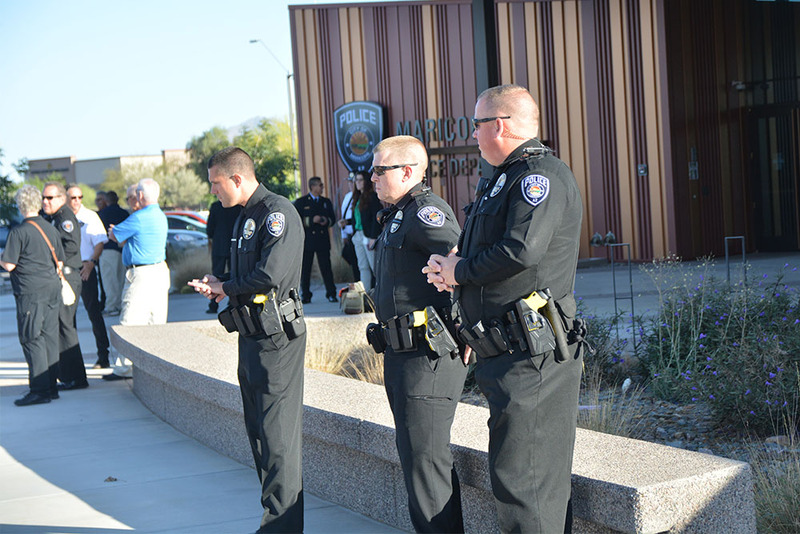 Maricopa City Council approved the policy in November and is scheduled to vote on the fee changes Jan. 15. The shifts in the proposal are meant to herd members toward an annual membership, which will be less expensive, especially for couples. 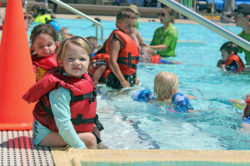 The proposal does not include monthly rates but increases the six-month membership fees for couples and families and increases for daily punch passes. 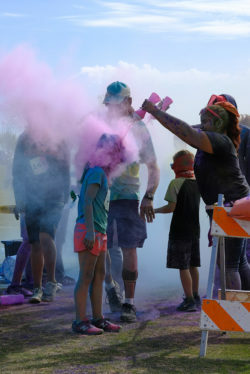 “We’re really looking to add value to your Copper Sky membership,” Ullyot said. 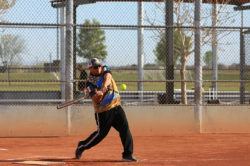 A point of contention has been the change for senior citizens. 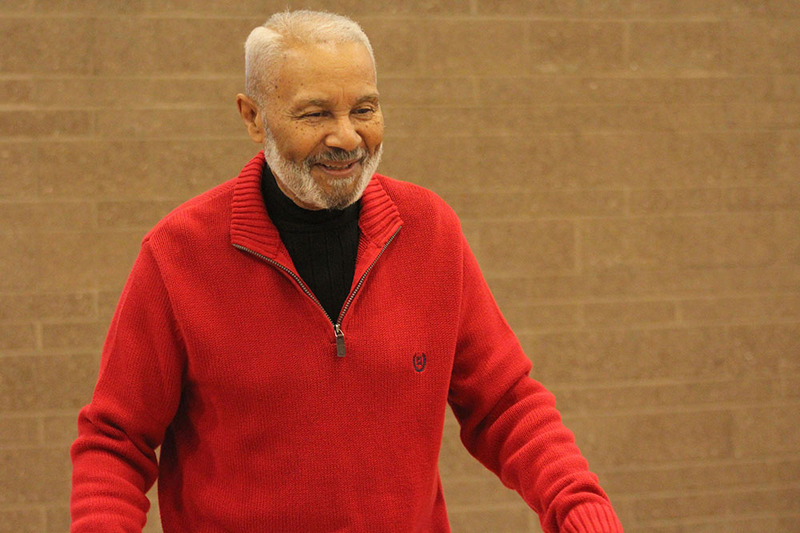 Under the current rates, single seniors and senior couples pay 40 percent less than the adult fees. 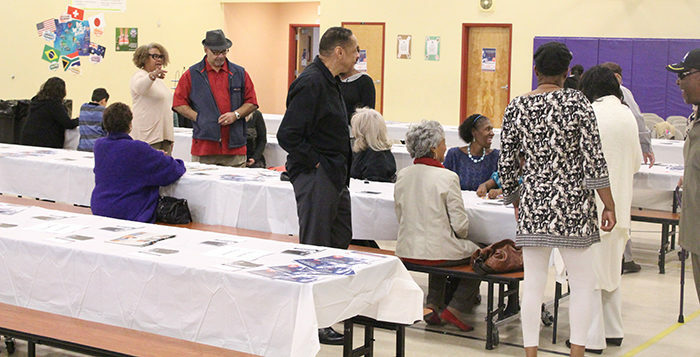 But senior rates are excluded in the proposal. 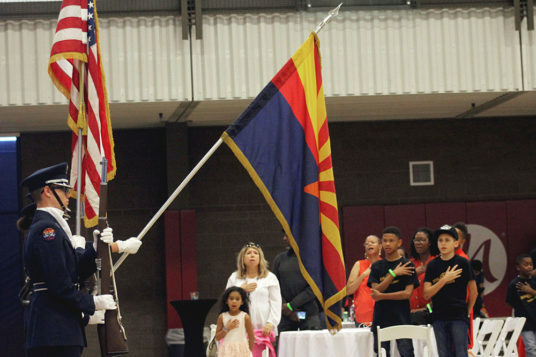 The new fee schedule puts them level with military veterans, which is a 10-percent discount. 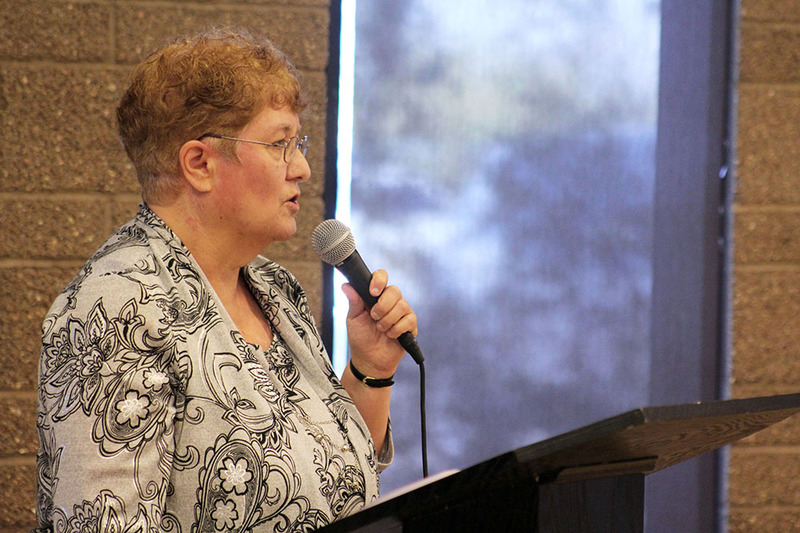 City Councilmember Nancy Smith, expressing concern for retirees on limited incomes during the November meeting, encouraged seniors to offer feedback about the proposal. 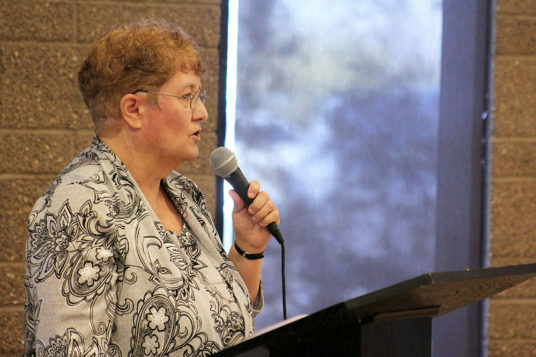 Joan Koczor of the Age-Friendly Maricopa Advisory Committee also reached out to constituents on her senior-activity newsletter urging seniors to get involved. 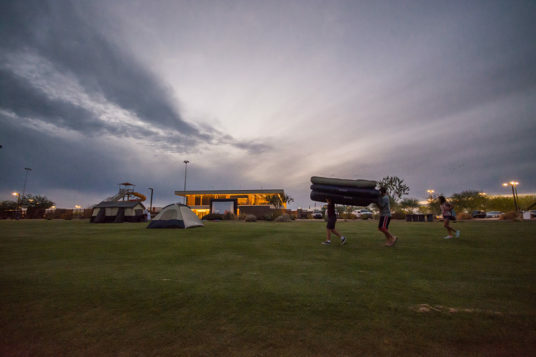 However, unlike the current schedule, a department proposal would allow scholarships for membership fees. The scholarship is based on federal income guidelines. Those who provide proof of income at 100 percent the poverty level (one person $12,140) could get another 30-percent discount along with the standard senior discount of 10 percent. 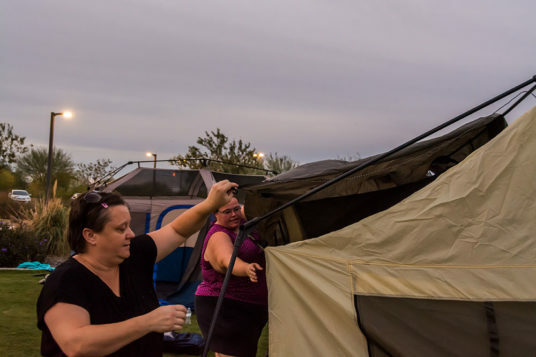 Those at 200 percent the poverty level can receive 15 percent off. 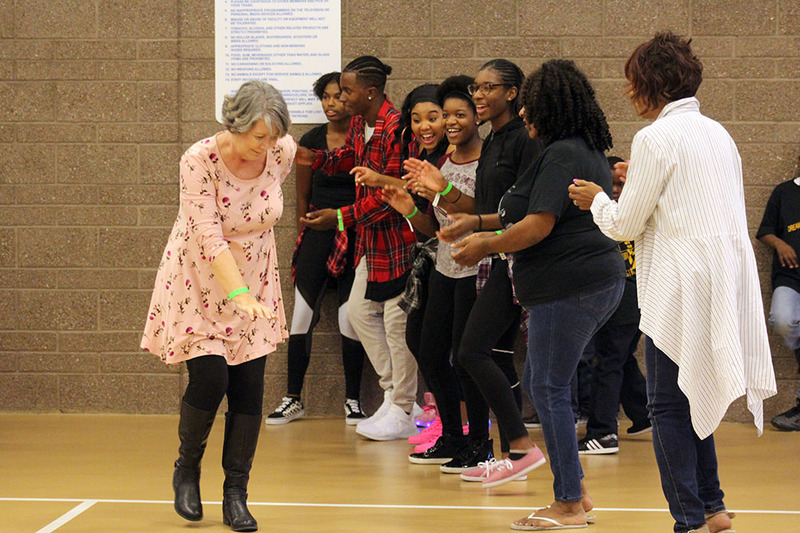 According to city numbers, more than 1,400 of the 1,800 senior memberships are paid for through programs like Silver Sneakers, Optum and Silver and Fit. 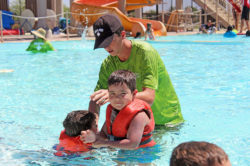 Some insurance companies are changing their funding of those programs or even switching programs. 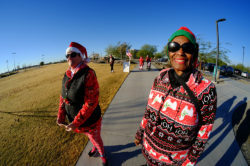 Ullyot will discuss some of the proposed solutions for senior memberships with the Age-Friendly Committee at its Dec. 17 meeting. The proposed fee schedule was post Oct. 31, and residents are asked to respond within 60 days of that date. 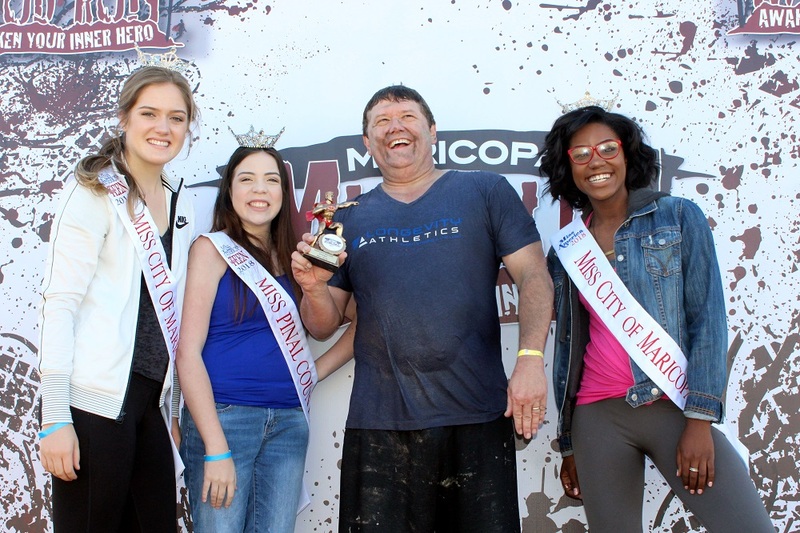 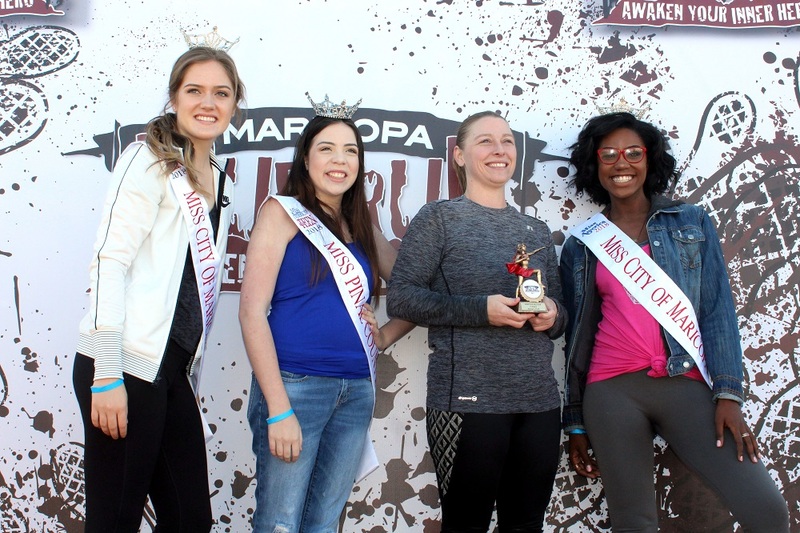 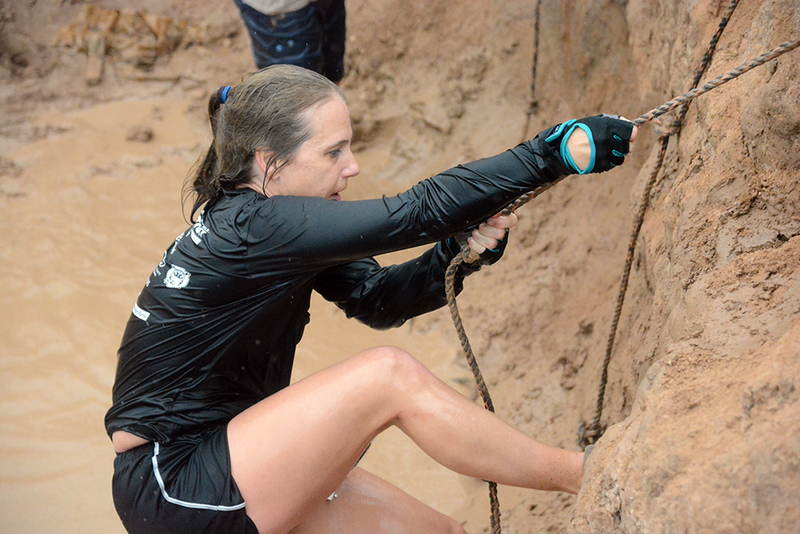 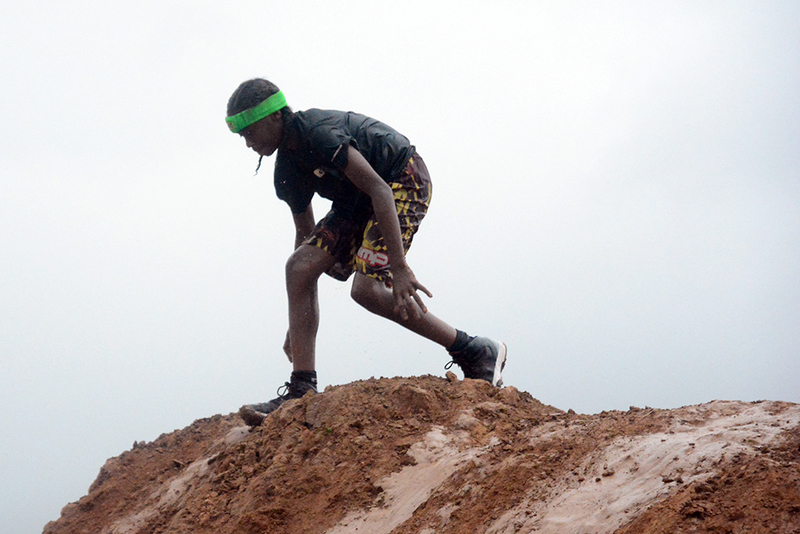 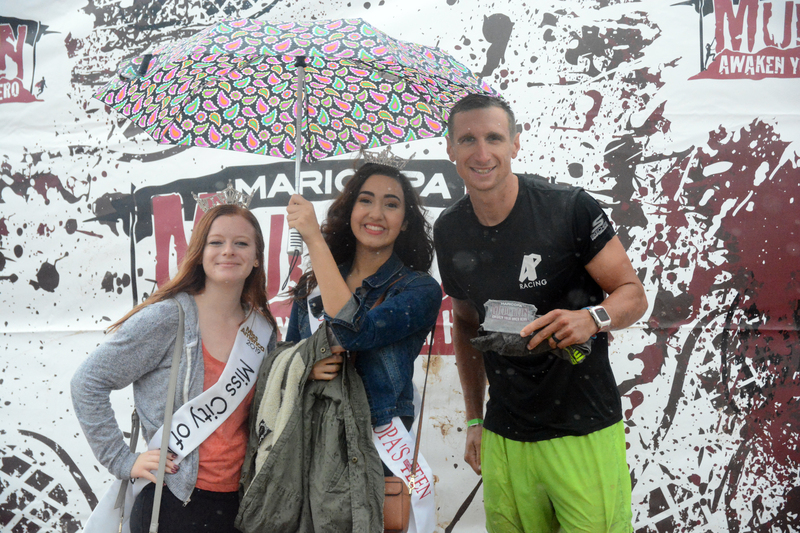 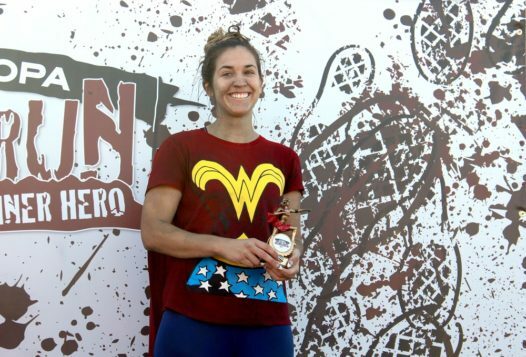 In a drizzle that turned into a lengthy downpour, Maricopa Mud Run got in two rounds, including the competitive race that saw Steve Campbell winning for the second straight year and Shell Abbott leading the women’s division. 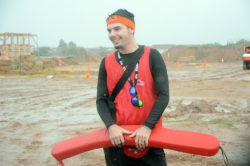 Competitors who signed up for later rounds have the option of returning to the course Nov. 3, race organizer Matthew Reiter said. While the obstacles at Copper Sky were built to be challenging, the weather conditions made the mud around the obstacles dangerously slick. 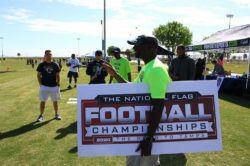 The first round with the top competitors had the best weather of the day, allowing Campbell to repeat last year’s feat. 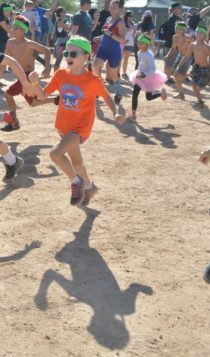 H said he runs the race to be part of the community. 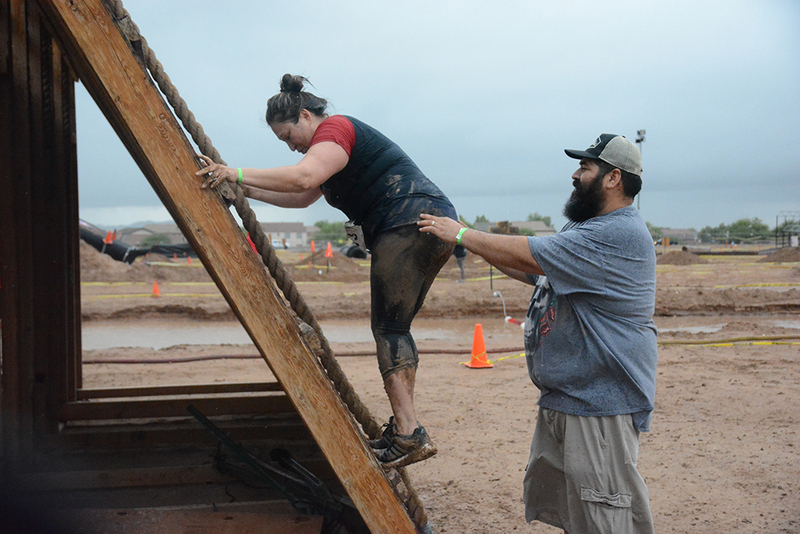 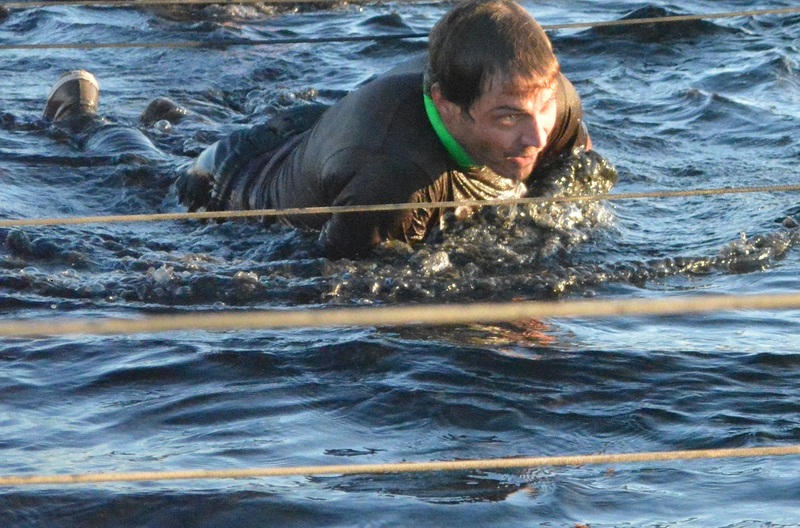 A teacher at Leading Edge Academy, Campbell moved to last year just before the Mud Run. 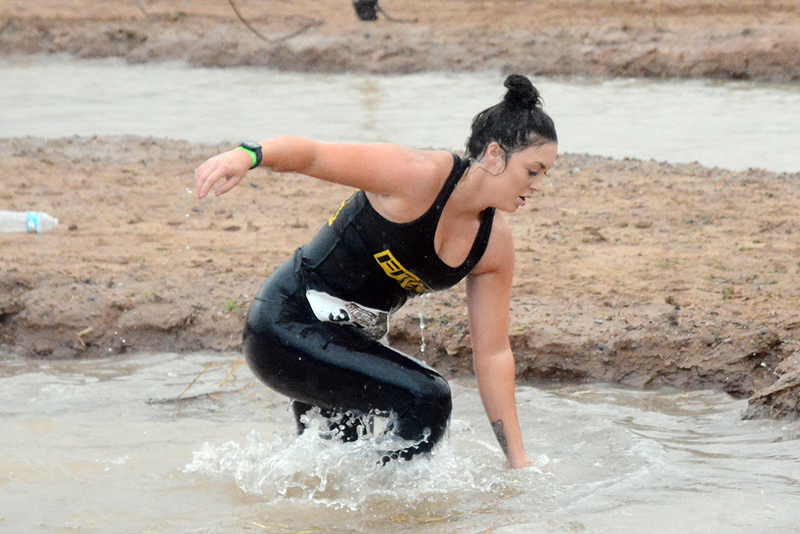 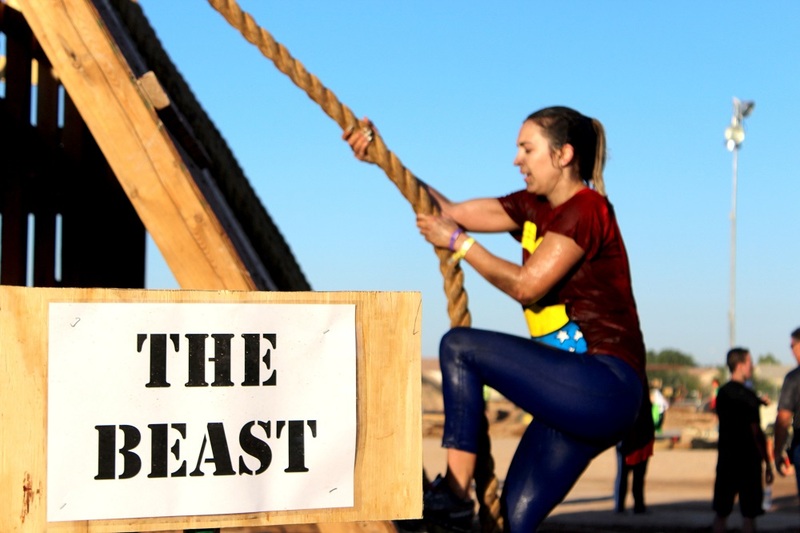 This story has been updated to reflect a new date for the remainder of the Mud Run. About 18 acres of land is waiting to be commercially developed at Copper Sky. 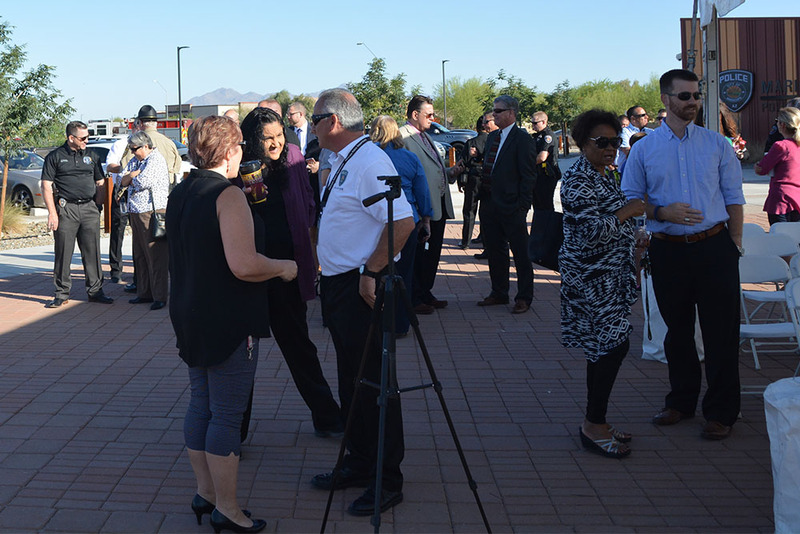 Maricopa could have a hotel in place by 2020 if a newly signed agreement with Commercial Properties Inc. (CPI) goes according to plan. 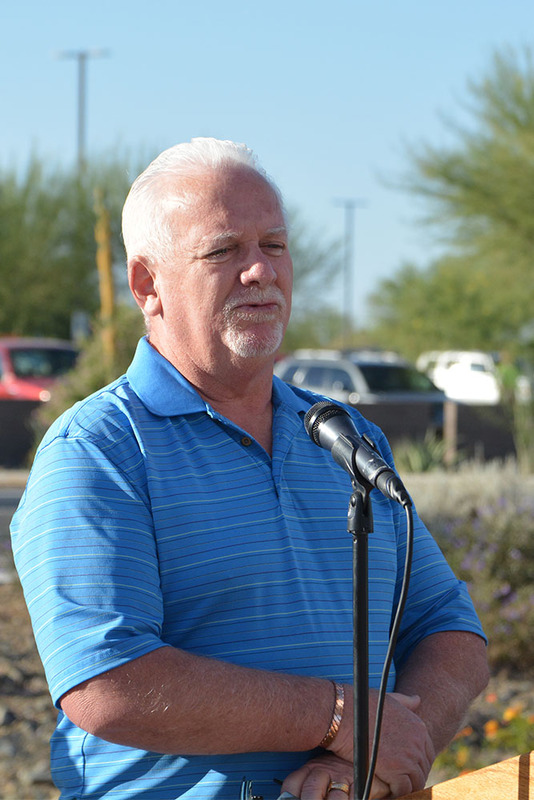 Cecil Yates, property management director for CPI, told the Maricopa City Council he already had three hotel users interested. CPI was selected in May to develop 18.3 acres at Copper Sky for mixed-use commercial, including a hotel. A master planning and marketing agreement approved by council Tuesday is in place for three years, with three one-year extension options. 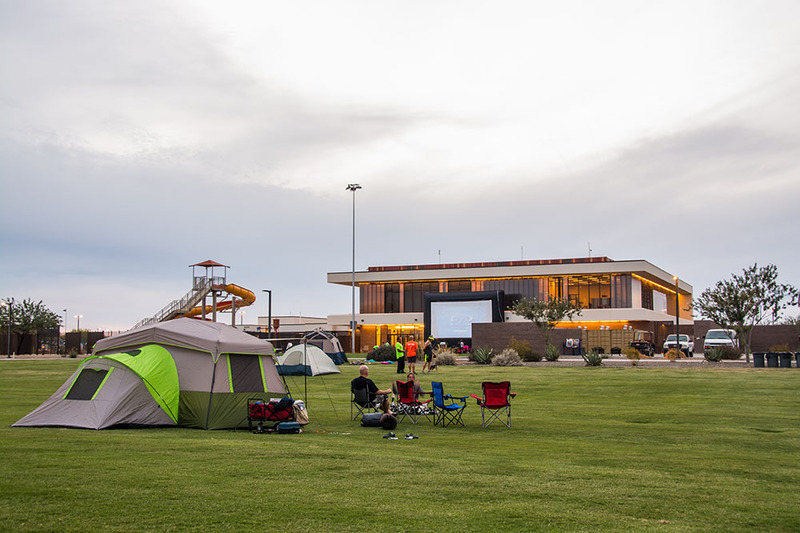 It gives CPI 30 days to present a master plan for what is currently called Copper Sky Commercial Property. 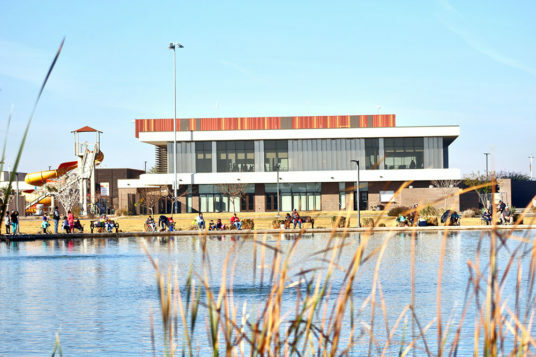 Besides a hotel, planned uses of the property include retail, offices and restaurants. 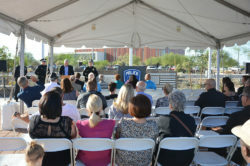 The agreement’s goal is to have a hotel of up to 100 units in place July 1, 2020. Yates said the timing possibilities are a year to 18 months from the time building designs are approved. 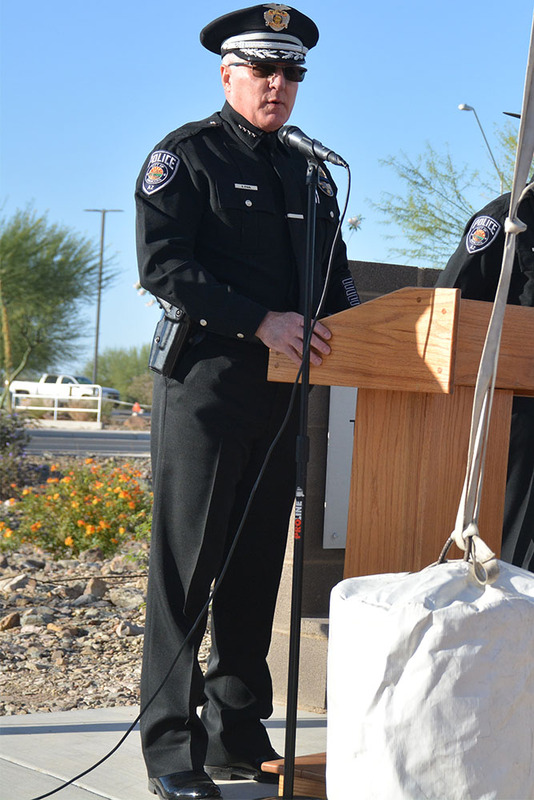 “They want to stick shovels in the ground as soon as possible,” Yates said. 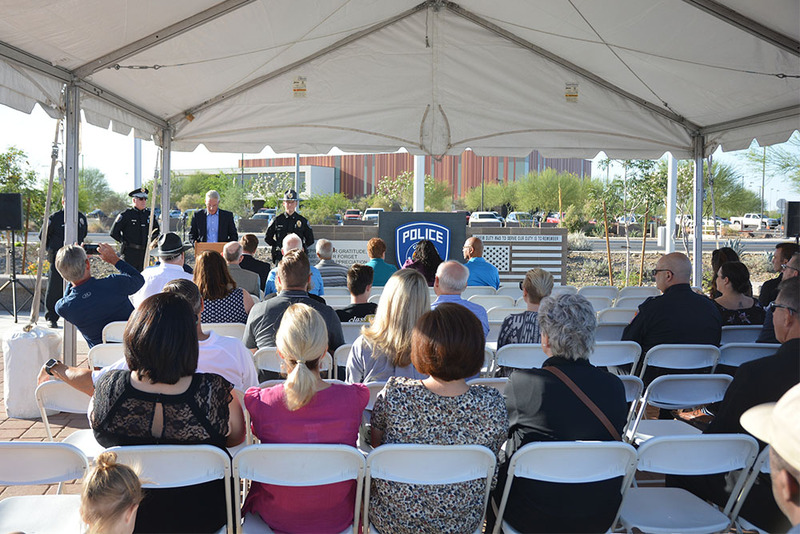 Once CPI has a hotel commitment, it must notify the City whether it intends to purchase or lease the property for the hotel. 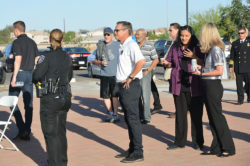 Detectives investigating an assault on a minor at Copper Sky nabbed the accused offender with a long rap sheet last week. 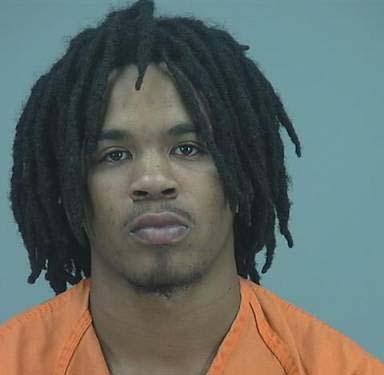 Maricopa Police arrested 21-year-old Jalen Lee Aug. 2 on suspicion of aggravated assault against a minor under 15 years of age. 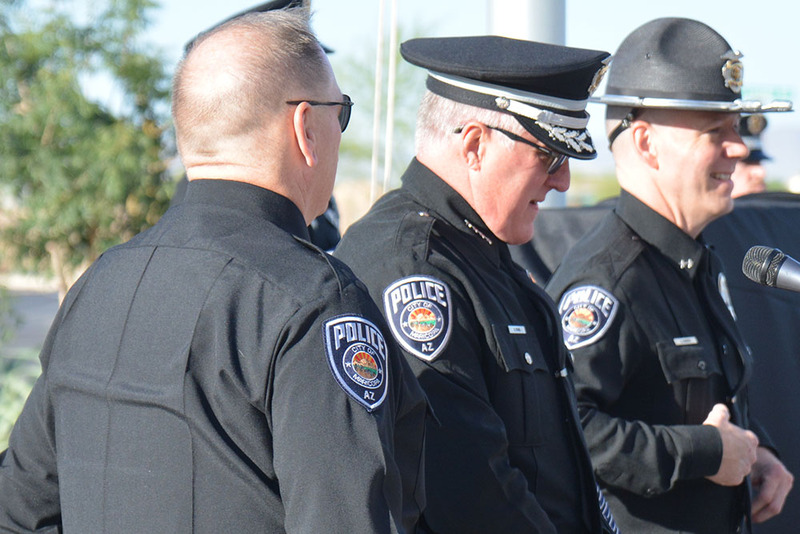 He’s also suspected of armed robbery, assault with a deadly weapon and other charges in 2016. 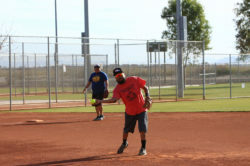 Lee’s most recent arrest came nearly one month after the alleged assault took place at Copper Sky Park July 5. 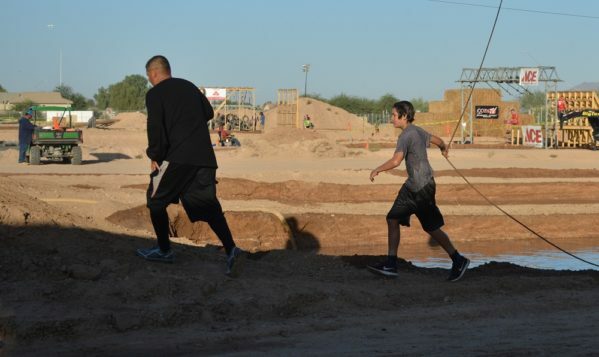 At that time, officers responded to reports of a fight at Copper Sky where a minor told them he was approached by two men he didn’t know, according to a Maricopa Police Department report. 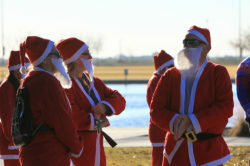 One man reportedly asked the victim how old he was. 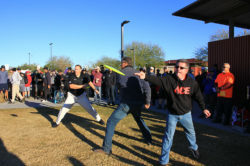 When the minor told him, the other male, later identified as Lee, allegedly said, “I don’t give a f—” and struck the victim in the face. 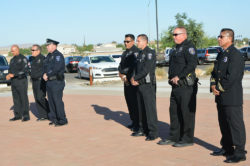 “(The victim) stated he fell to the ground and was hit by the same unknown person multiple times,” the report alleges. The two men then fled the scene, but not before several people witnessed the altercation, according to the report. 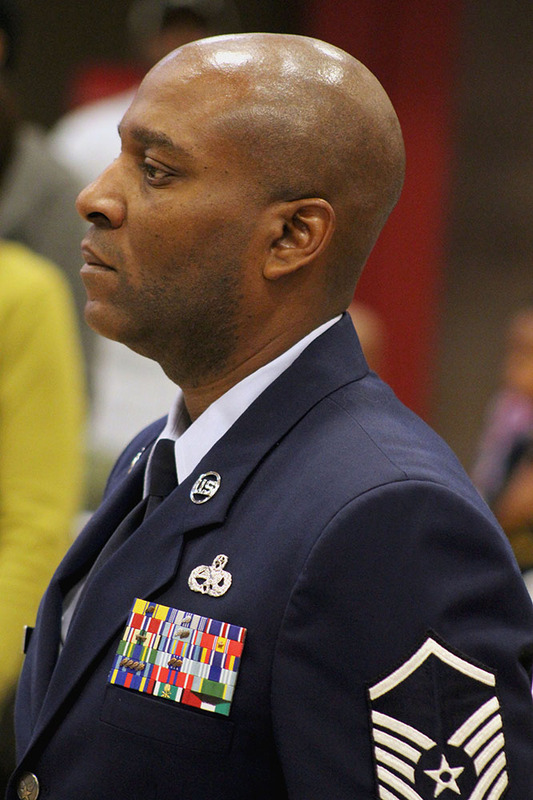 An older friend who was with the victim at the time of the alleged assault but had run away at the sight of the two men approaching spoke with MPD later that night. The friend told police he has a “beef” with Lee and identified Lee as the person who hit the victim, according to the report. 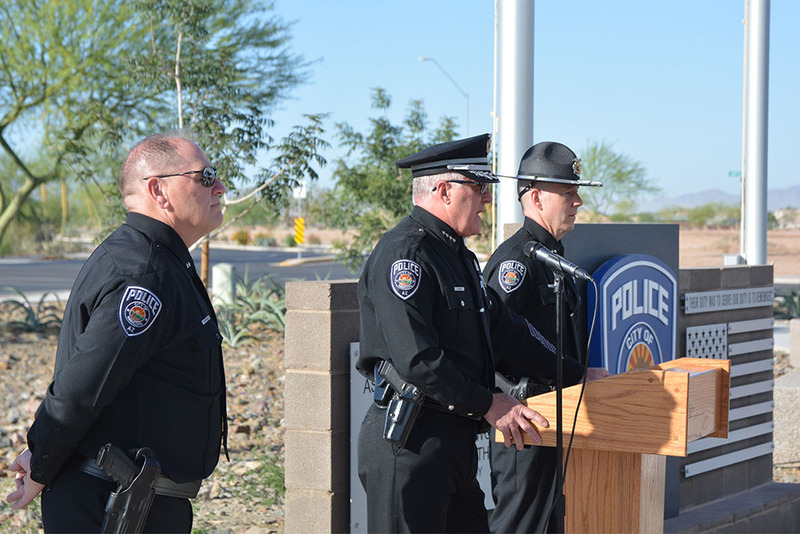 Detectives identified Lee as their primary suspect and generated a photo lineup using Lee’s Arizona driver’s license. 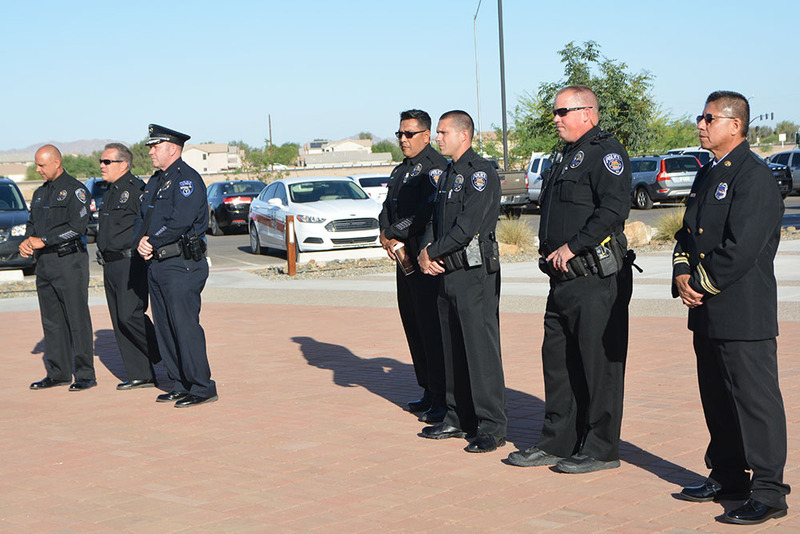 At the victim’s residence on Aug. 1, his mother told detectives she had learned new information in the weeks that had passed since the assault that would help in identifying the suspect. She said her son’s friend, who spoke with police in July, sent her a picture of Lee from Snapchat and identified him as the person who hit the victim, the report stated. 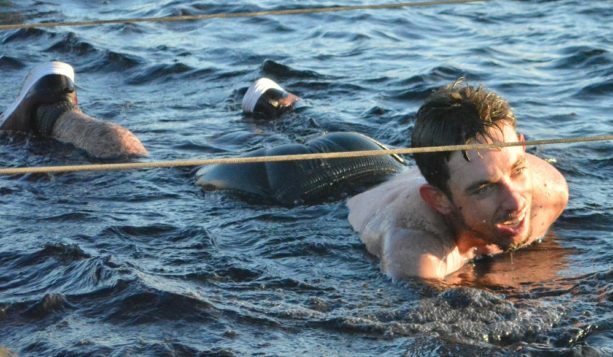 “(The victim’s friend) confessed to (the mother) that he had a ‘beef’ with (Lee), not (the victim),” according to the report. 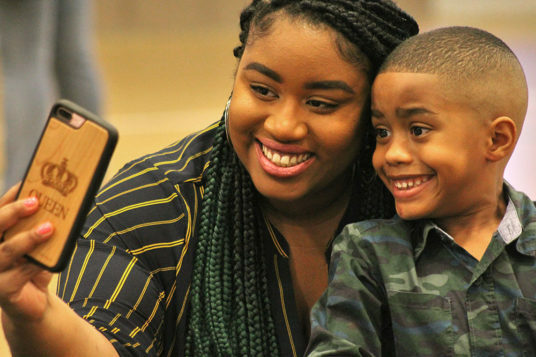 The mother posted the Snapchat photo reportedly of Lee to Facebook and asked the public’s assistance in identifying him. The report alleges several people came forward with Lee’s name, identifying him as the man in the photo. 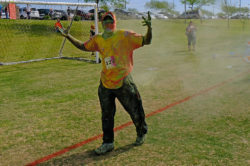 The victim also identified the man in the photo as the person who assaulted him. Police said Lee’s driver’s license photo matched the man in the Snapchat image. 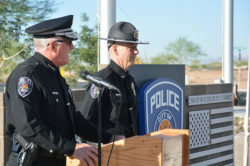 Police arrested and interviewed Lee the following day. Lee reportedly denied involvement in the assault and “claims officers have the wrong person,” according to the report. Lee is being held in the Pinal County Jail on a $50,000 bond on a slew of charges, most of them unrelated to the Copper Sky assault. 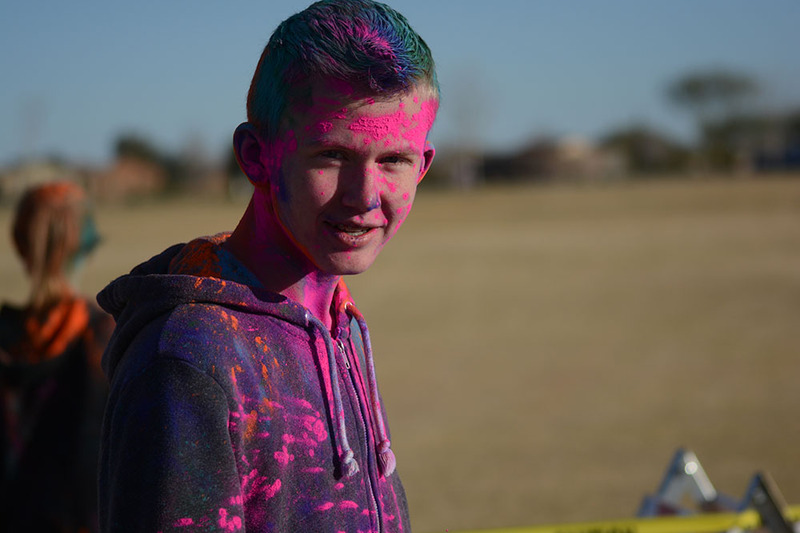 Lee is suspected of aggravated robbery (class 3 felony); armed robbery (class 2 felony); aggravated assault against a minor under 15 years of age (class 2 felony); aggravated assault using a deadly weapon or instrument (class 3 felony); and DUI. 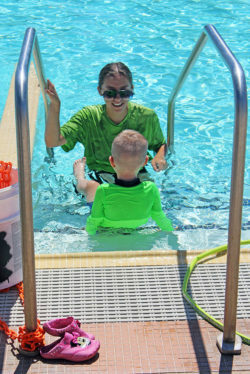 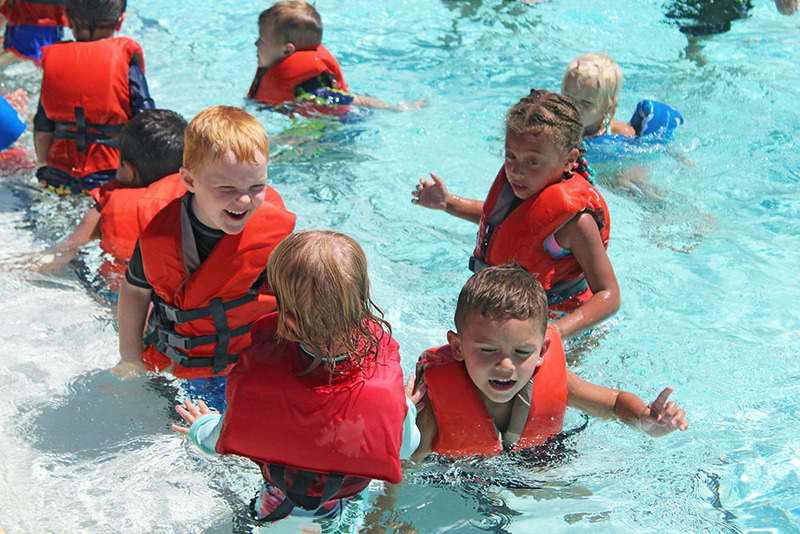 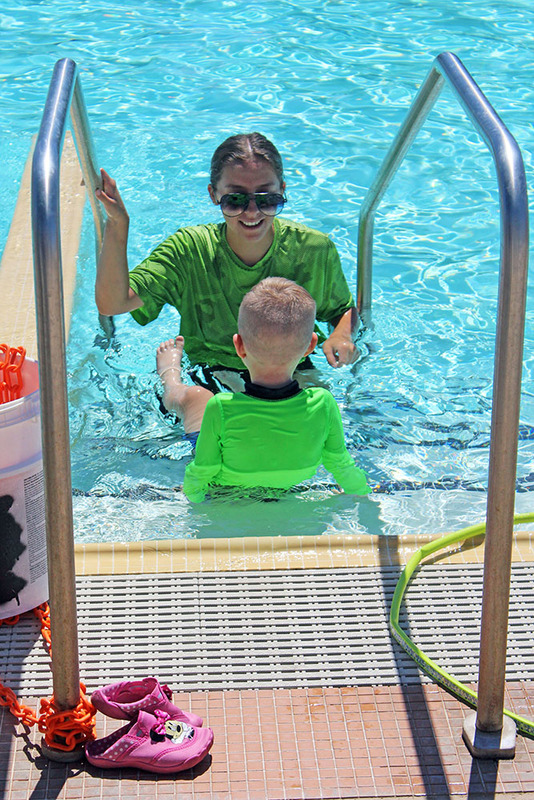 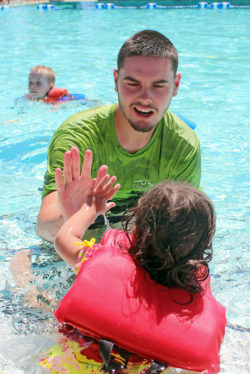 Nearly 70 Maricopa children participated in the World’s Largest Swim Lesson at Copper Sky Thursday. The annual global event promotes water safety awareness every year and continued in pools across the world June 21. 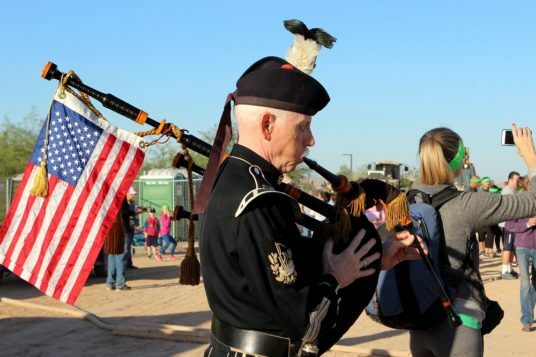 Maricopa Police Department has never lost an officer on duty. 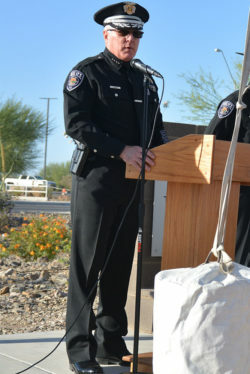 Chief Steve Stahl said he prays that day never comes. 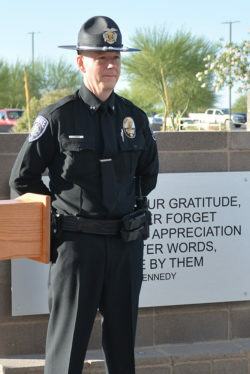 But Steve Stroud, a board member of the Maricopa Police Foundation, thinks it’s only a matter of time. 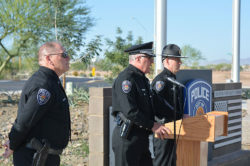 In Salt Lake County in Utah, where he’s from, five officers have been lost in 25 years, he said. 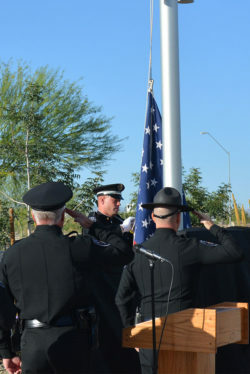 The “fallen officers” memorial monument unveiled Monday morning contains no names, yet, but includes a metal U.S. flag on which names can be engraved. 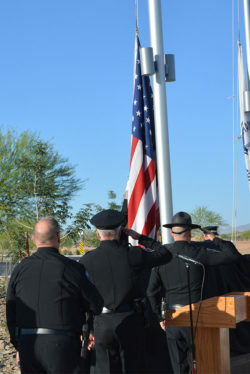 The monument stands in the plaza in front of the MPD substation north of Copper Sky Multigenerational Complex. 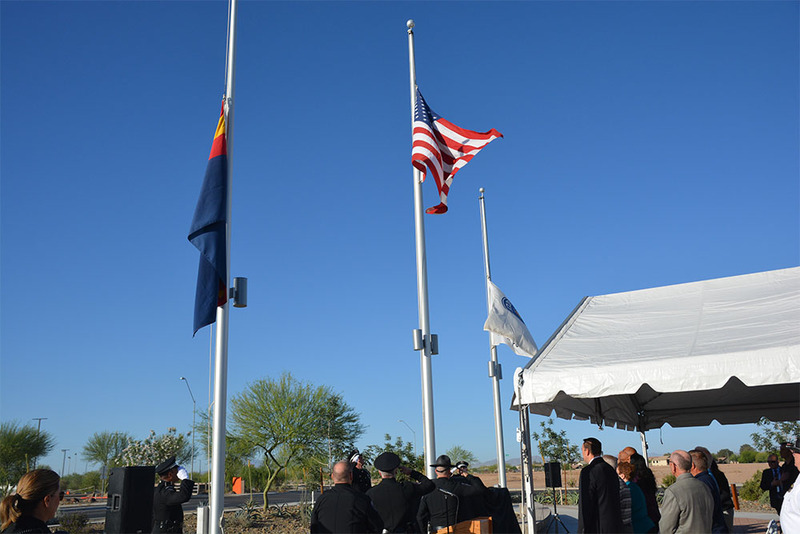 Police officers, staff from Maricopa Fire/Medical Department and elected officials attended the ceremony. 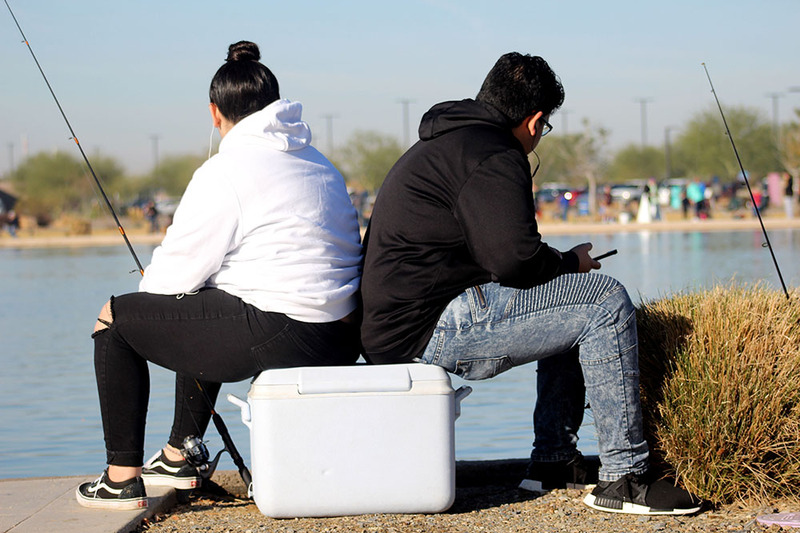 Live music boomed under the blazing sun at the Maricopa Music Fest last weekend. It’s the second event hosted by Founder Chrystal Allen-O’Jon after the inaugural fest four years ago. 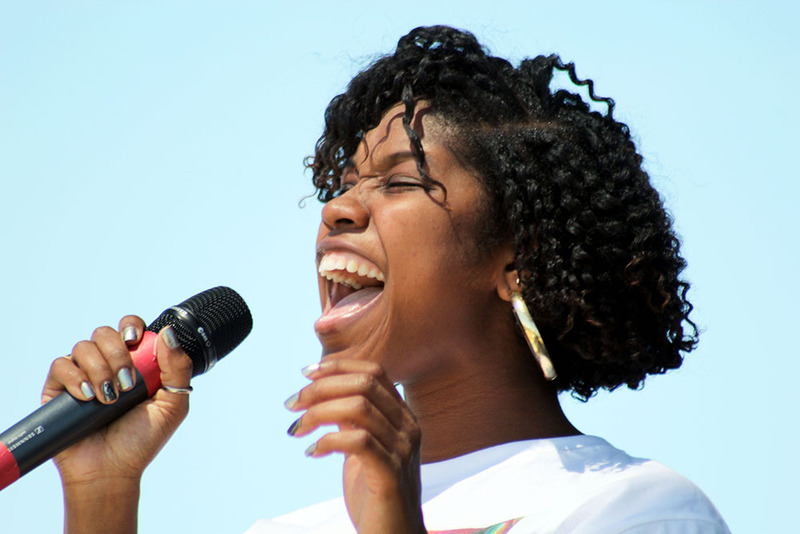 The lineup spanned genres from indie, rock and reggae to rap. 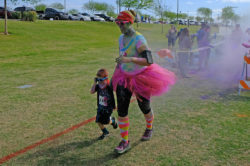 Entertainment ran from 1 p.m. to 10 p.m. at Copper Sky. 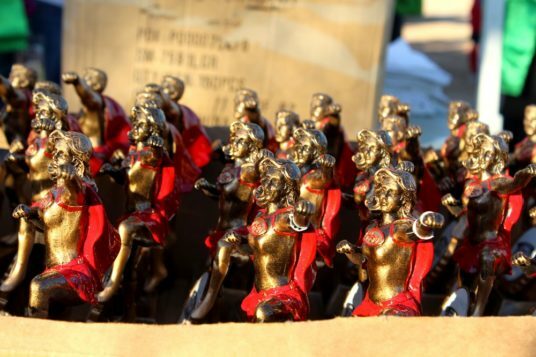 The Sun Life Chocolate Run is Saturday at Copper Sky. The annual event that pairs people’s love of chocolate with exercise returns to Maricopa this month. 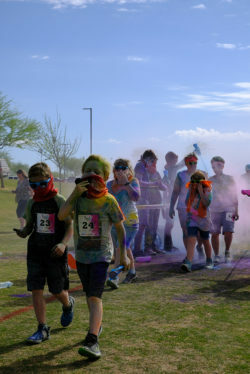 Sun Life Family Health Center will host the third annual “For the Love of Chocolate” Fun Run at Copper Sky on March 3. 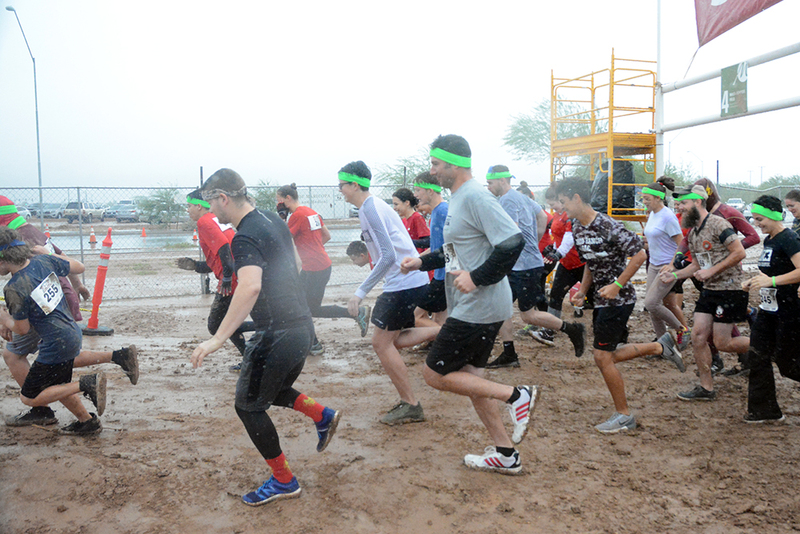 Beginning at 8 a.m., participants can choose to run or walk the 1-mile or 3-mile course. 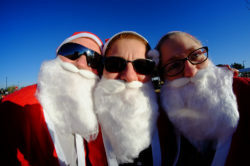 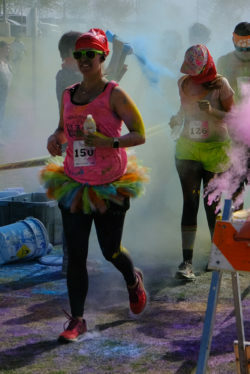 A runner’s brunch will be available prior to and after the race as well as photo booths to capture the memory of the event. 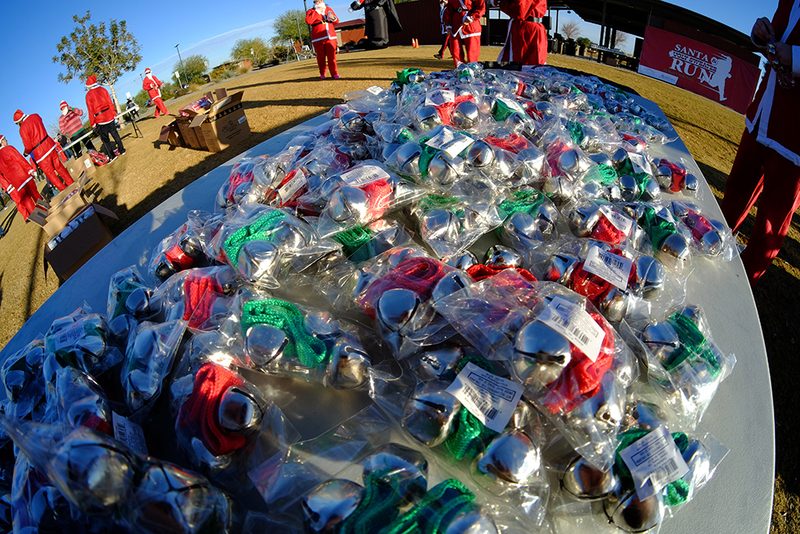 Finishers will be rewarded with a bag of chocolate goodies, a chocolate donut medal and an event T-shirt. 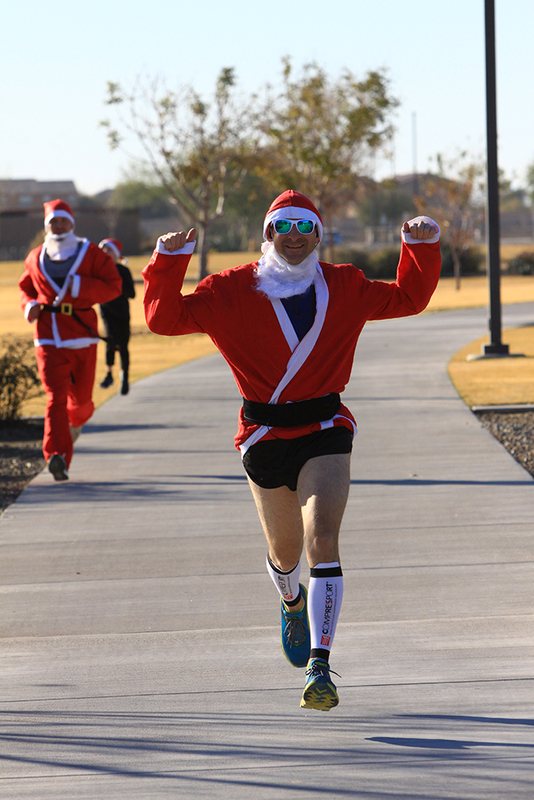 Top three 5K finishers in various age groups will also receive winners’ medals. Pre-registration costs $35 for the 1 mile/walk run and $40 for the 3-mile walk/run until March 2. A mail-in payment method is also available. 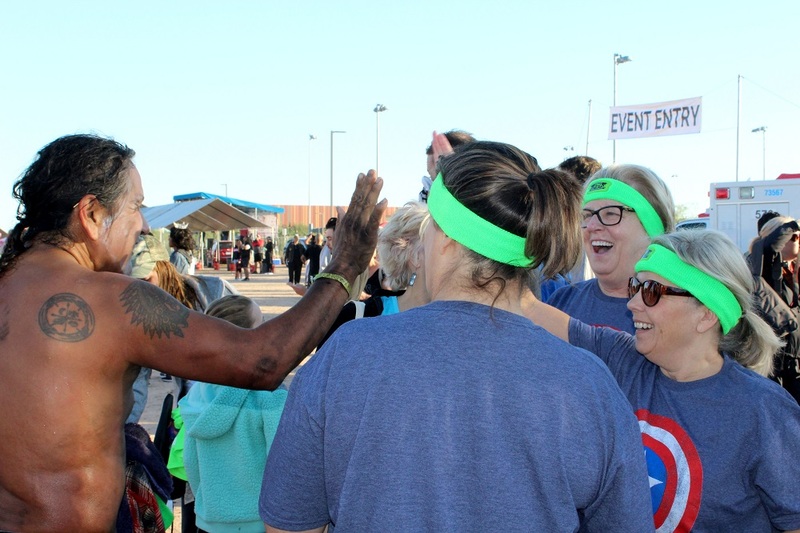 Race-day registration is $40 per person for the 1-mile run/walk and $50 for the 3-mile run/walk. 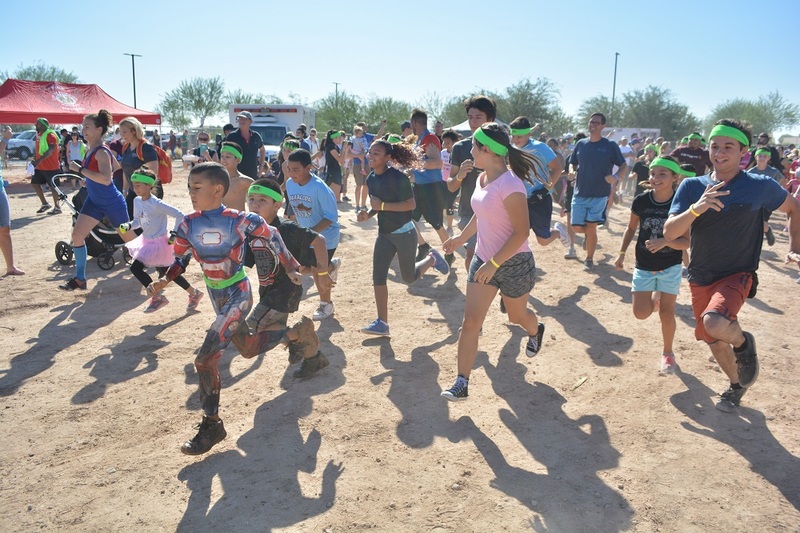 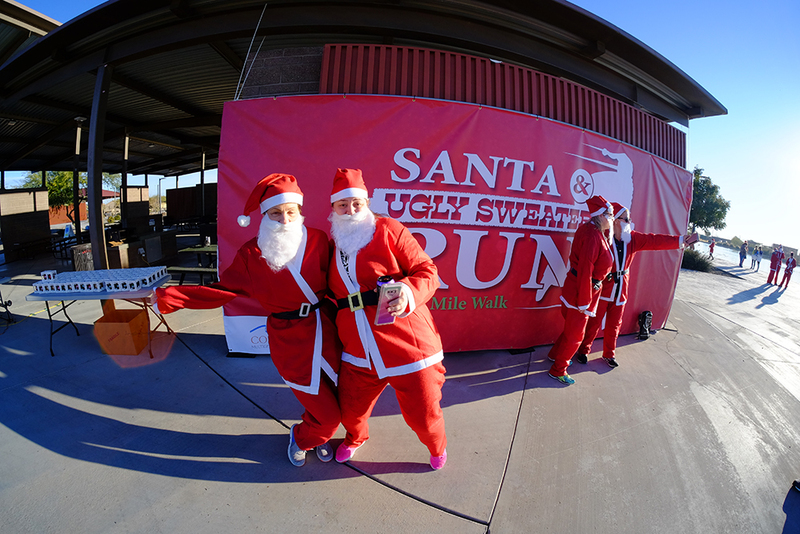 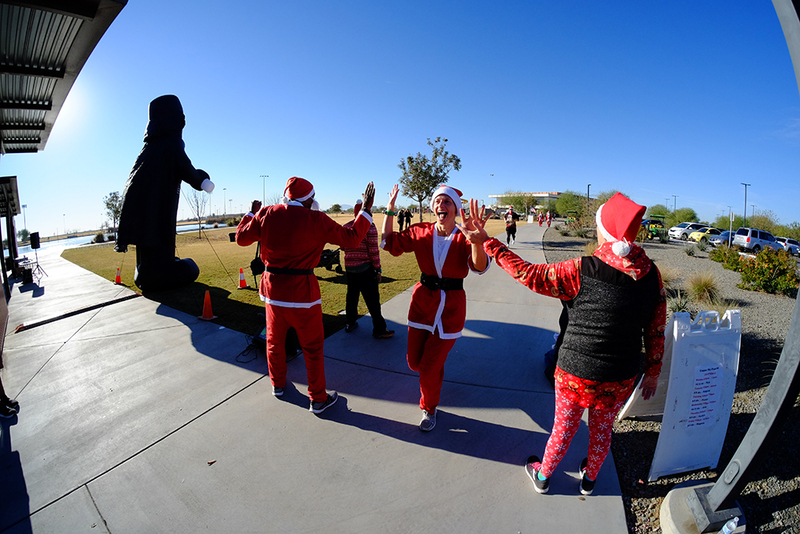 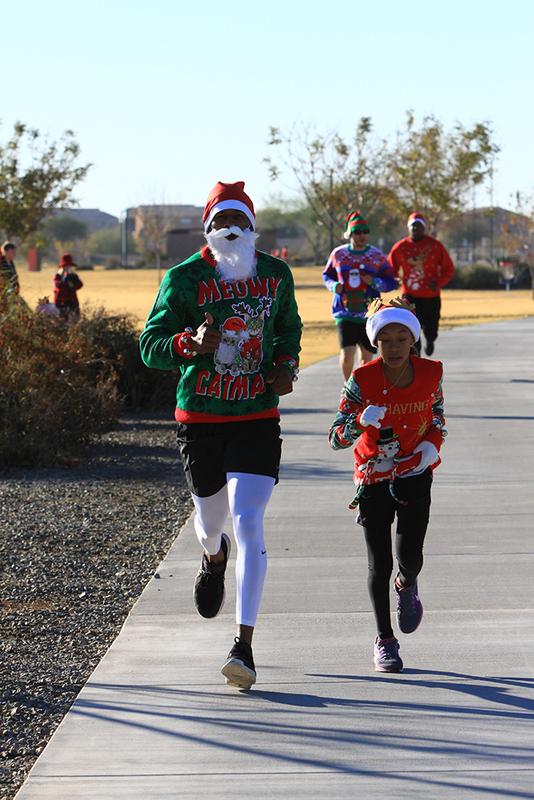 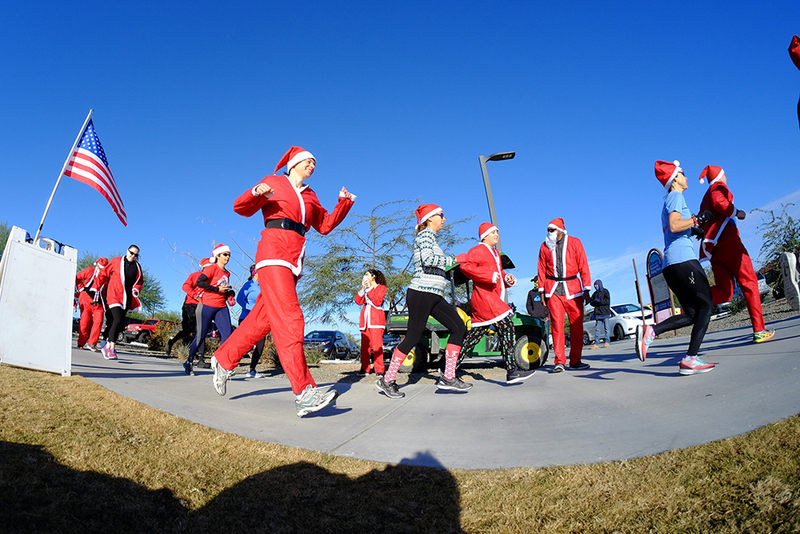 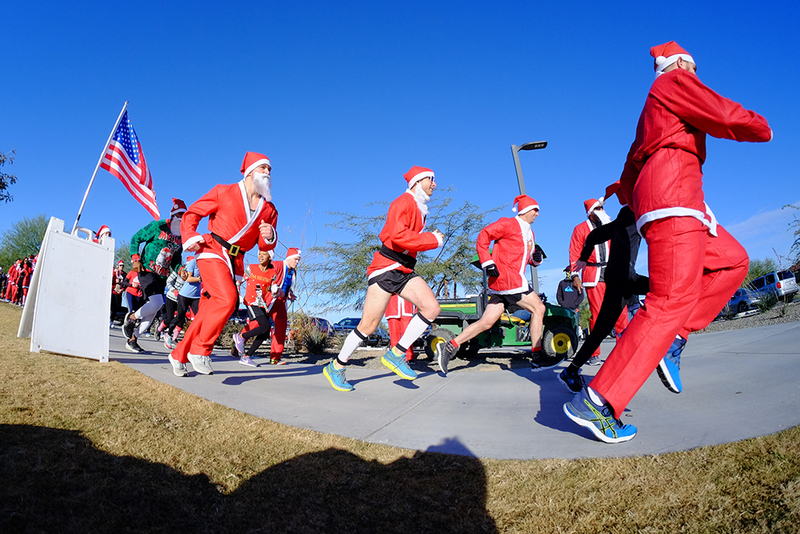 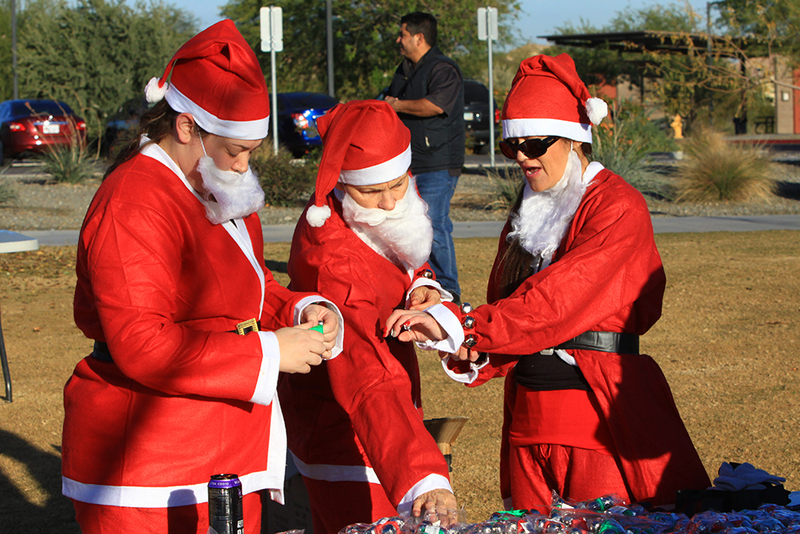 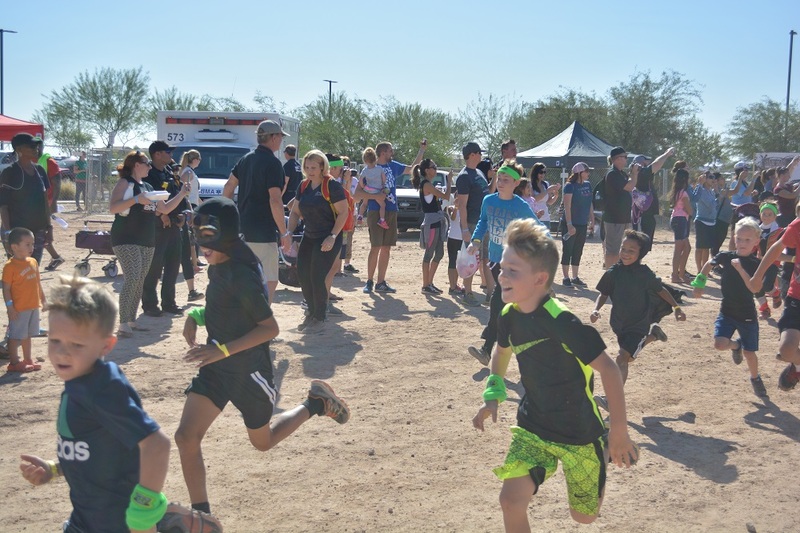 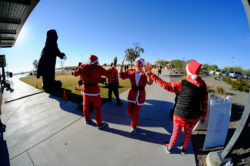 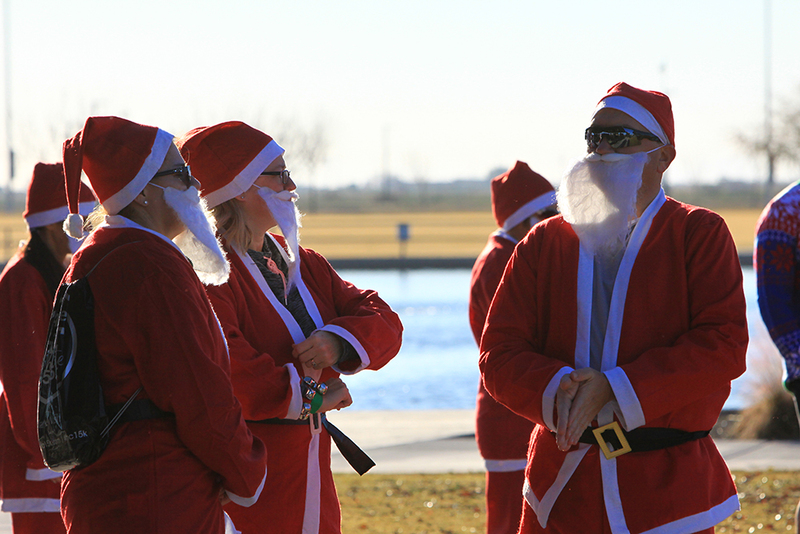 “One of the things that people can keep in mind is Sun Life is Pinal County’s nonprofit community health center, and the run is a fun way to support a local nonprofit,” said Renee Louzon-Benn, director of community outreach. 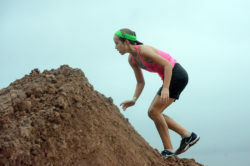 It’s also a way to enjoy chocolate, which, in moderation, is considered a healthy treat, she said. 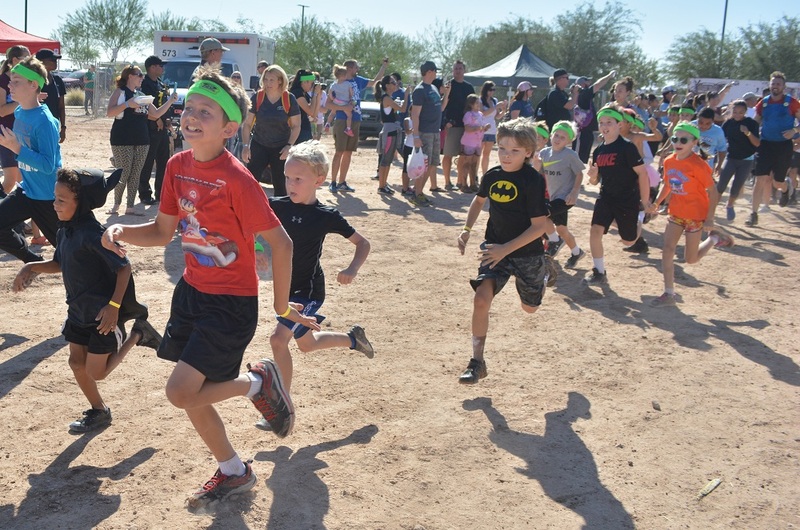 Participants can pick up race packets March 2 from 4 to 7 p.m. at Sun Life Family Health Center, 44572 W. Bowlin Road. 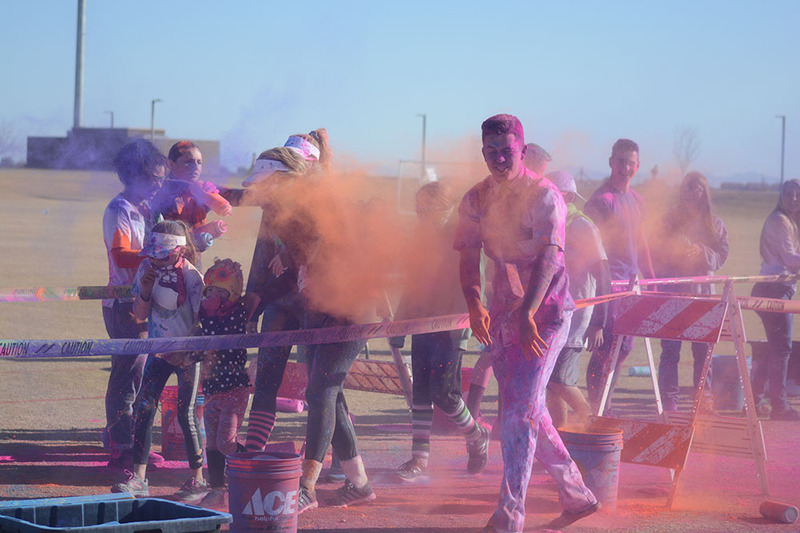 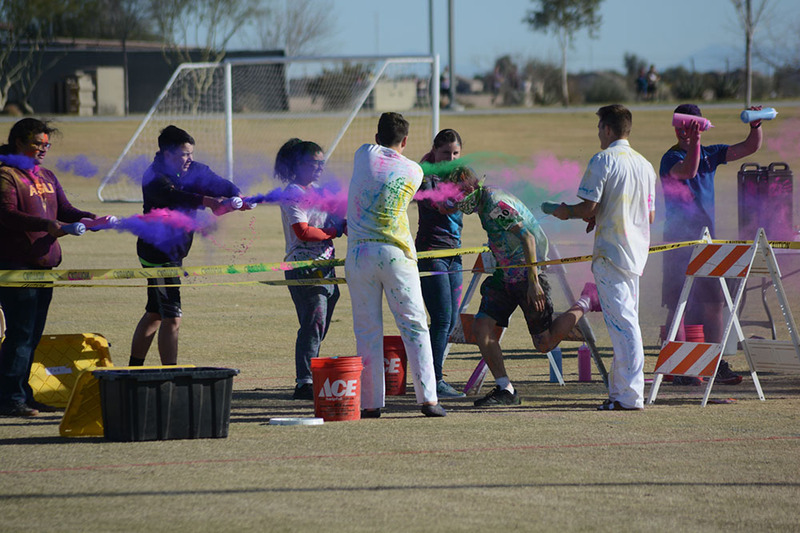 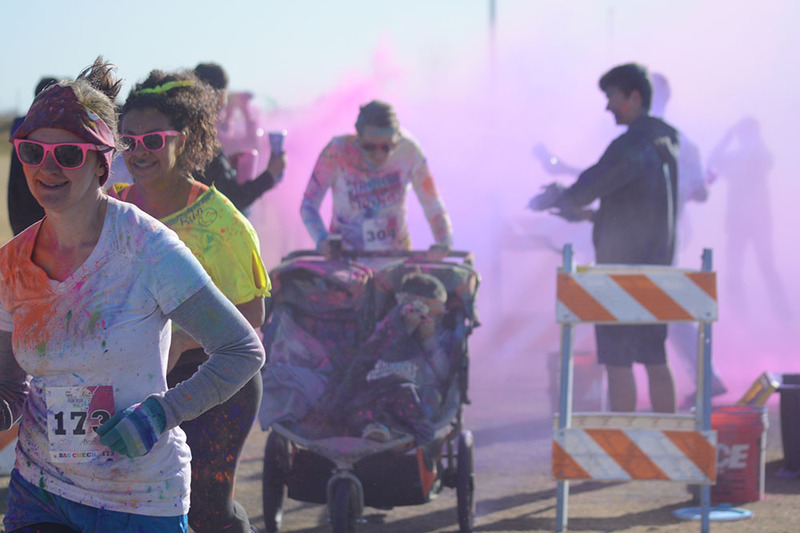 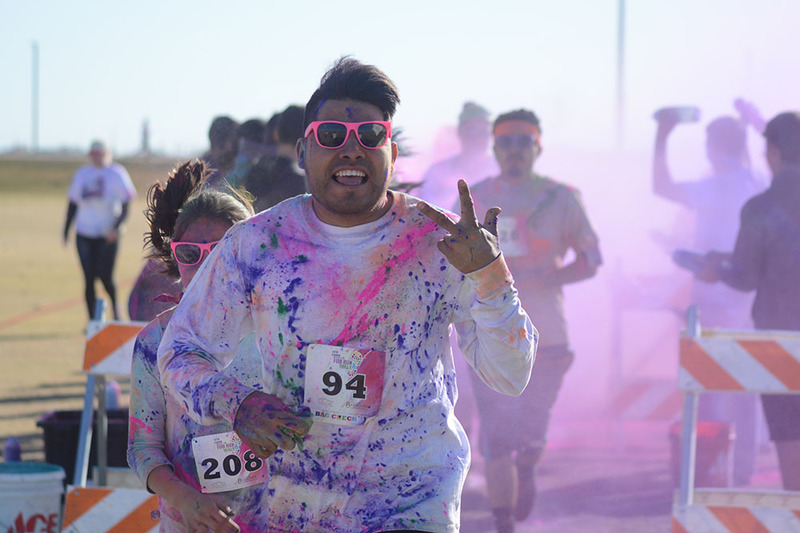 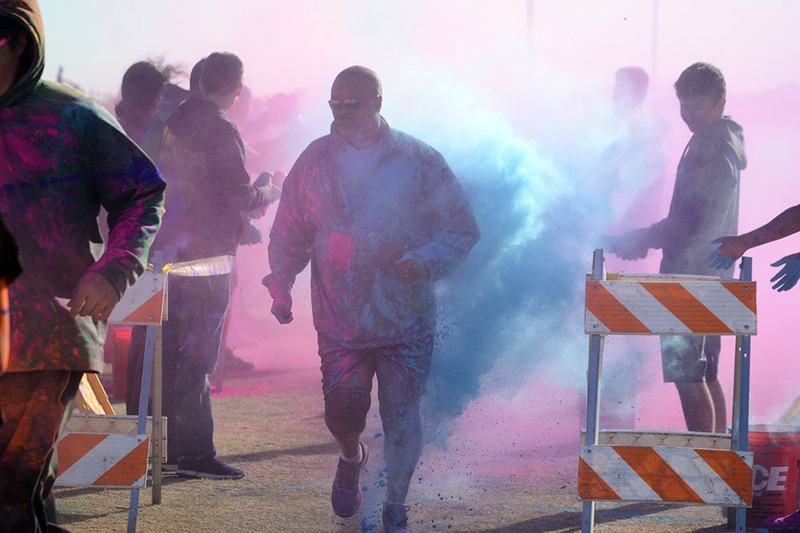 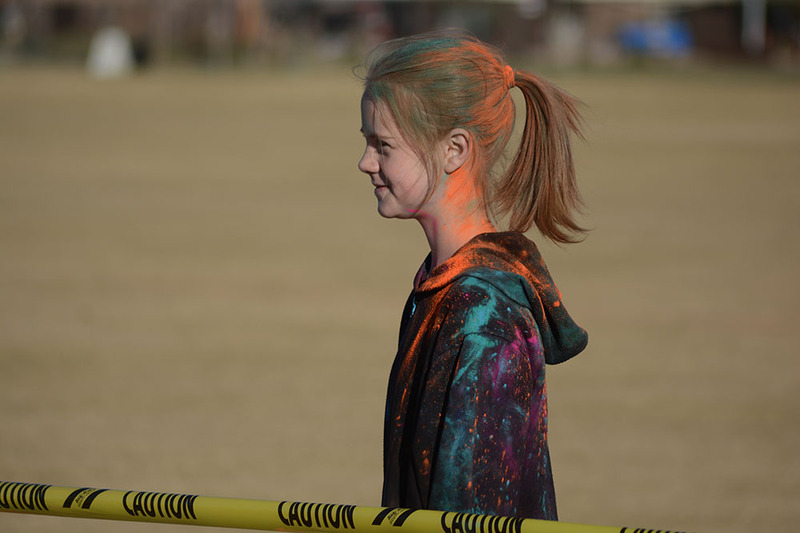 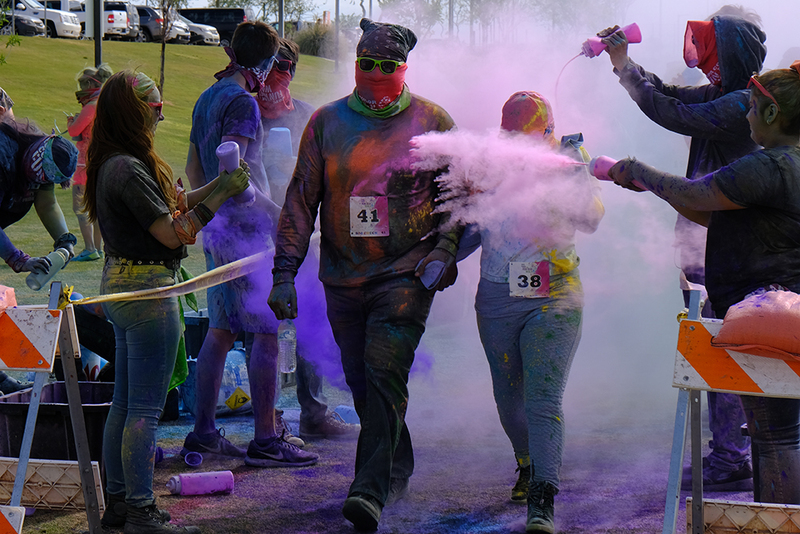 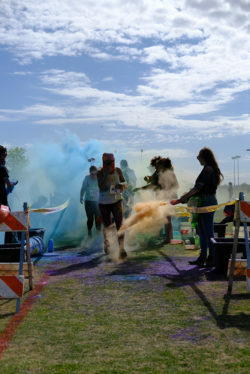 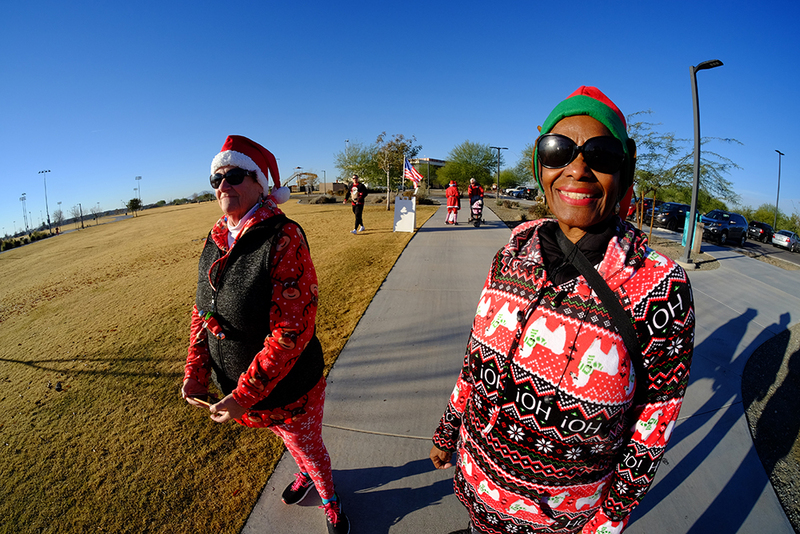 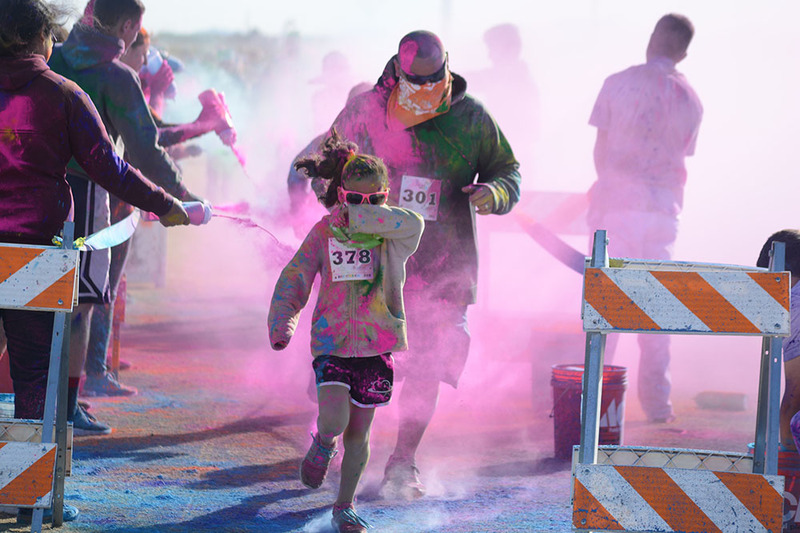 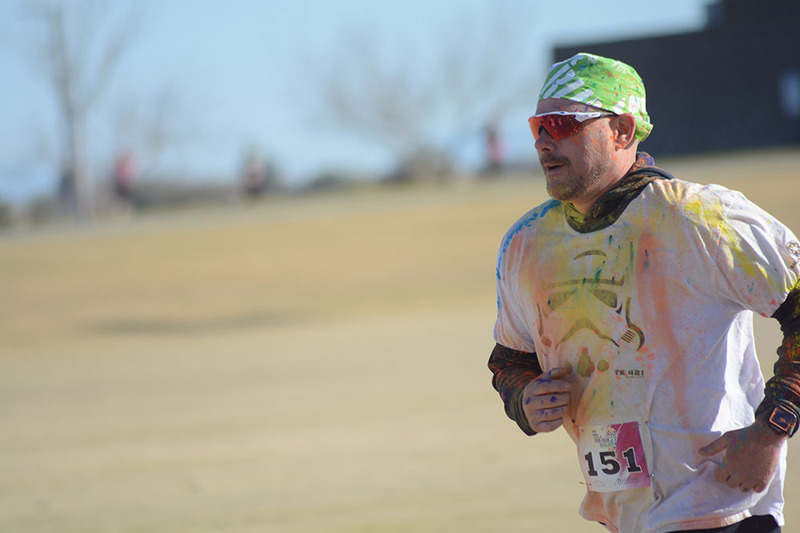 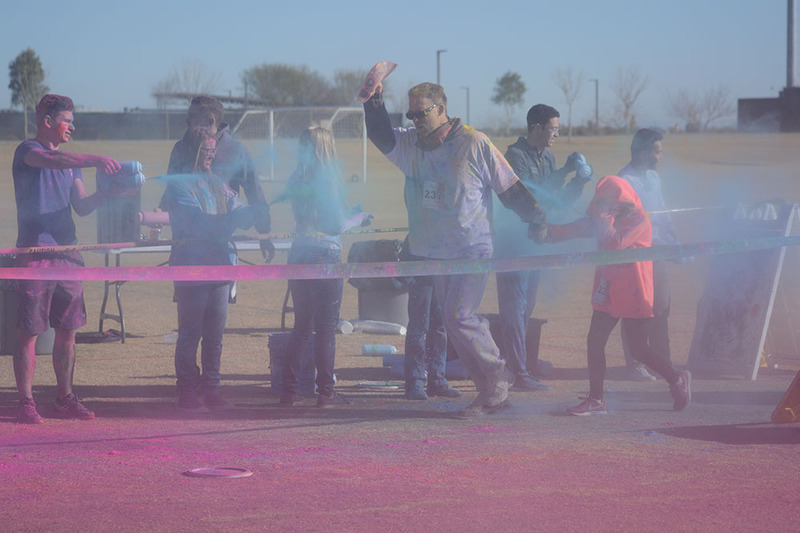 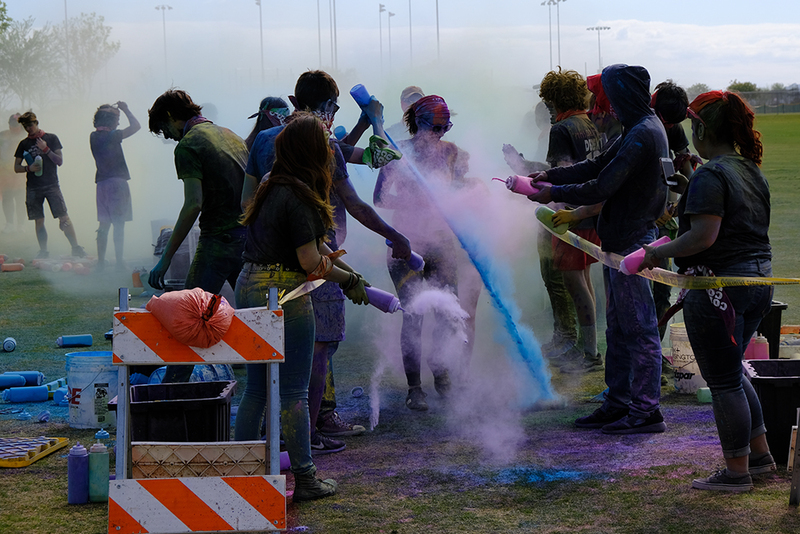 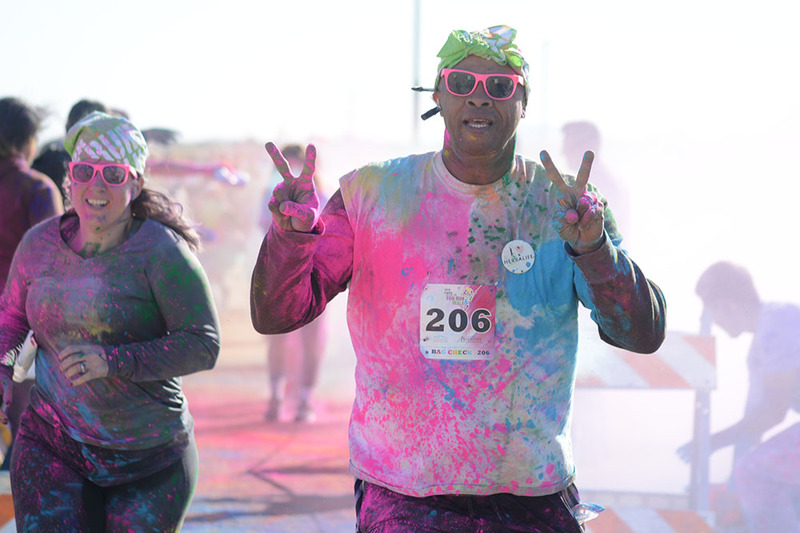 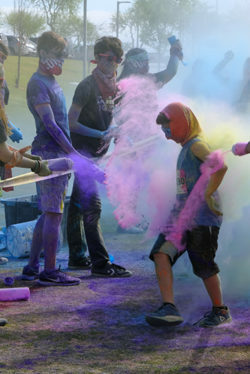 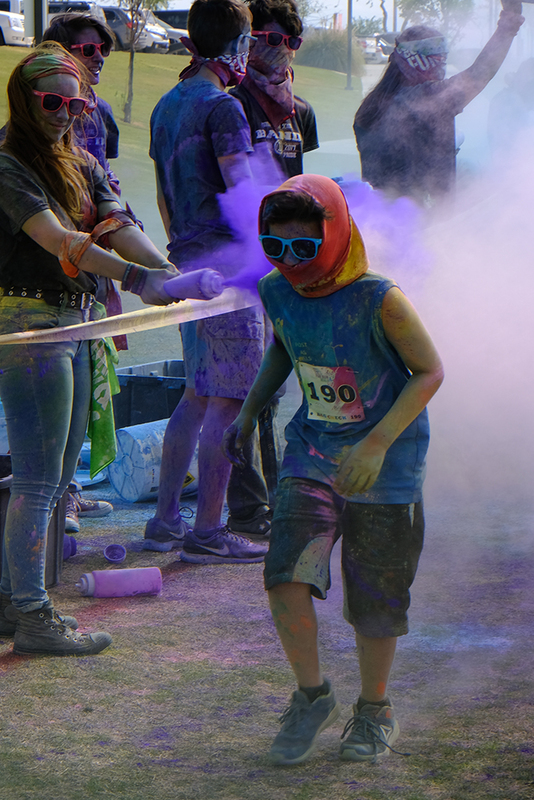 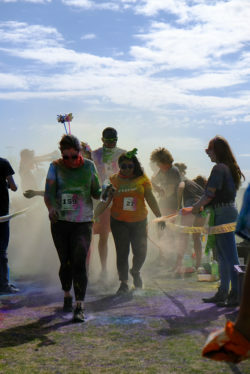 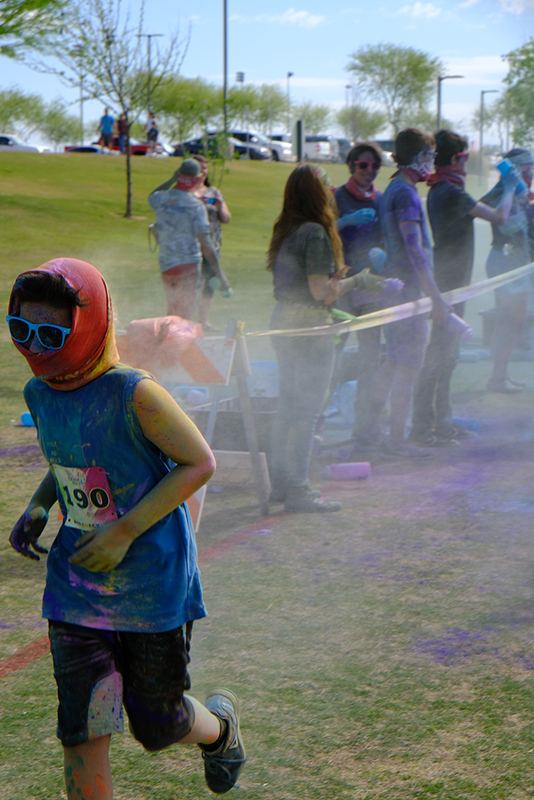 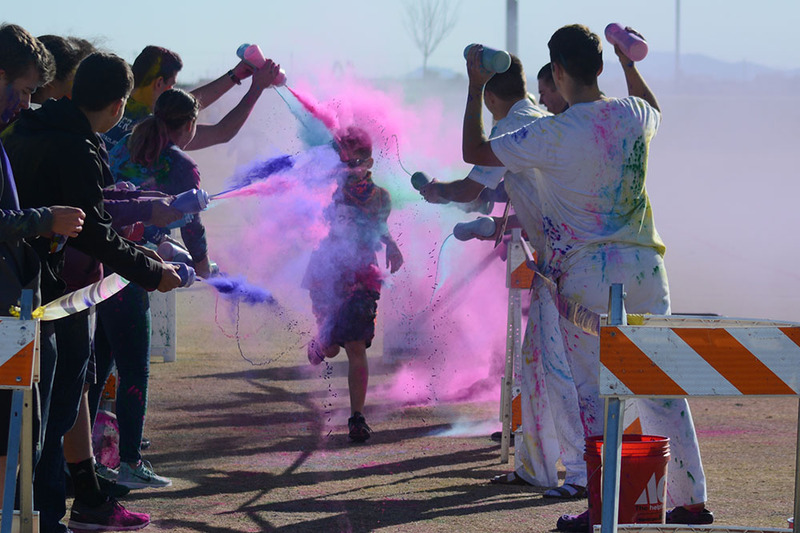 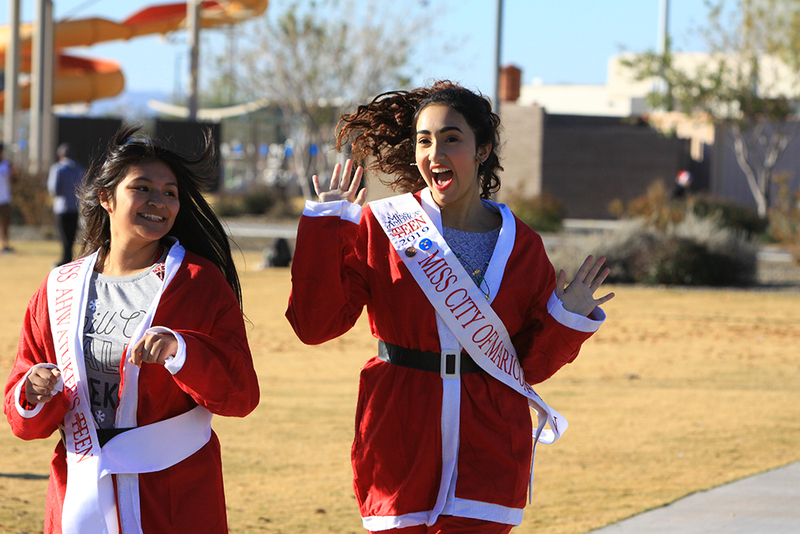 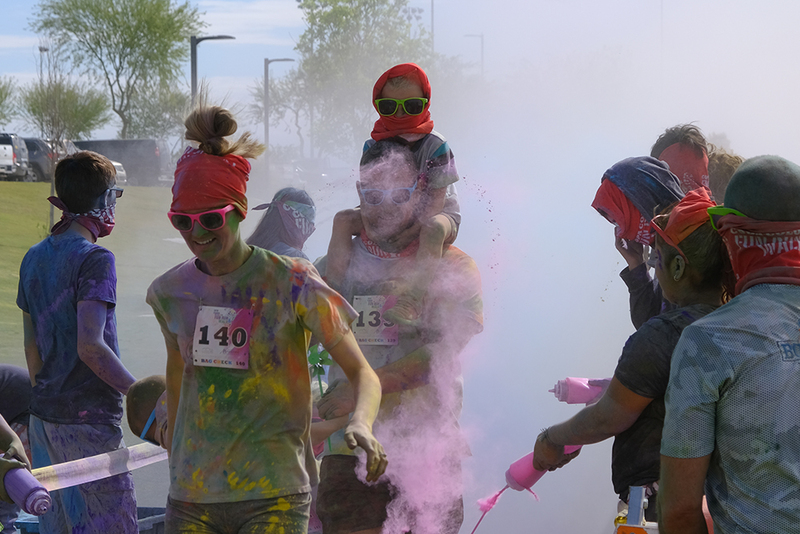 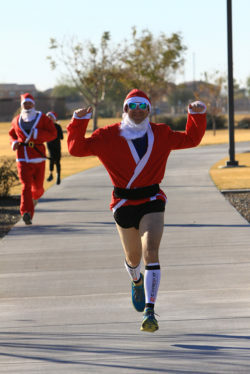 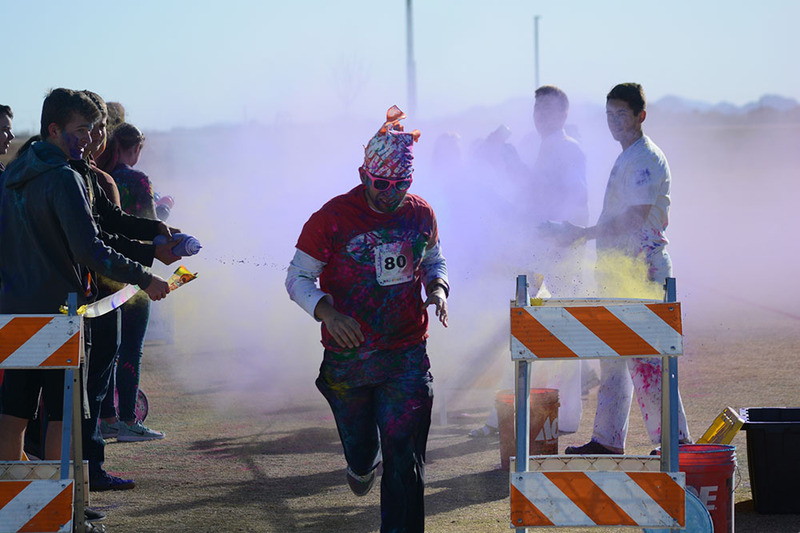 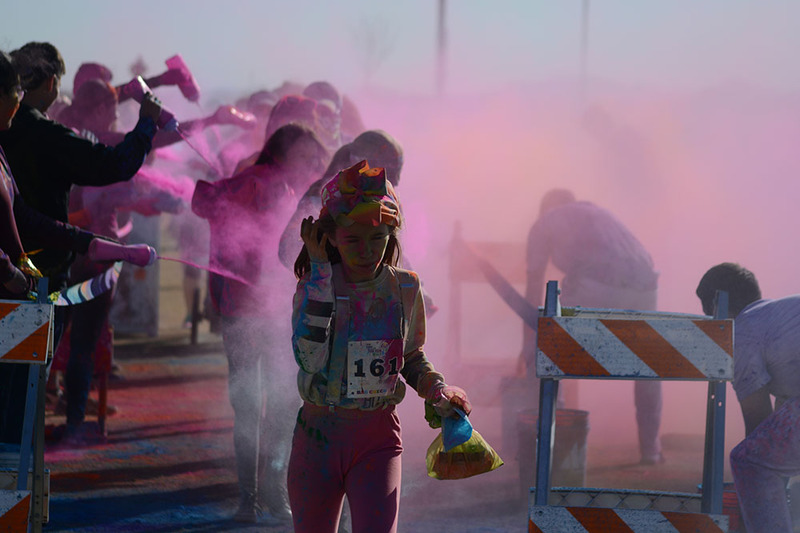 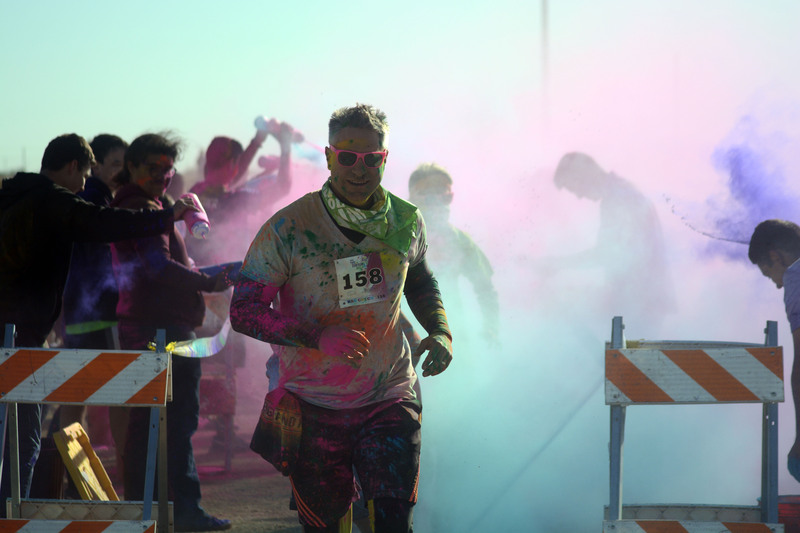 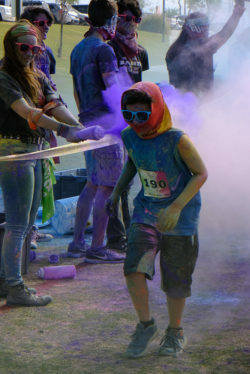 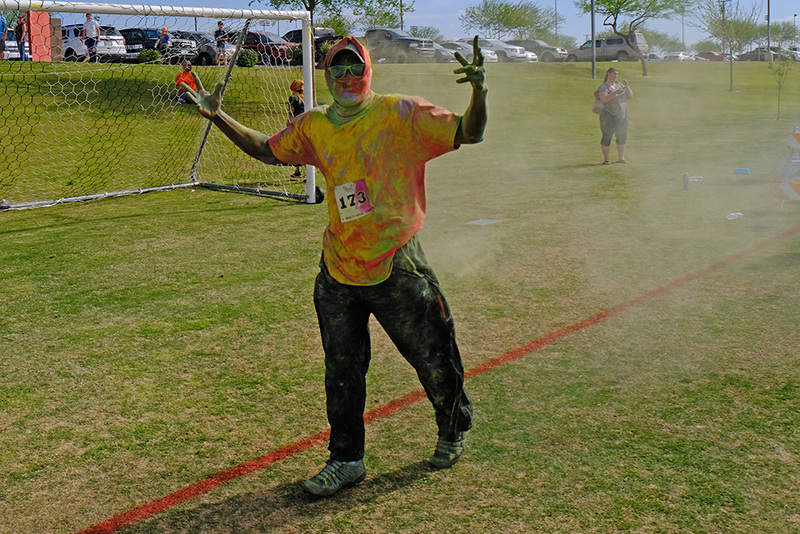 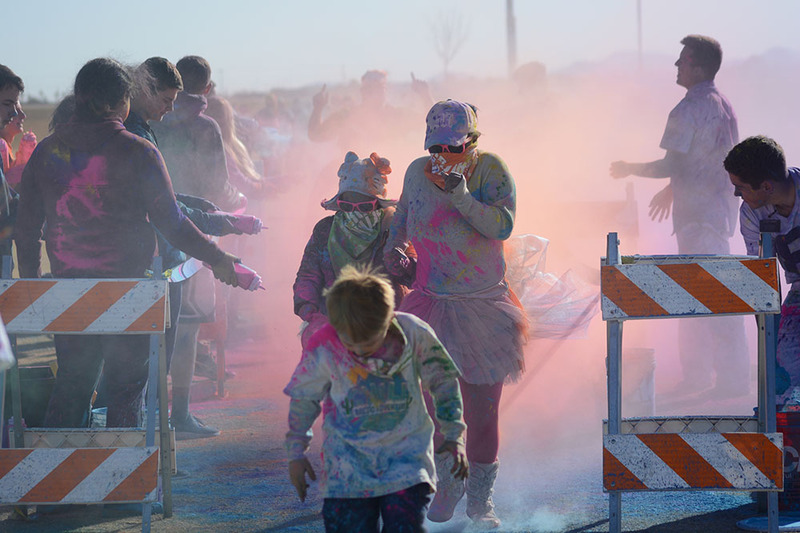 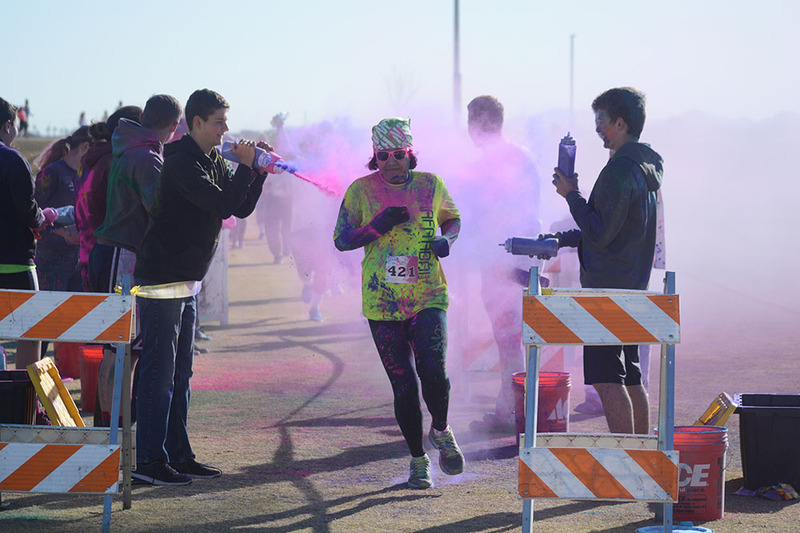 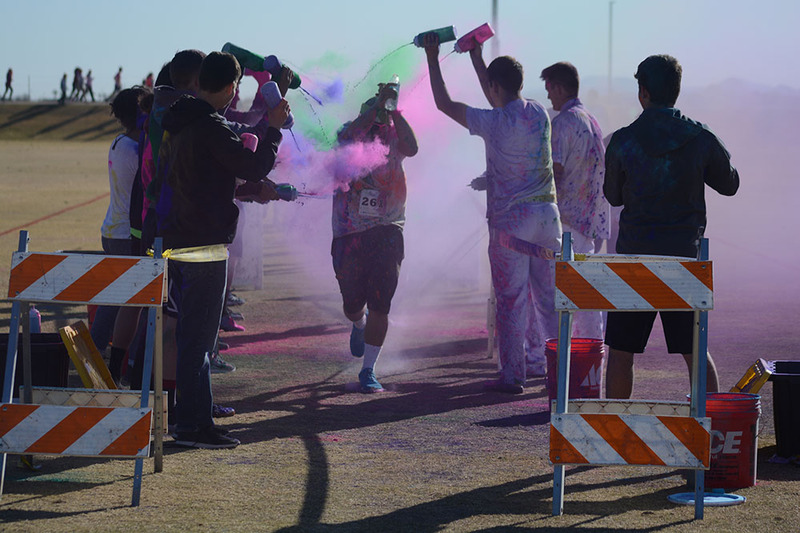 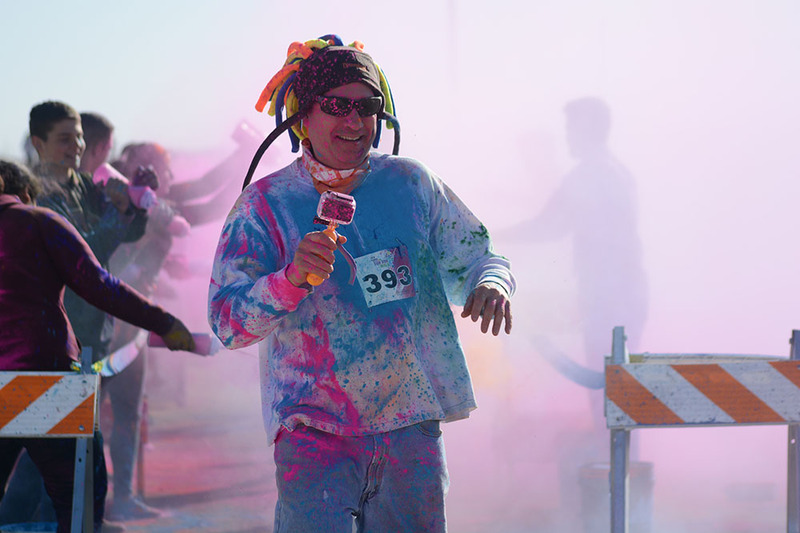 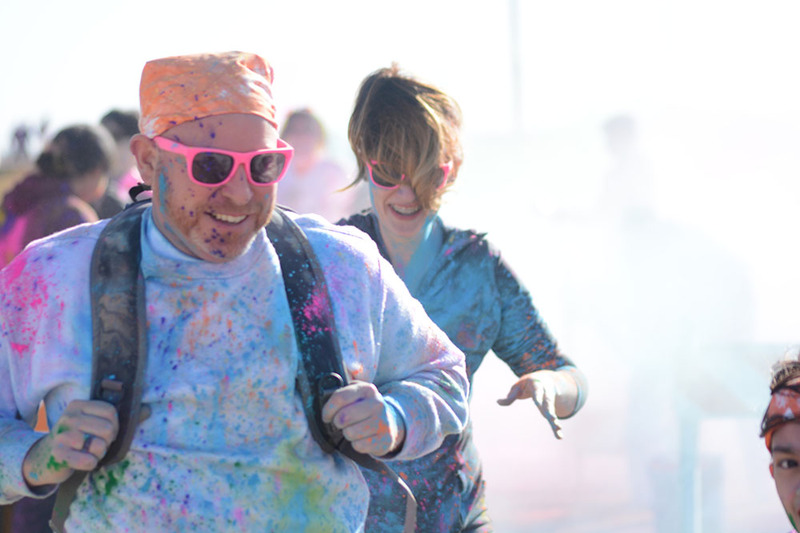 Packets can also be retrieved the morning of the event beginning at 7 a.m.
Feb. 24, the City of Maricopa hosted the annual Copa Color Run at Copper Sky, with participants running or walking a 3K or one mile while being dashed with colored powder. 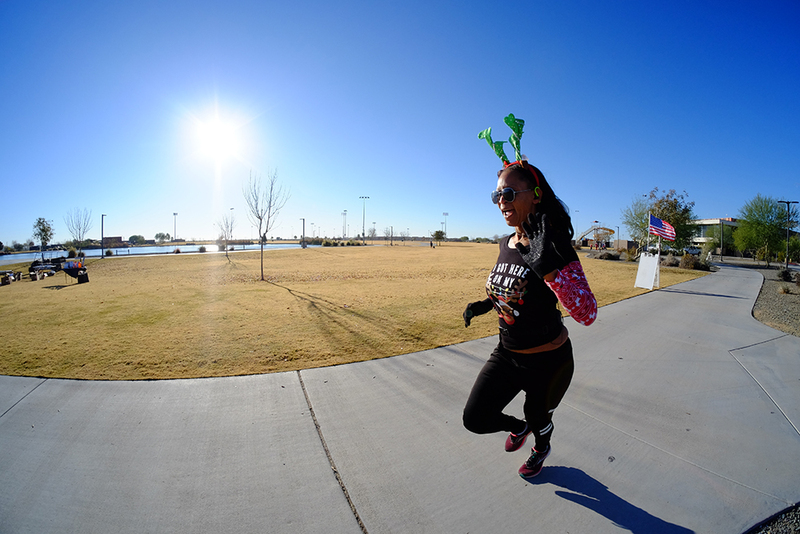 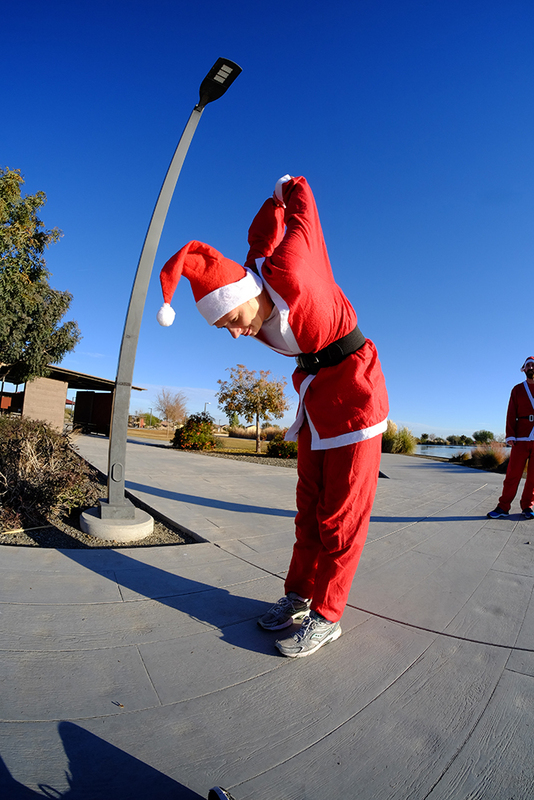 The fun run raises funds for recreational events at the city. 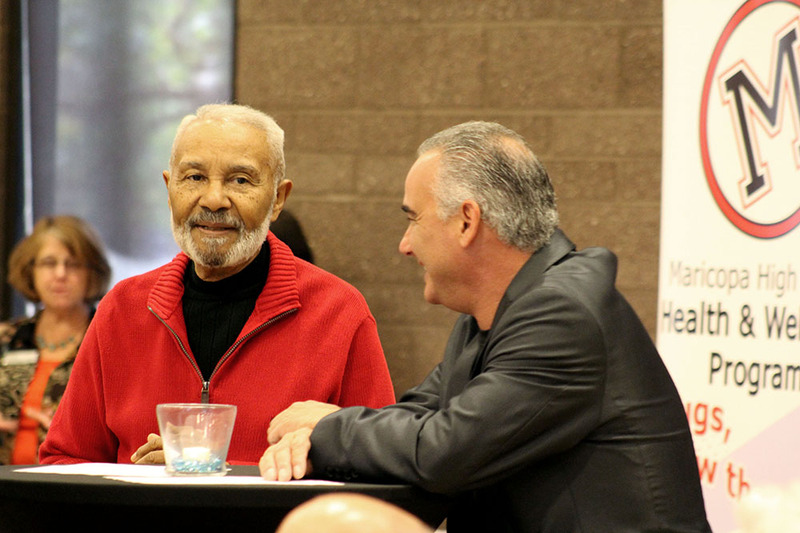 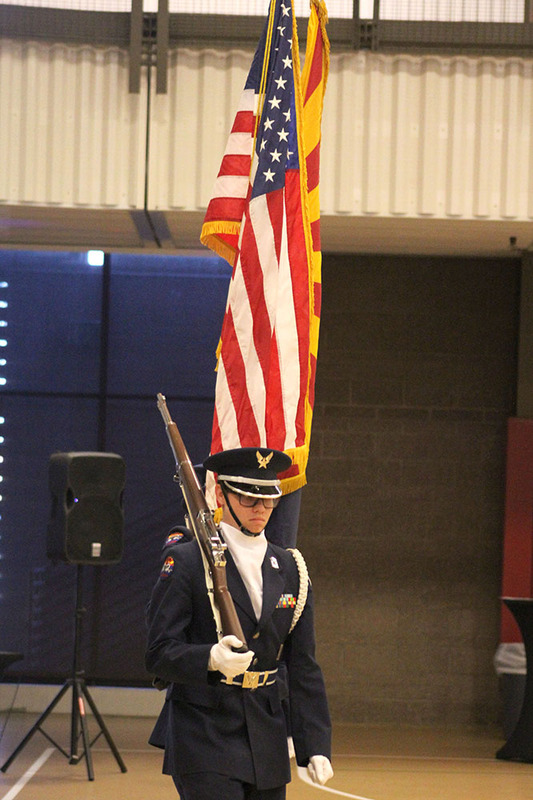 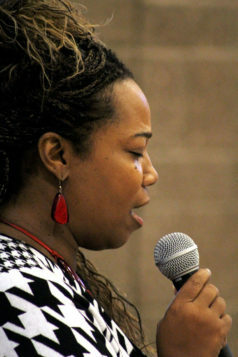 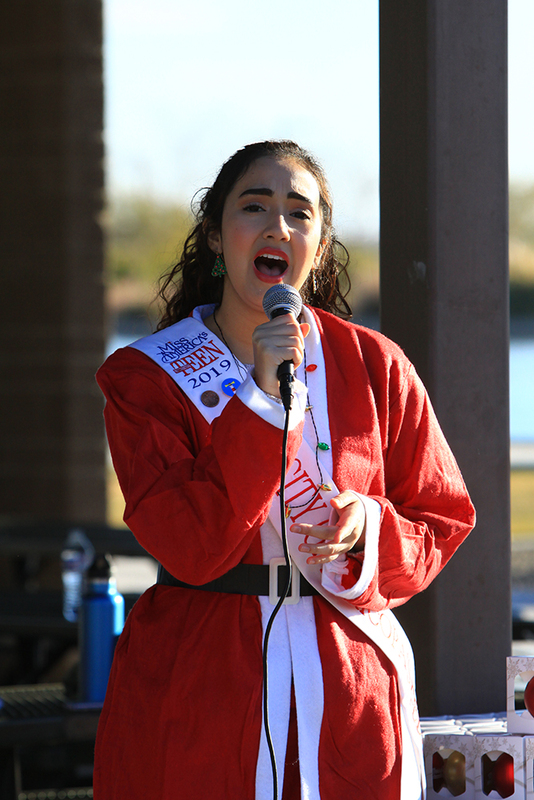 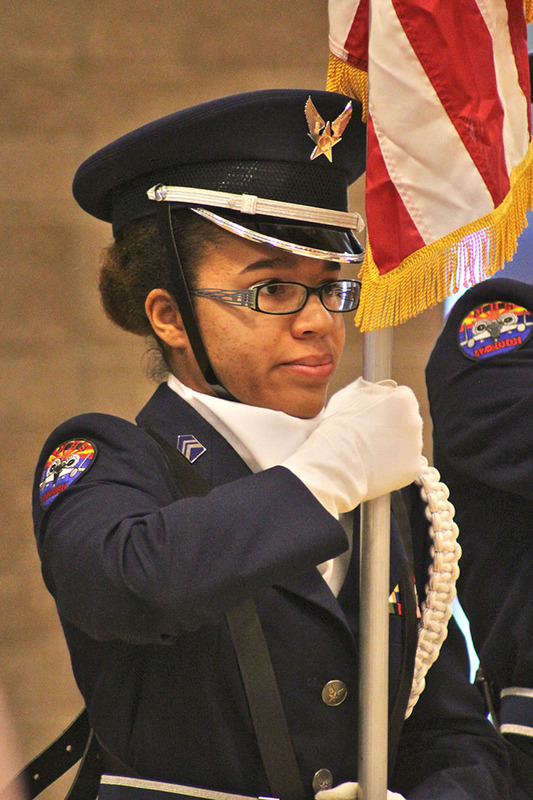 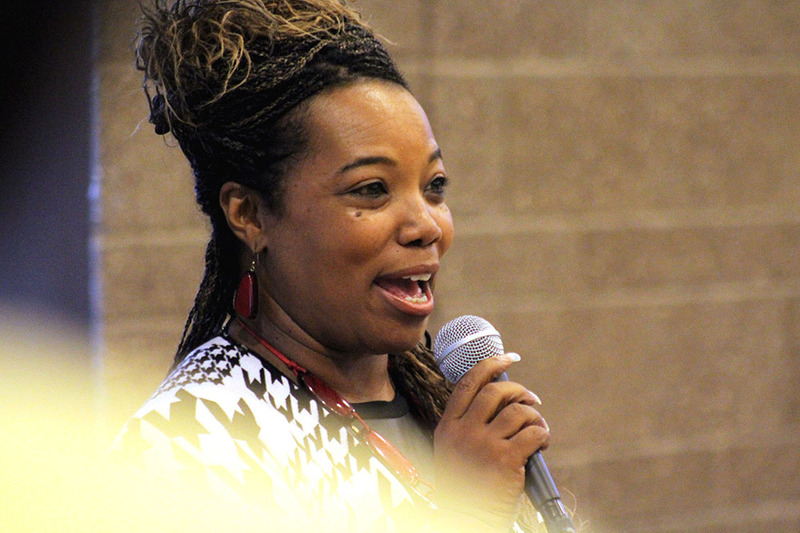 Maricopans remembered the life of Martin Luther King Jr. Monday at Copper Sky. 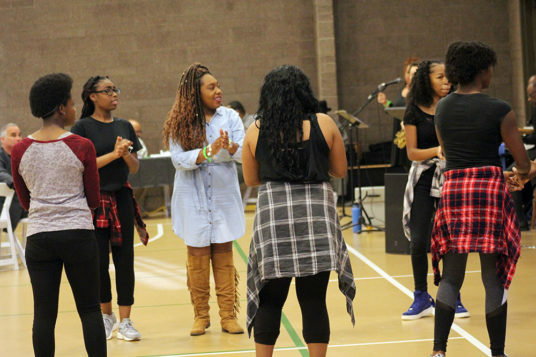 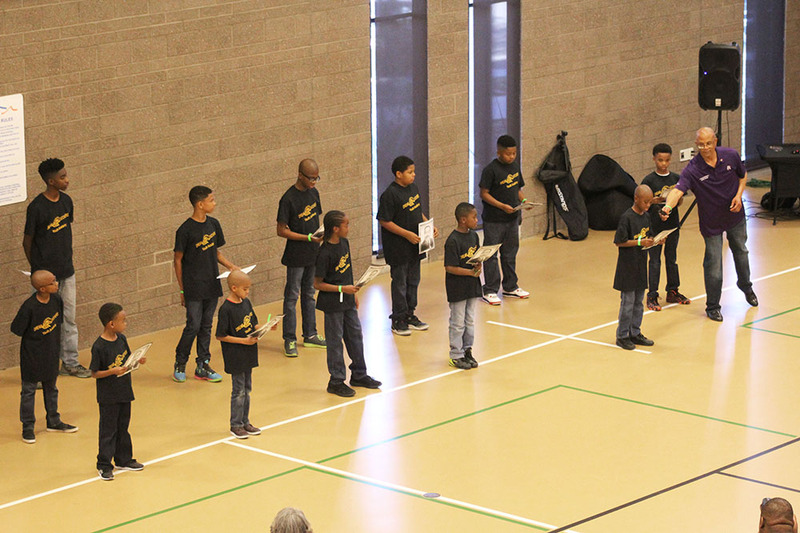 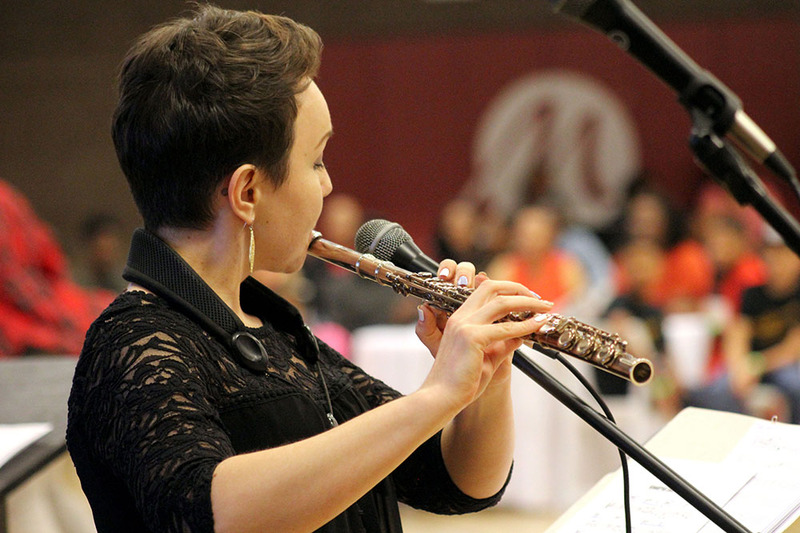 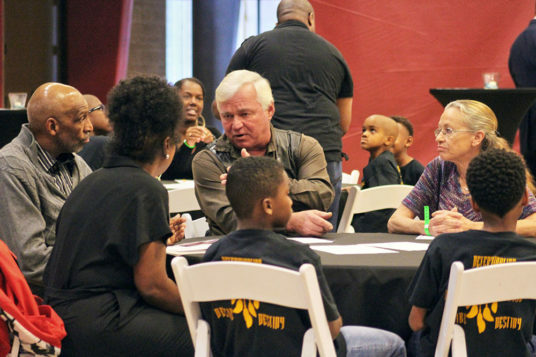 The third annual Martin Luther King Celebration featured appearances by notable city leaders, local youth groups and residents. 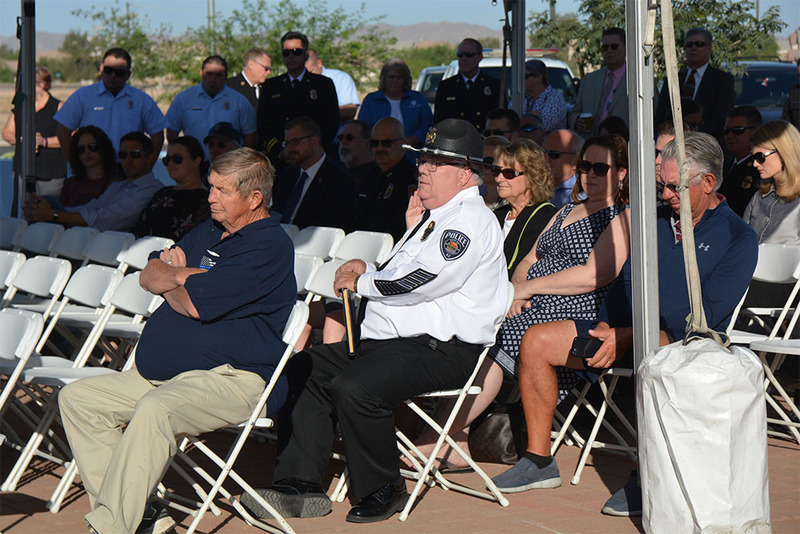 Speeches from councilmembers Henry Wade, Marvin Brown and Vice Mayor Peg Chapados preceded one by keynote speaker Floyd Galloway. 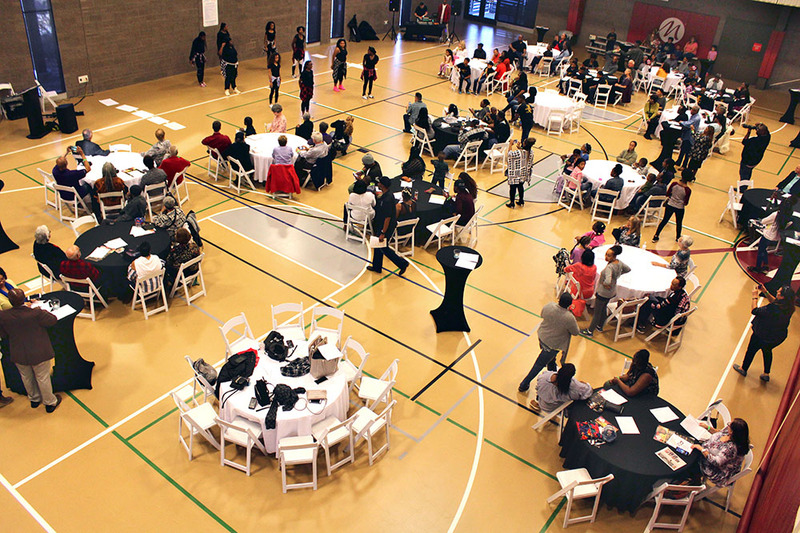 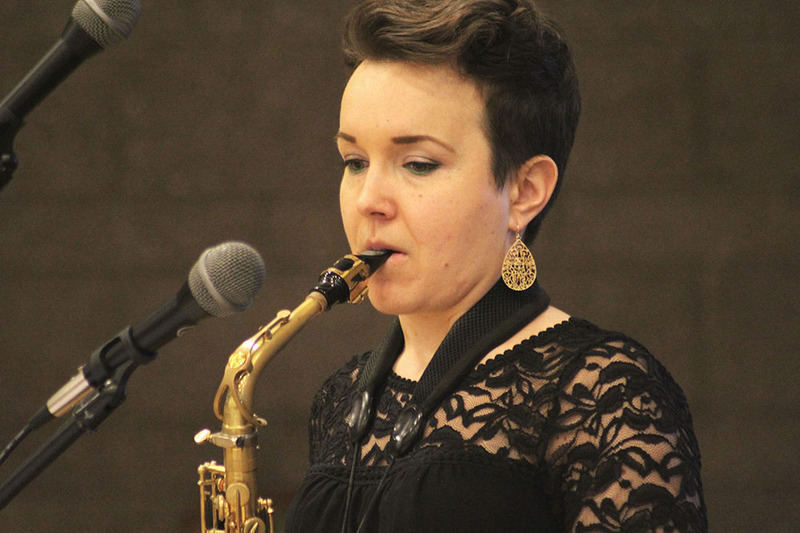 The sold out event featured live music, dancing and brunch. 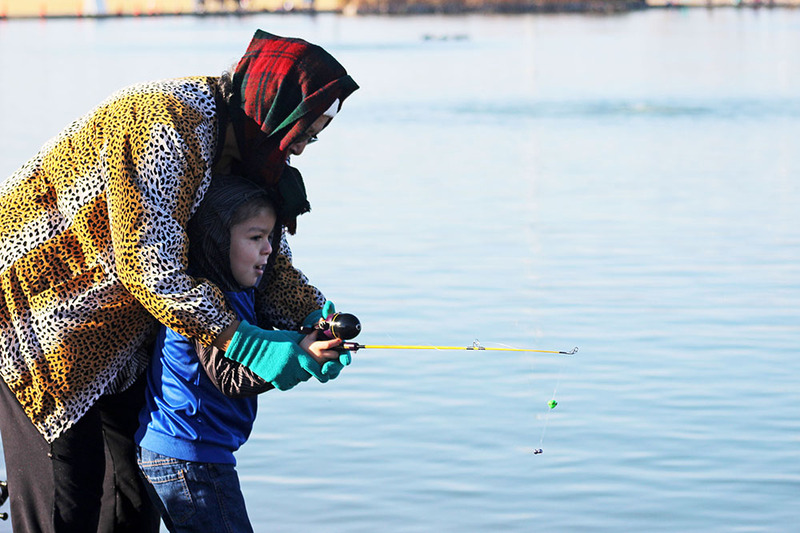 Anglers of all ages were greeted with perfect winter weather during the annual Family Fishing Day at Copper Sky Lake Saturday morning. The event, hosted by the City of Maricopa, included agents from the Arizona Game & Fish Department who provided fishing tips and equipment to attendees before a community barbecue sponsored by Fry’s Marketplace. 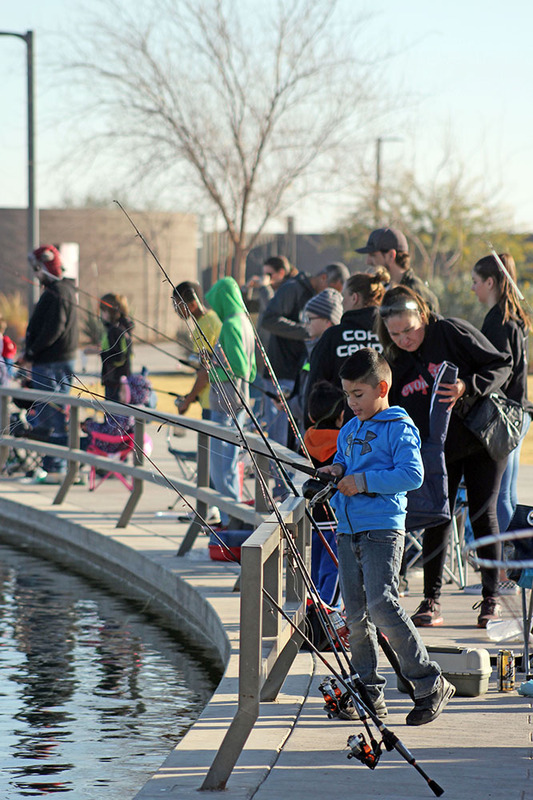 Anglers, both novice and experienced, will take to the lake at Copper Sky for the city’s annual Family Fishing Day. 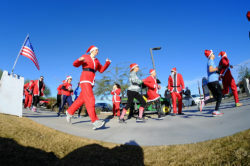 The 14th annual event begins at 8 a.m. on Jan. 13. Participants can register online or onsite the morning of the event at 7. Fishing licenses are not required for participants. 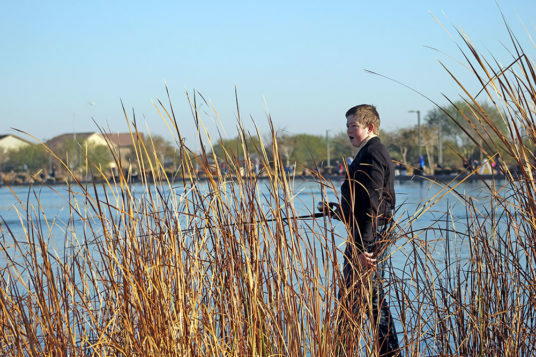 The five-acre lake will be stocked with bass, catfish, rainbow trout, bluegill and white amur. Each participant can keep up to four fish, said Niesha Whitman, City of Maricopa events and marketing coordinator. 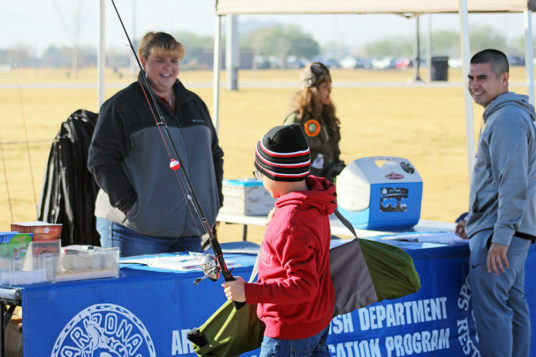 As in previous years, the Arizona Game and Fish Department will provide fishing clinics and the city will issue “loaner” fishing kits with a rod, reel and bait to each participant. A fishing pole can also be purchased for $5. 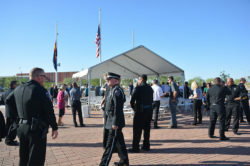 The city will offer a barbecue lunch for participants at the event. 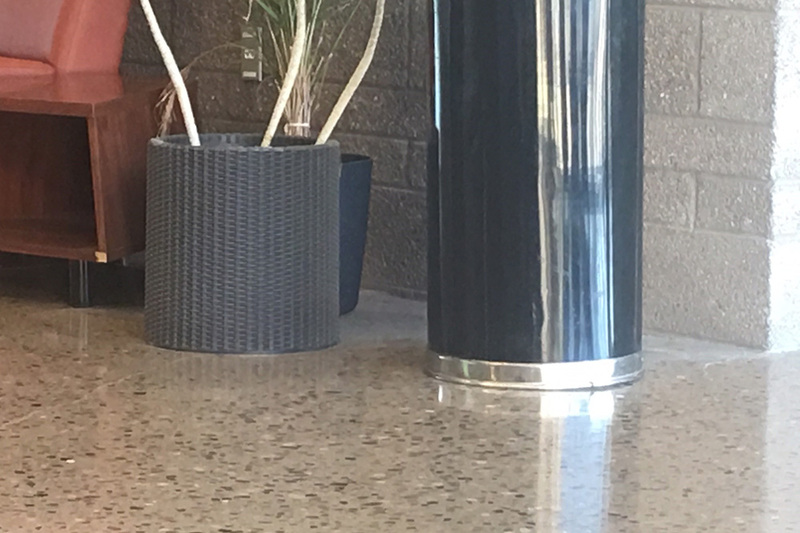 The meal consists of a hot dog or pulled pork, cupcake, potato chips and a drink for $5. 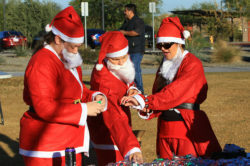 One dollar can also buy children a goodie bag filled with prizes, Whitman said. 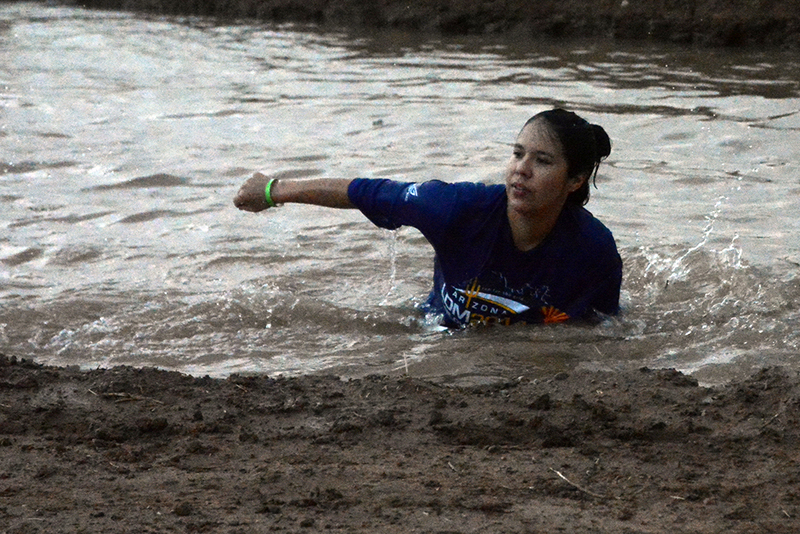 When: Jan. 13, 8 a.m. The Maricopa City Council batted down the extension of a janitorial contract Tuesday due to what some members said was sub-par service. The one-year contract, valued at nearly $340,000, was to be granted to Carnation Building Services Inc., the city’s previous janitorial service provider. 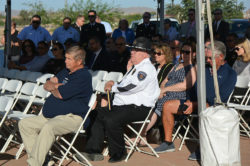 However, Mayor Christian Price and others on council expressed dissatisfaction with both the quality of service and what they felt was an inadequate bidding process. 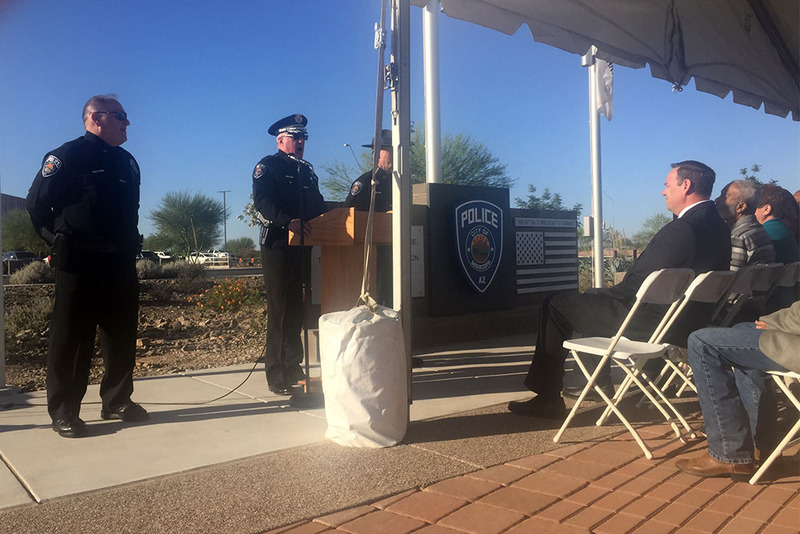 “I don’t want to say we haven’t been happy, but I can’t say that we’ve been thrilled with this particular service here,” Price said. 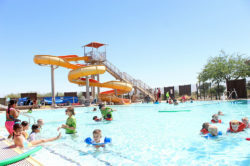 Both Price and Councilmember Vincent Manfredi referenced instances in which both constituents and themselves personally have been to Copper Sky Recreation Complex when the facilities were unusually dirty. 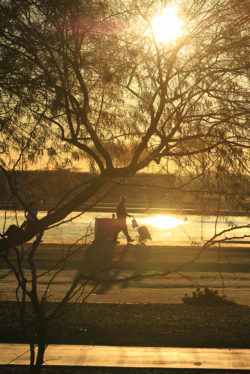 In photos submitted to InMaricopa, areas around Copper Sky can be seen to be only partially clean, with certain surfaces and areas behind furniture left dusty. 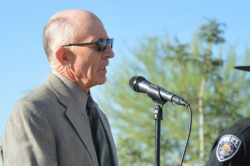 Price said one possible solution would be to divide the contract into multiple, smaller contracts. 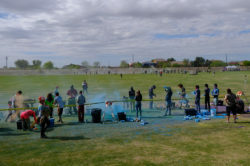 By doing this, he said, it would not only allow for a more fair and competitive bidding process but also may allow for more specialized janitorial services. 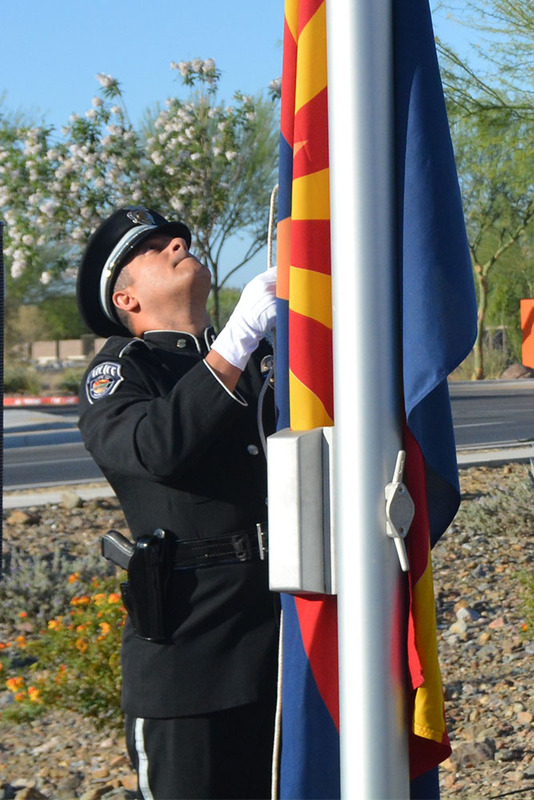 The contract currently includes the cleaning of City Hall, Copper Sky, the Fire Administration and Public Works offices and special events. The broad scope of the contract, Price said, is where the city is going wrong. “It makes me wonder if we haven’t hindered ourselves by putting together this entire quote, because they’re different things,” Price said. Price compared it to going to Costco and needing mayonnaise but being forced to buy a tub of mayonnaise because it is all they offer. 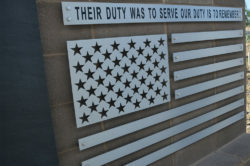 “You might save some money in some respects, but you might waste a lot, too,” Price said. Price suggested separating the contract into basic janitorial services and additional special events and/or Copper Sky services. 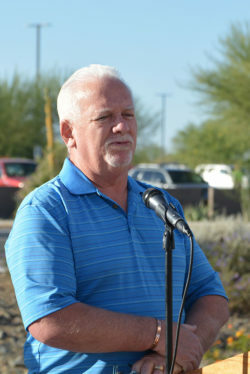 Public Works Director Bill Fay said the average number of received bids for any government contract is around 4.2 bids per contract. However, this contract received considerably less than that. 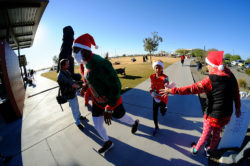 That number could have much greater, Price said, if the contract were separated so businesses that specialize in offices could bid on a contract that doesn’t include special events or fitness centers. Furthermore, Price said, by continuing the contract, the city is doing a disservice to paying members of Copper Sky who may notice the unclean areas and decide to discontinue their memberships. Council ultimately voted to reject the current contract and directed city staff to reconfigure the contract. 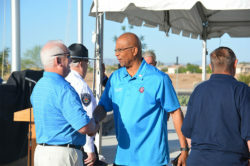 Carnation Building Services will likely continue on a month-to-month contract until the matter is resolved. 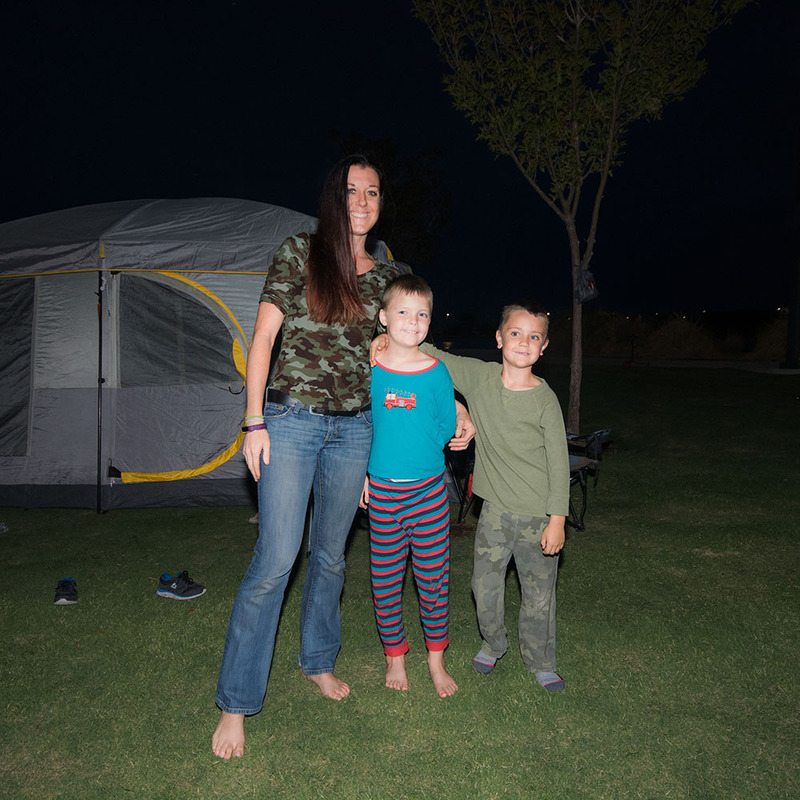 Copper Sky Regional Park hosted a Family Camp Out on Friday. 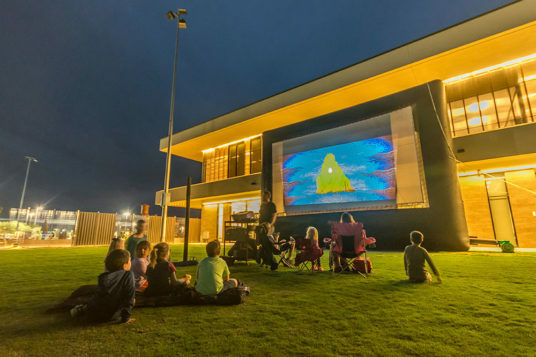 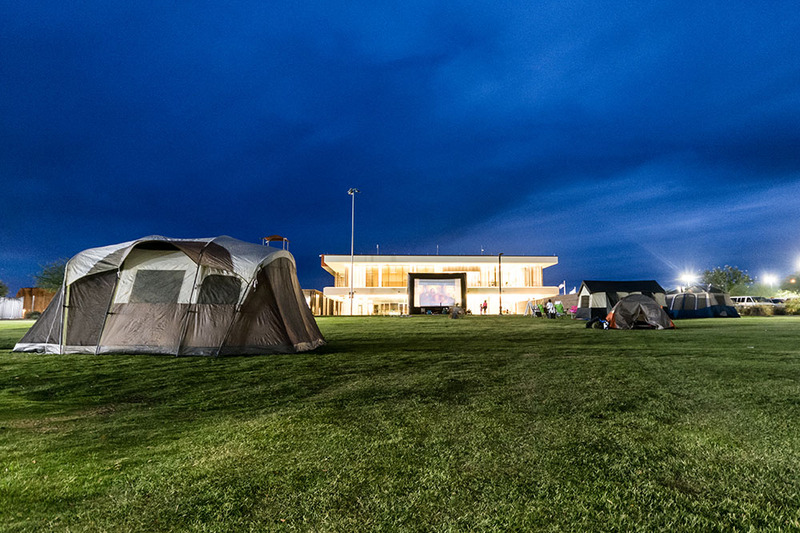 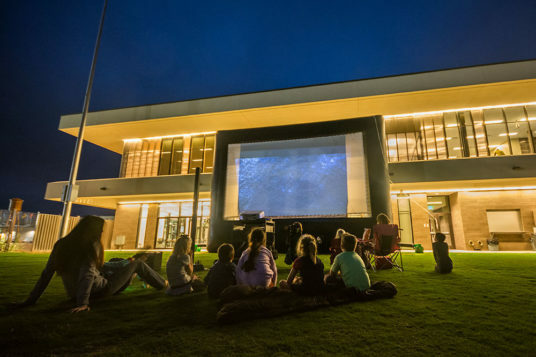 Families brought tents and overnight provisions and connected through campfire stories, a scavenger hunt and an outdoor screening of Moana. 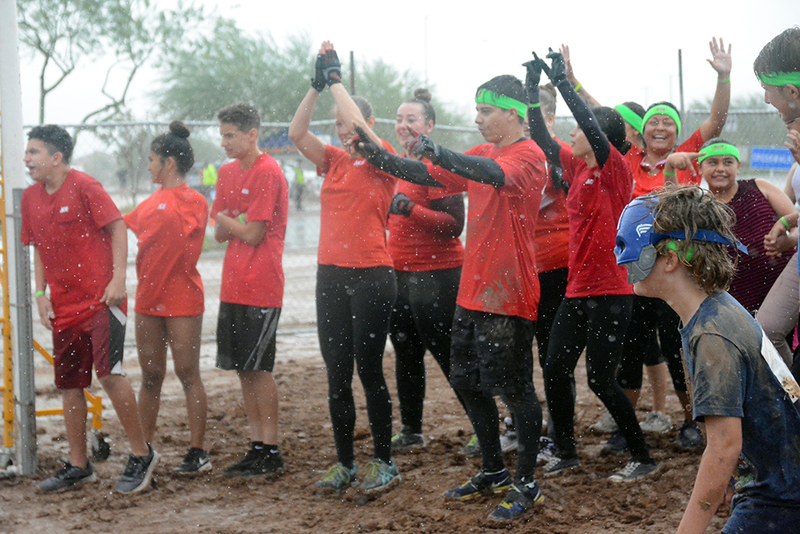 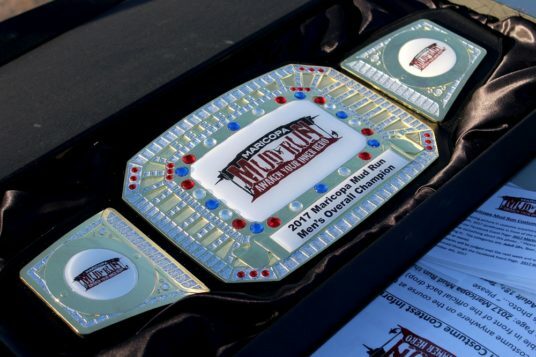 The 2017 version of Maricopa Mud Run drew hundreds of runners in multiple heats on Saturday at Copper Sky Regional Park. 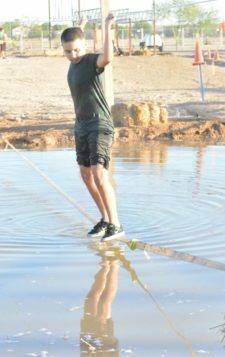 The fifth annual event sported a new course with new challenges along with the old favorites like the zipline. 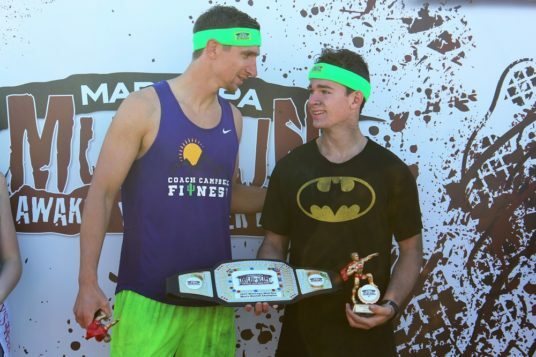 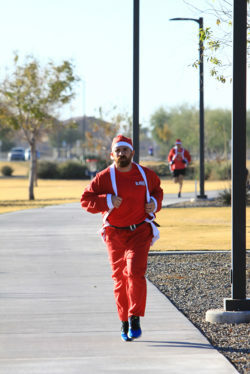 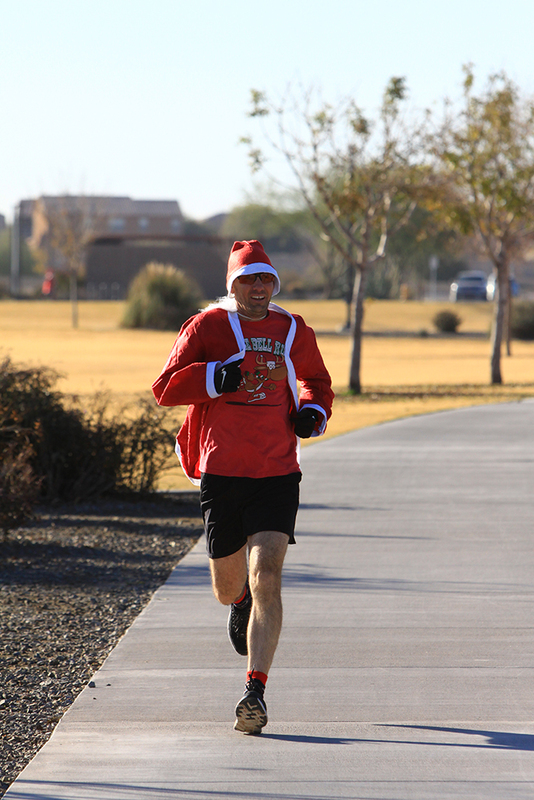 First finishers were Maricopa High School cross country runner Chet Carroll and fitness trainer Stephen Campbell. 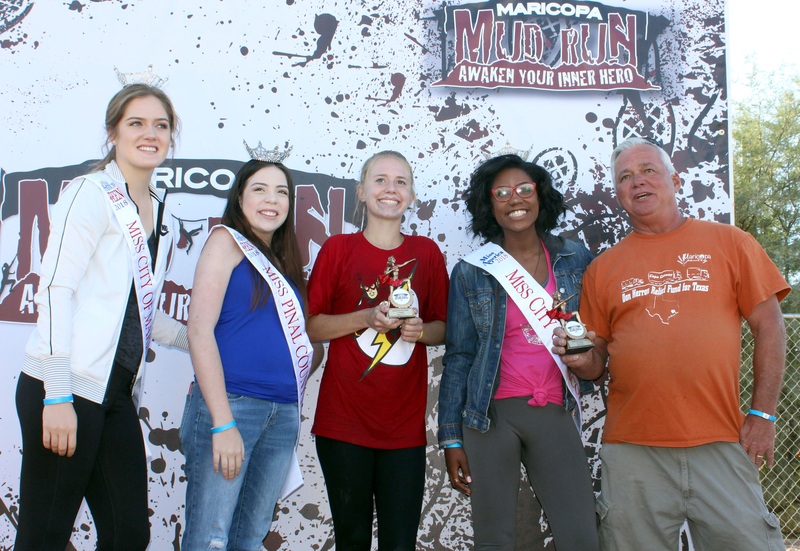 Winners of all categories received trophies and a chance to be photographed with Miss City of Maricopa Auna Littlejohn, Miss Pinal County Lindsay Hubbard, Miss City of Maricopa Outstanding Teen Mackenzie Ford and Miss Pinal County Outstanding Teen Terese Sanchez. 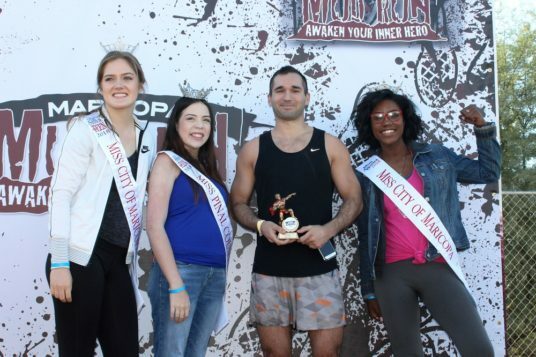 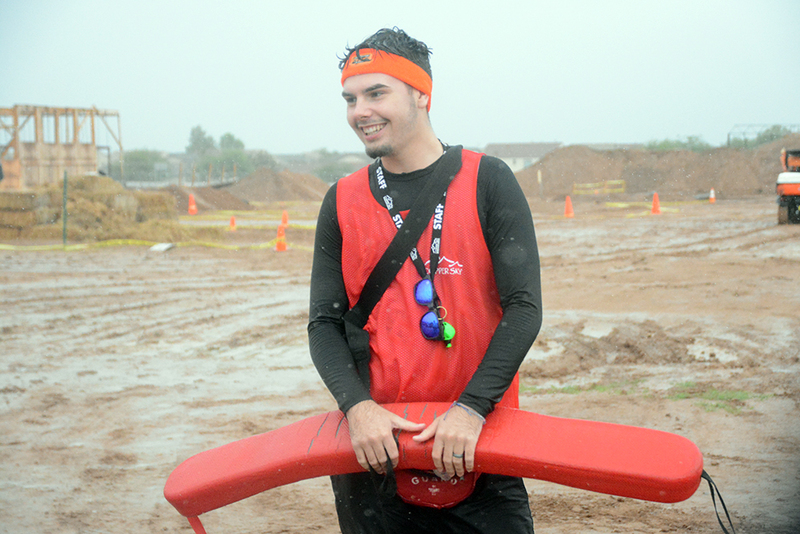 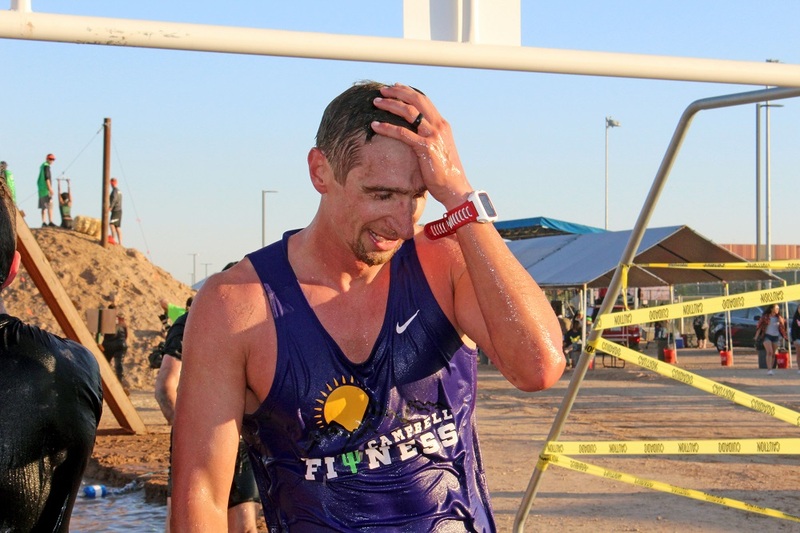 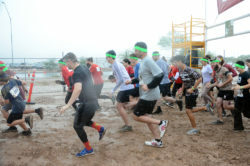 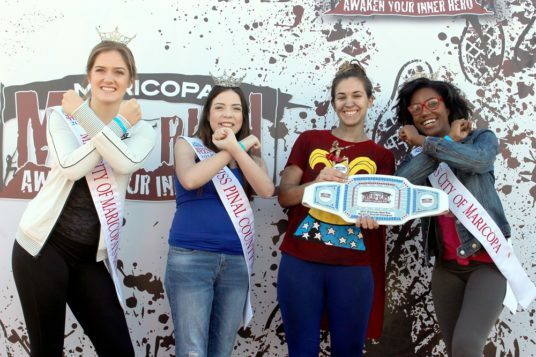 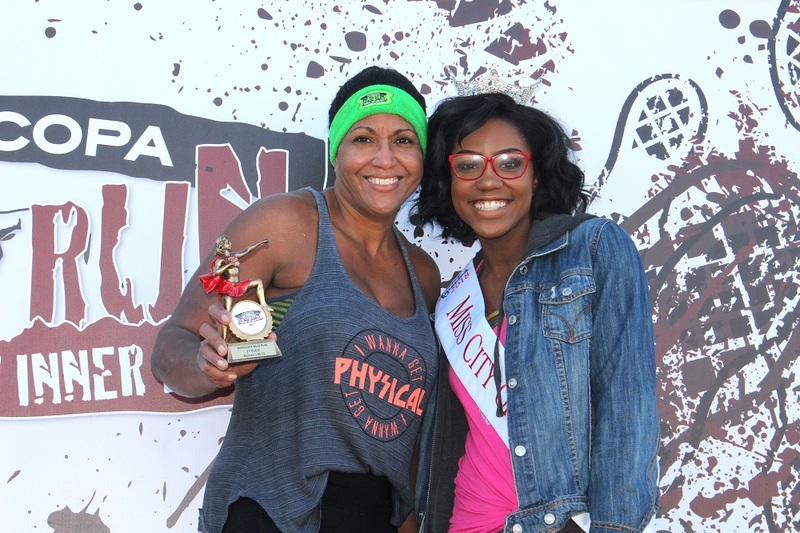 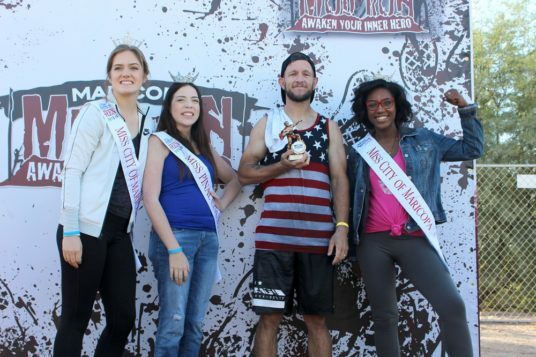 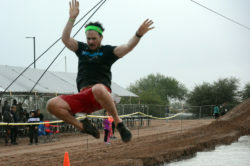 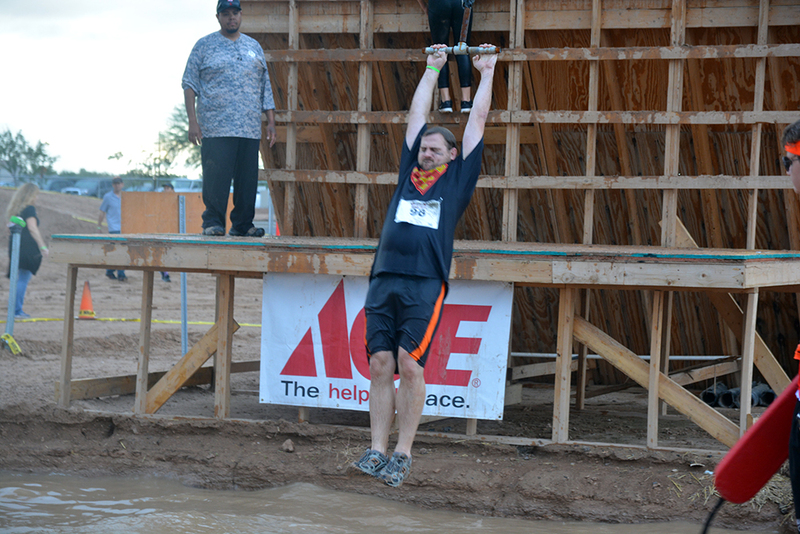 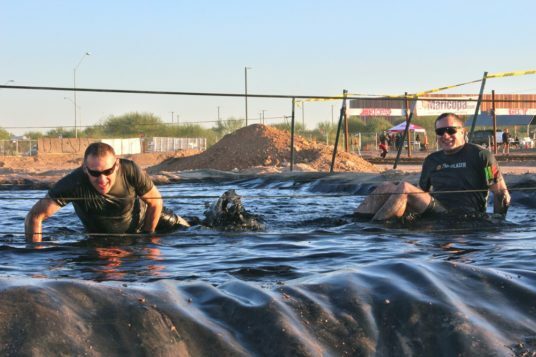 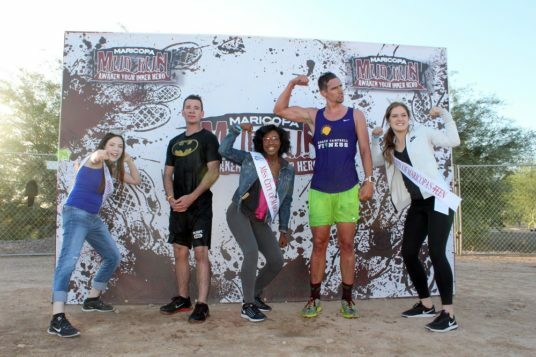 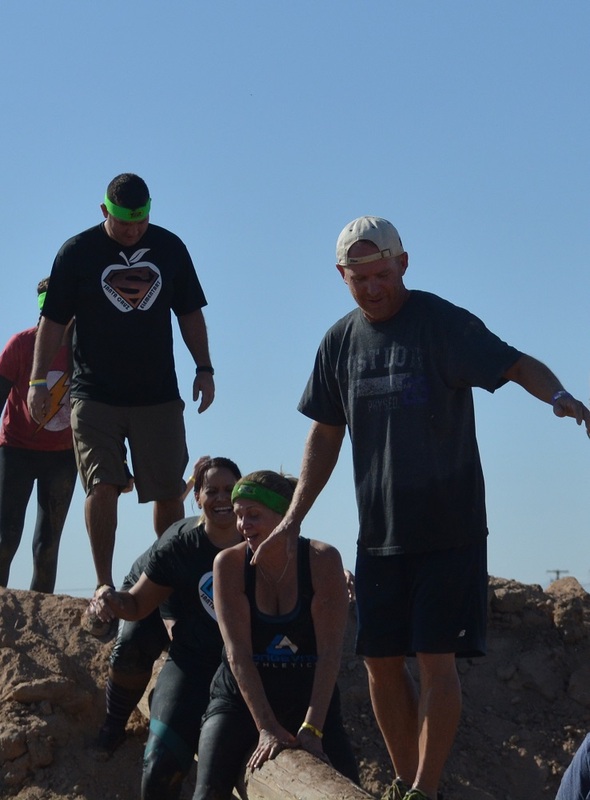 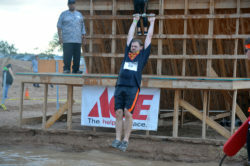 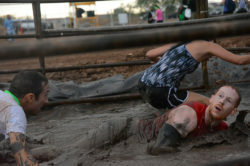 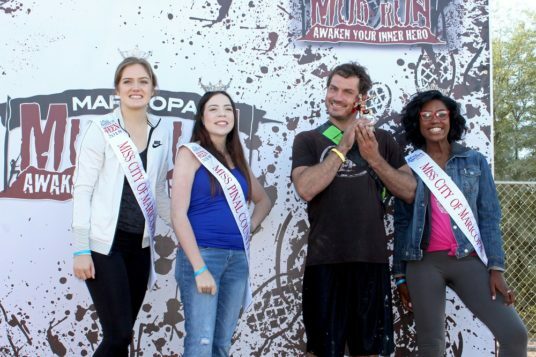 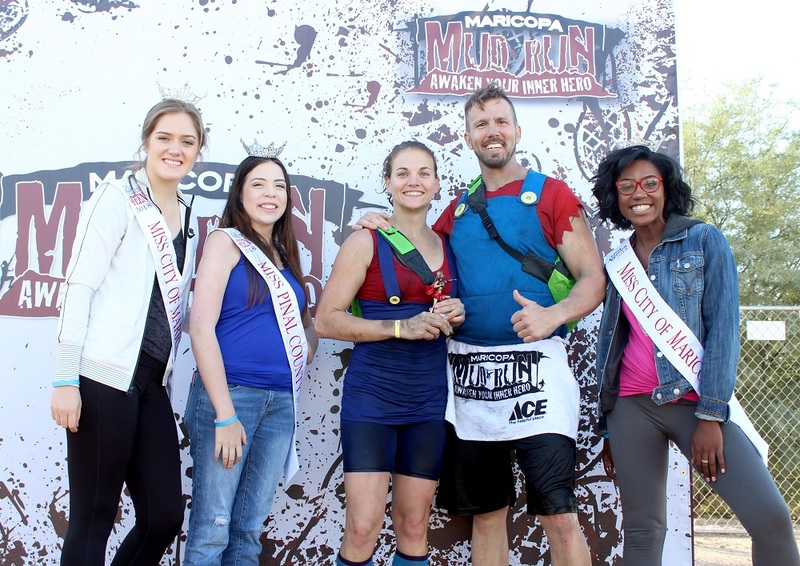 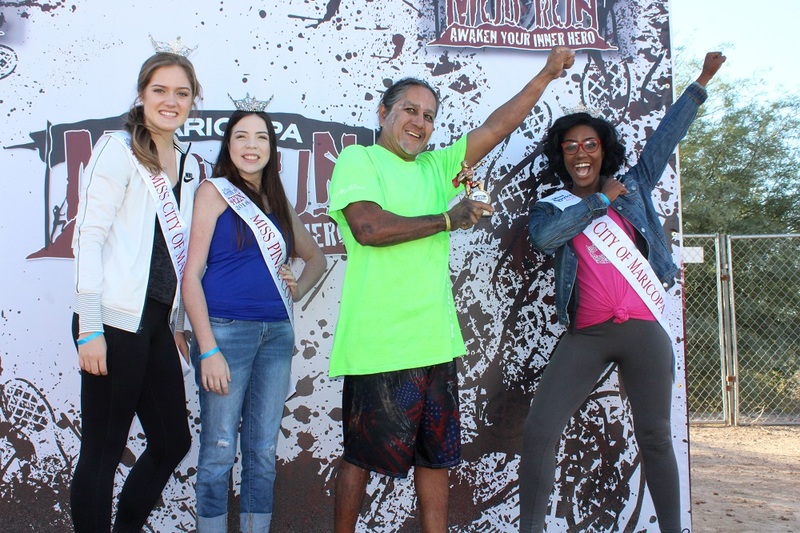 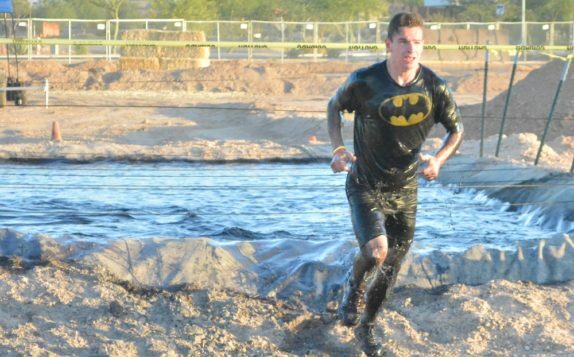 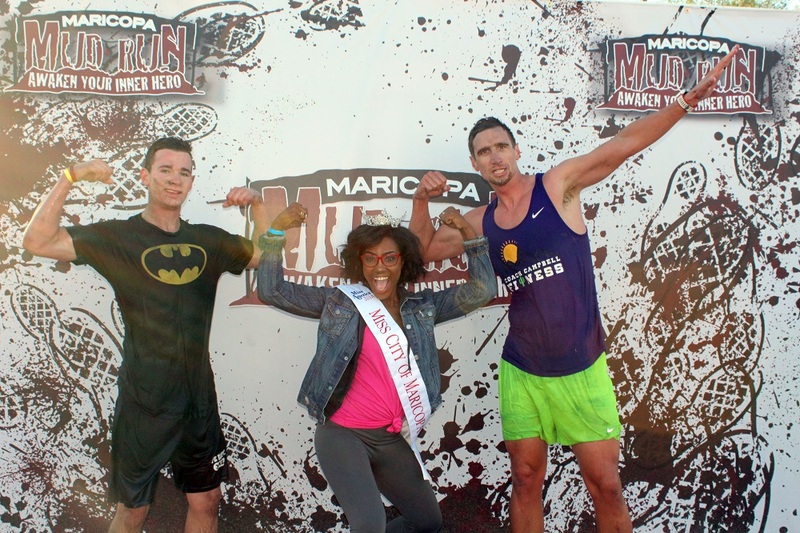 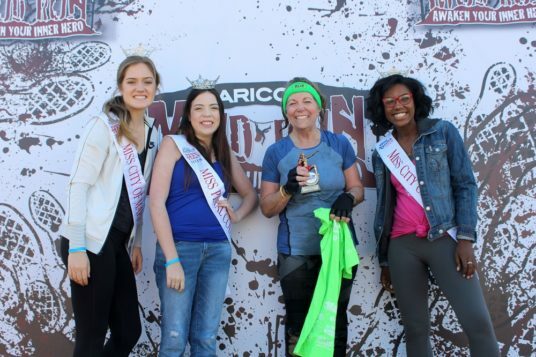 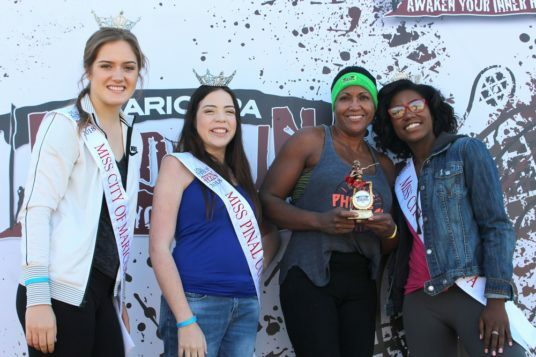 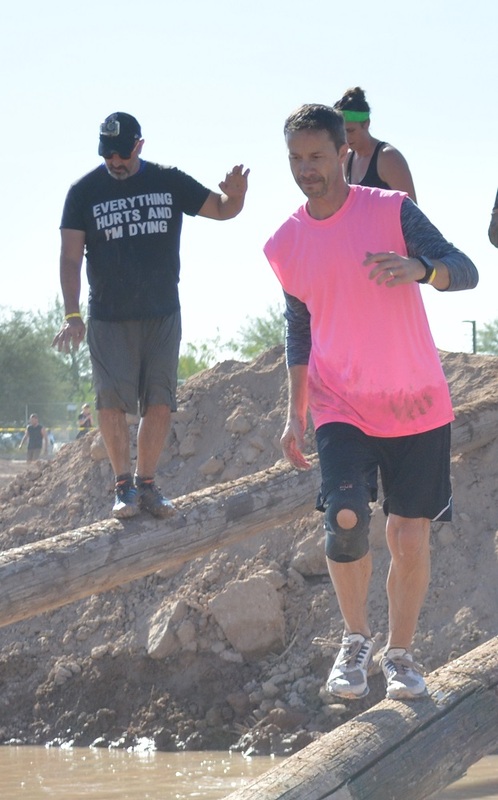 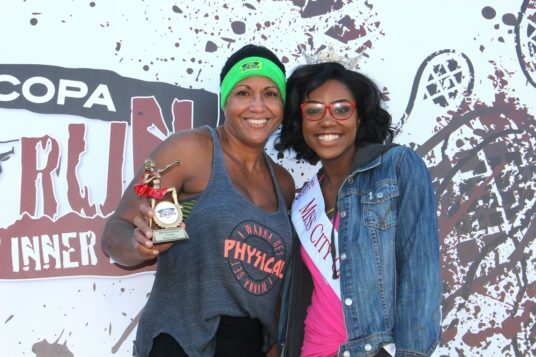 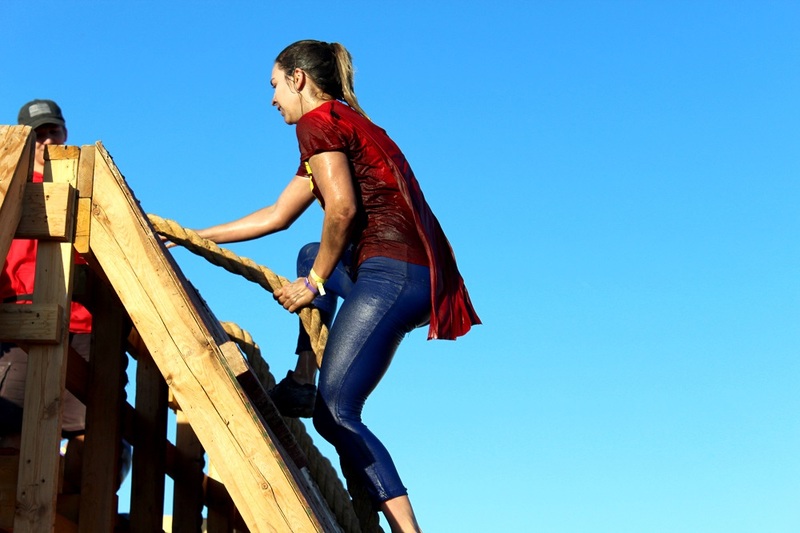 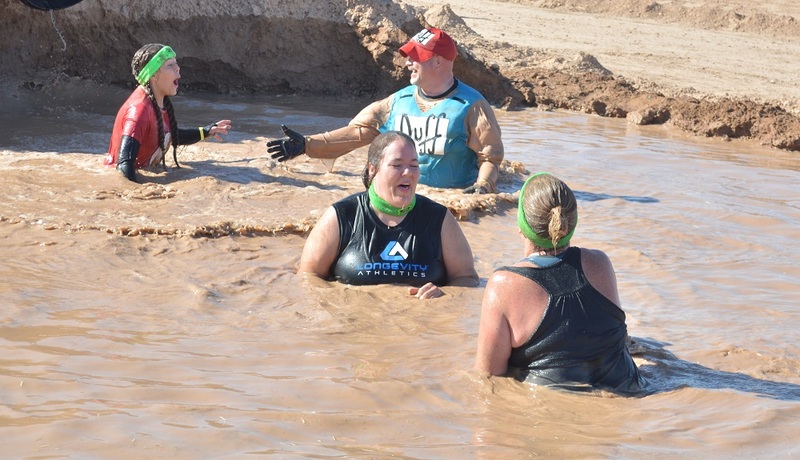 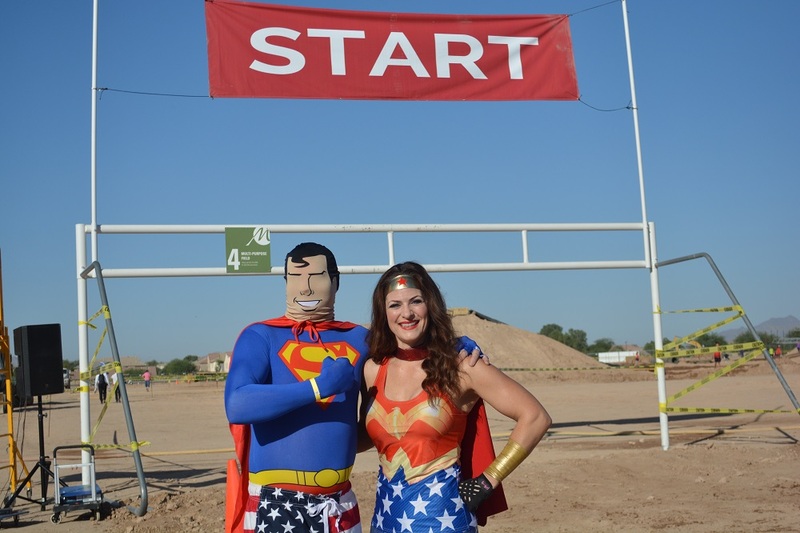 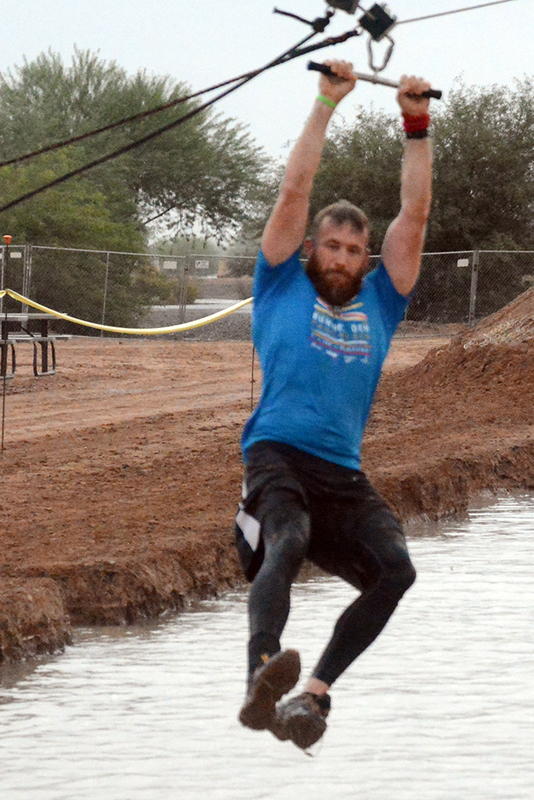 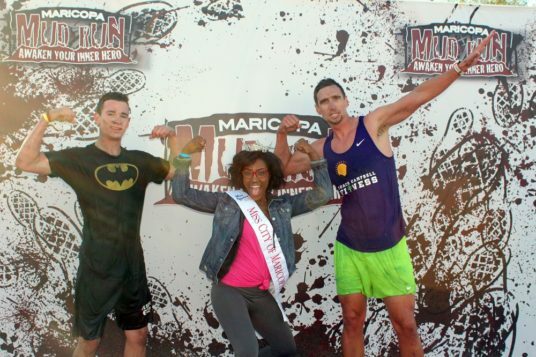 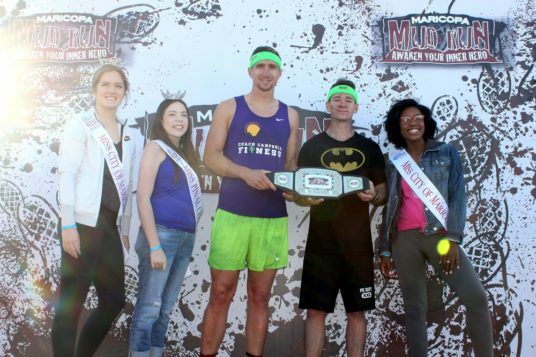 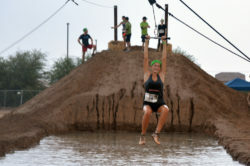 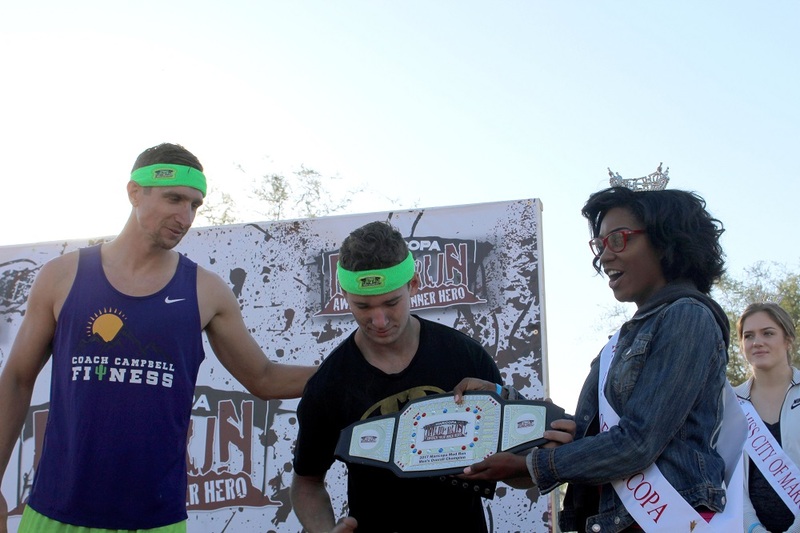 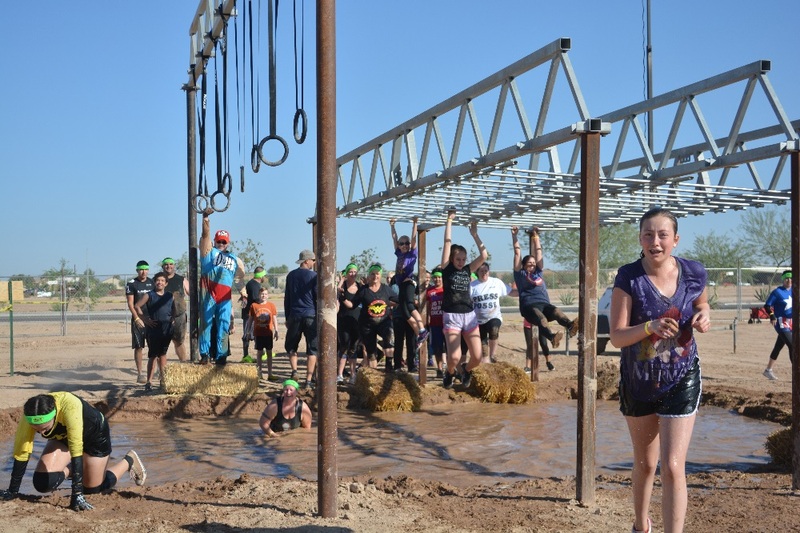 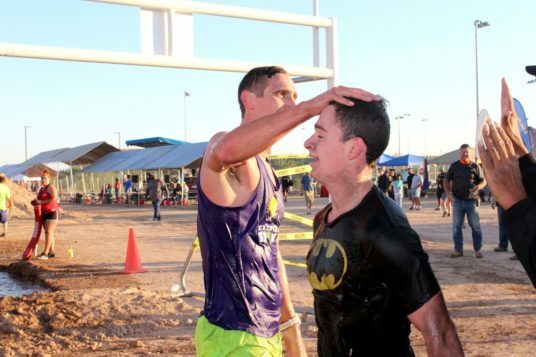 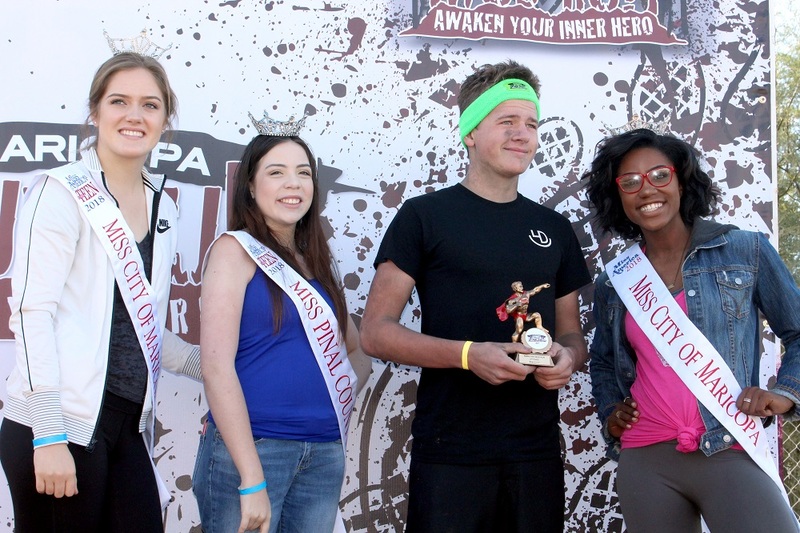 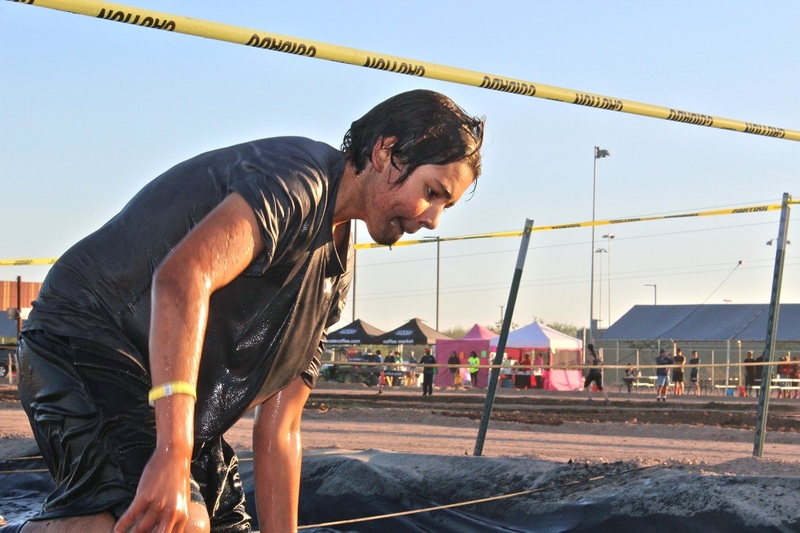 Were you in the Maricopa Mud Run? 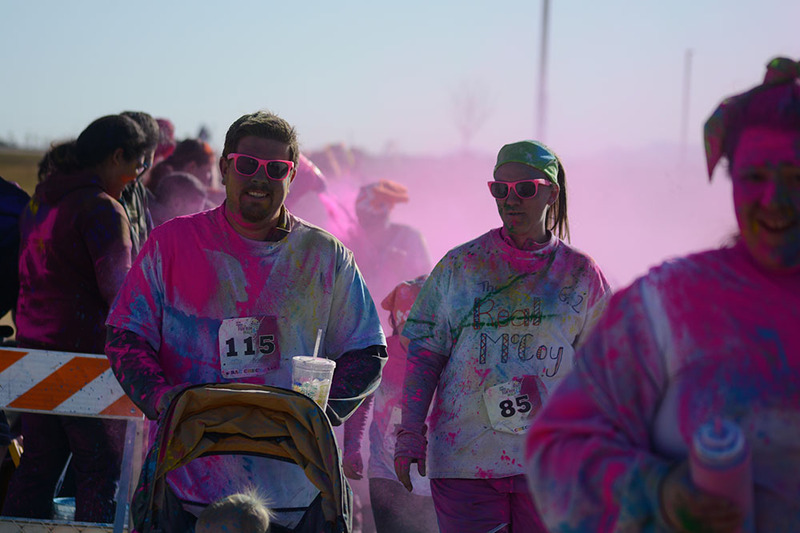 Can you find your photo in our gallery? A surprise carnival seemingly sprouted in Maricopa overnight. 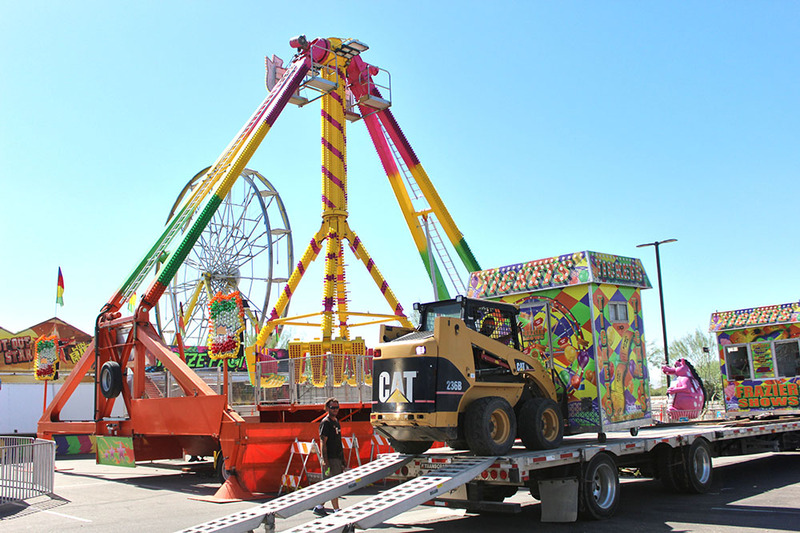 The carnival opens Thursday at 6 p.m. at Copper Sky’s south parking lot. 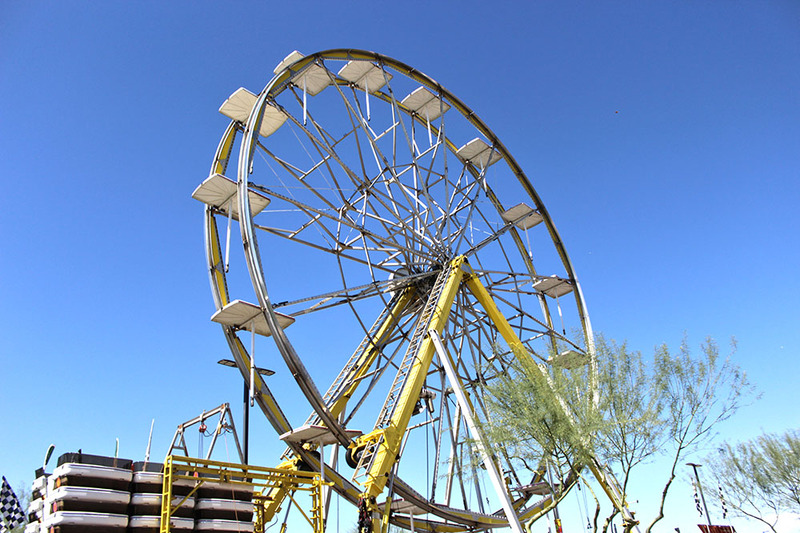 Valley-based carnival company Frazier Shows will run the carnival through Sunday. The event comes near the end of the first week of Stagecoach Days, a two-week celebration of Maricopa’s heritage. A promotional coupon shared on social media sparked excitement – and confusion – for residents earlier this week who said they were surprised by the short-notice of the event, and questioned whether a carnival was really coming. 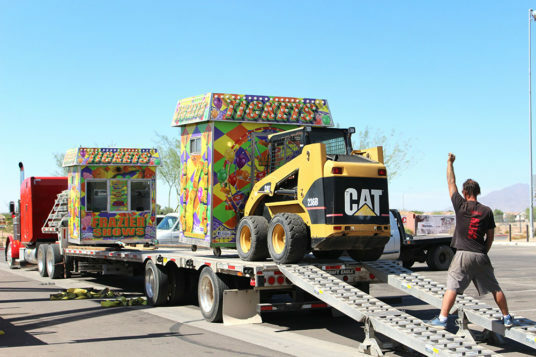 That rumor was laid to rest Tuesday when residents reported seeing carnival workers assembling rides at Copper Sky. 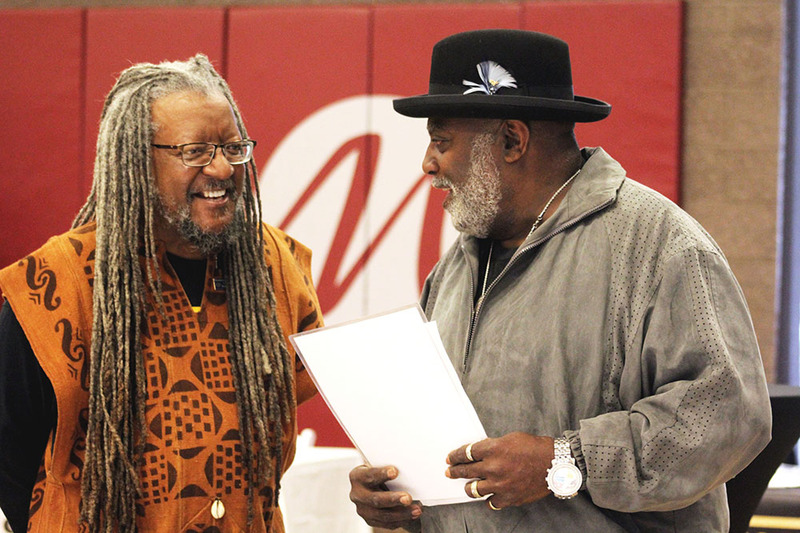 Interim Parks Director Fred Gray said a zoning hearing officer approved a temporary-use permit for organizers Tuesday night. Gray clarified the carnival is not a city-sponsored event, but a carnival that is occurring during Stagecoach Days. 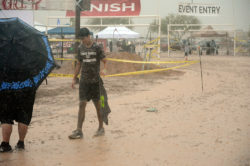 “This sort of started through the special-event process, then when it got further along with staff reviews about what was required with regard to parking and dust control mitigation, at some point during that process it was determined that it was better to issue a temporary-use permit as opposed to a special-use permit because it wasn’t a city-sponsored event. 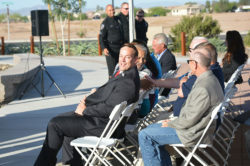 It was more of a rental, so that sort of delayed it,” Gray said. 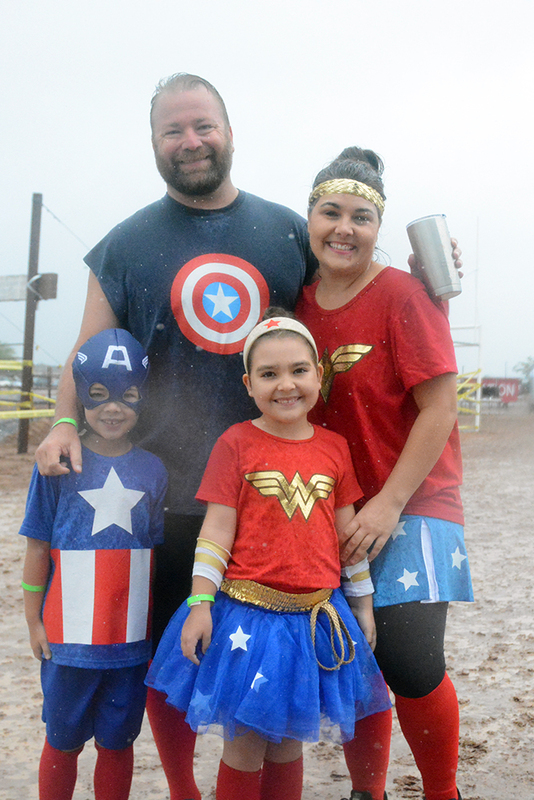 The city used to sponsor Stagecoach Days events in past years, but currently there is no central organizer for it. 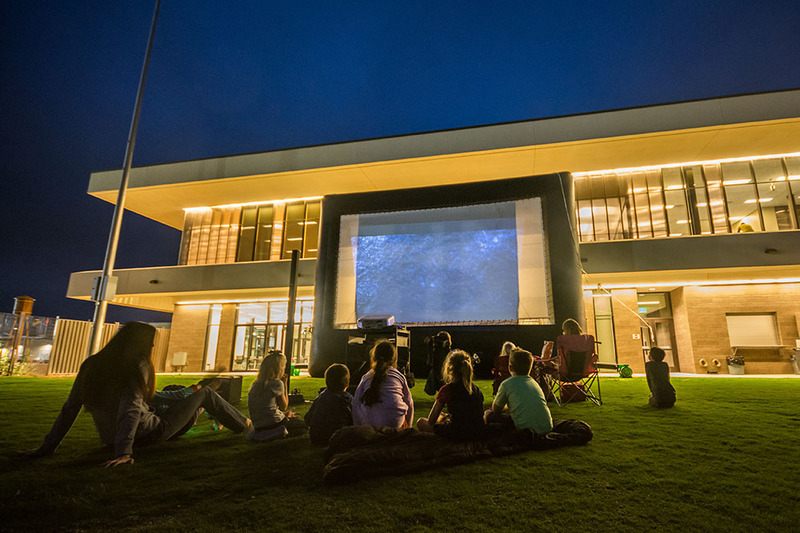 The city now promotes independent community events during the two-week period in October on its website. 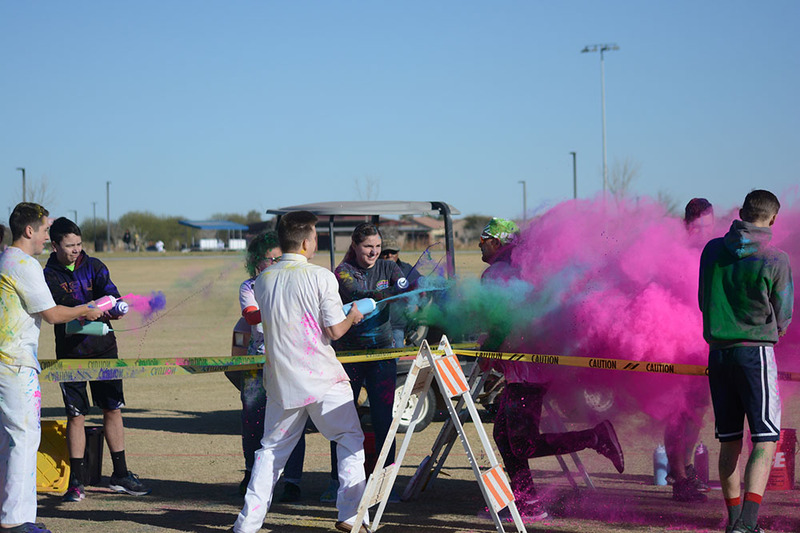 One coupon per person is required. 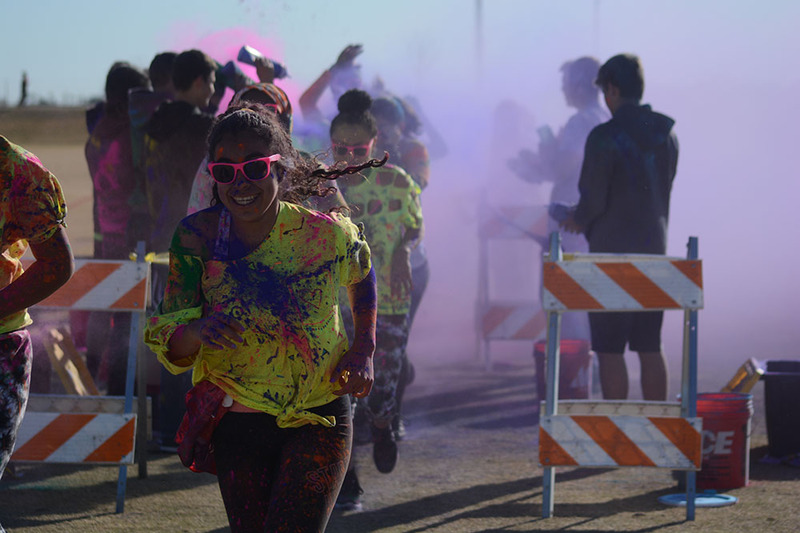 Wristbands are sold up to one hour before the special is over, according to an event flyer. 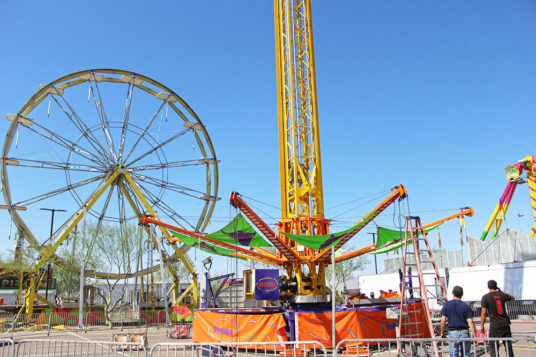 Visit the Frazier Shows Facebook Page for carnival coupons and more information. 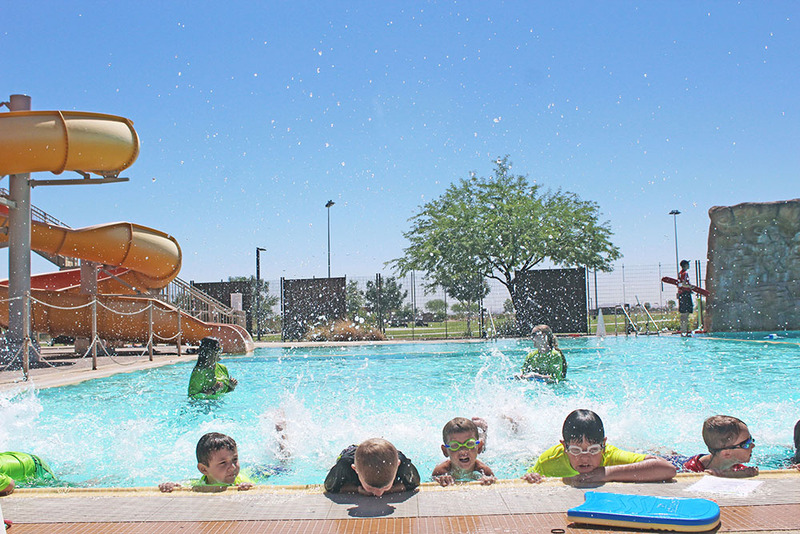 The City of Maricopa will host its first ever Labor Day Pool Party at Copper Sky this weekend. 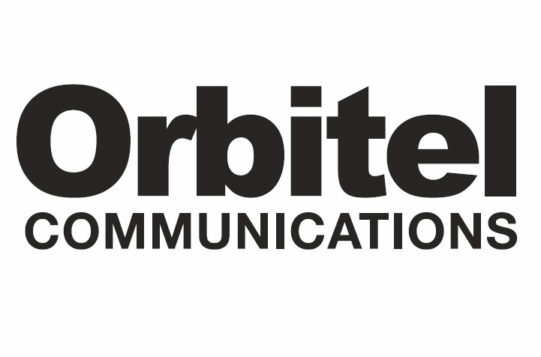 The celebration will take place a day before the official holiday on Sept. 3 from noon to 4:30 p.m.
Special Events and Marketing Manager for the city Niesha Whitman said Copper Sky members get in free. “We really wanted to recognize people who are already members and give them something fun to do outside of our normal routine,” Whitman said. 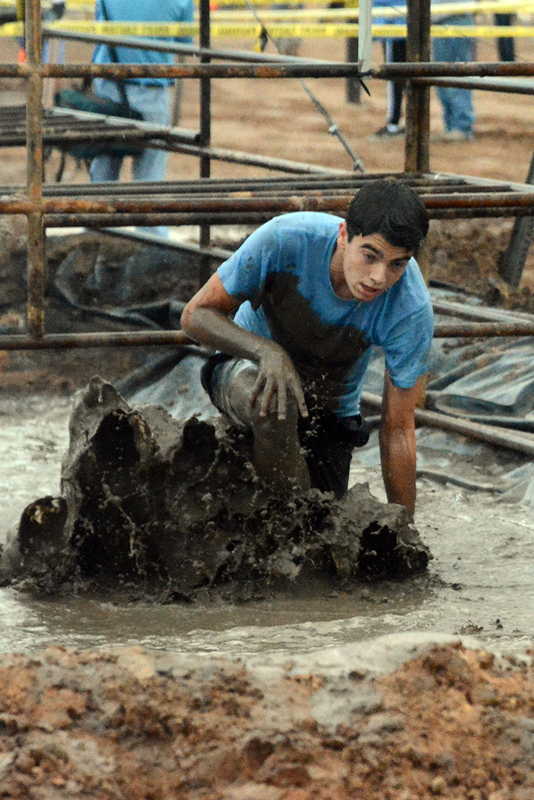 Admission for non-members is affordable, Whitman said. Children 17-years-old and under are $2; Adults are $4 at the door. During the end-of-summer event, a mix of music and swimming will be provided by the city. 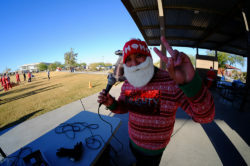 “We are going to have a DJ who is going to do some interactive songs like the limbo and the chicken dance,” Whitman said. 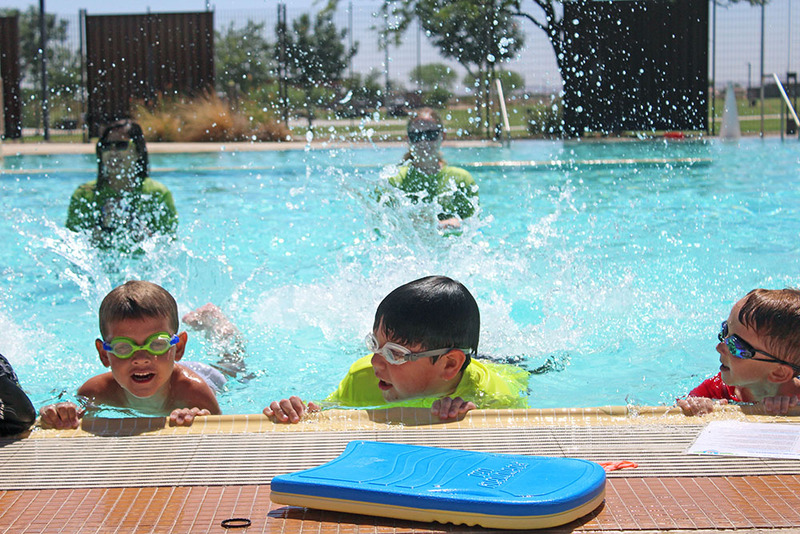 While working up an appetite in the pool and on the dancefloor, Helen’s Kitchen will sell kids’ meals for $4 each and adult meals for $8. 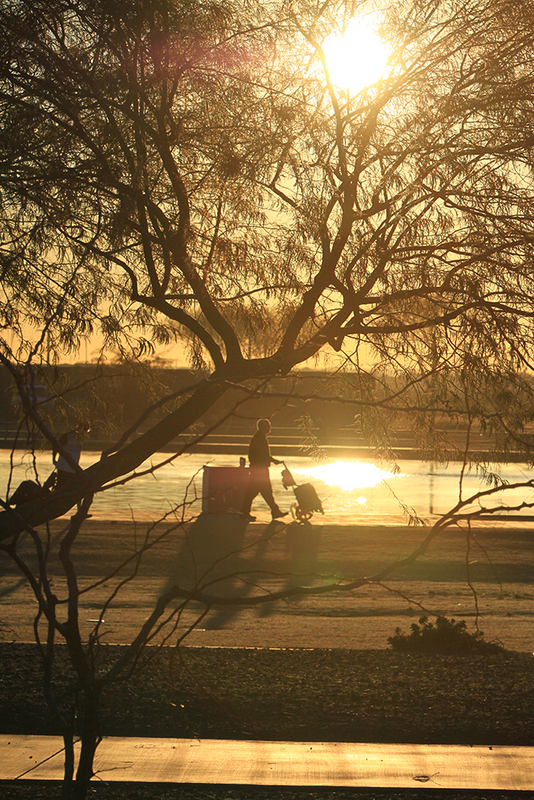 Sunday is slated to be a trademark summer day for Maricopa. 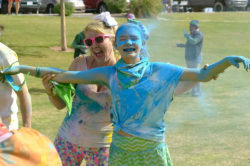 The National Weather Service forecasts the day of the party to be mostly sunny with a high of 106 degrees. 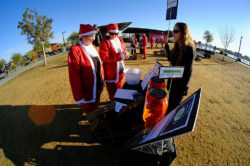 Helen’s Kitchen will also provide a customizable snow cone bar at the event for $2. “We will have all the different flavors available so the kids will be able to make their own,” Whitman said.